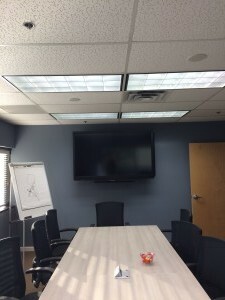 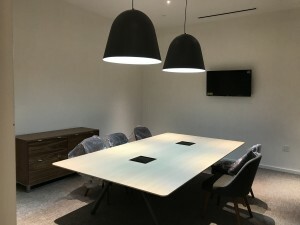 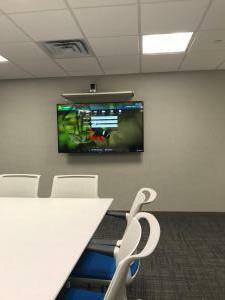 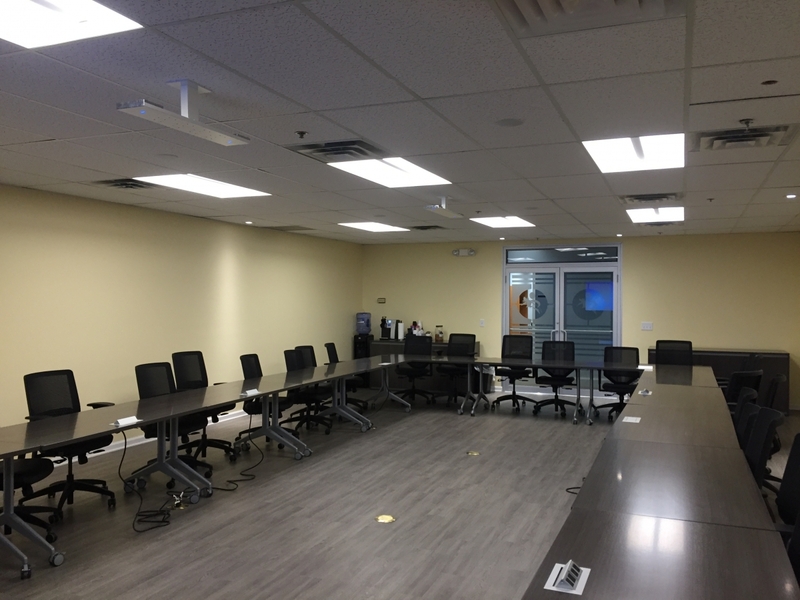 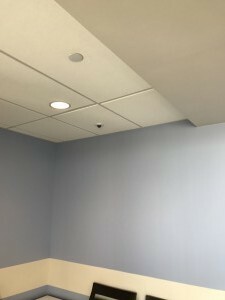 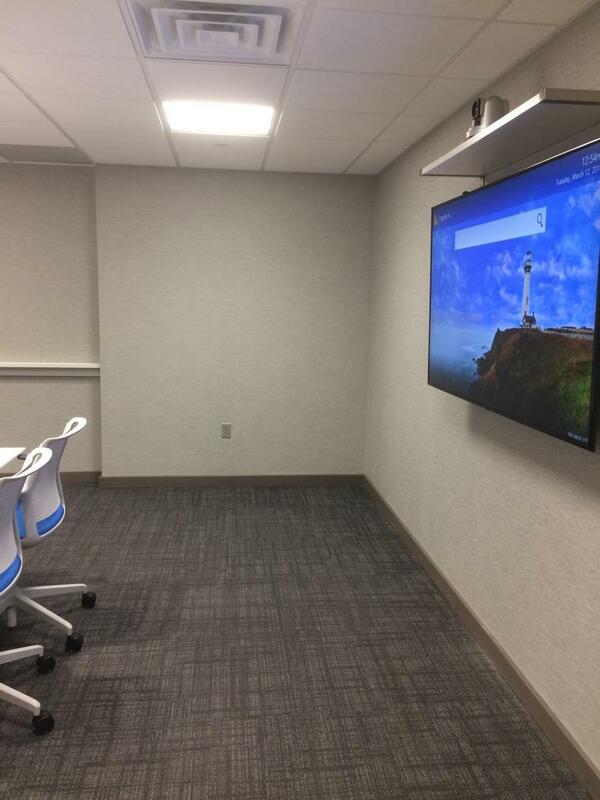 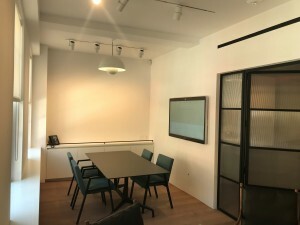 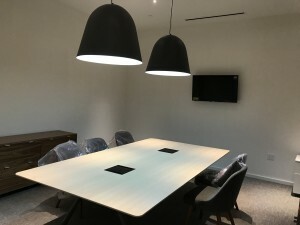 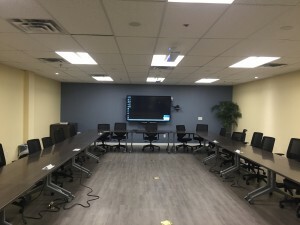 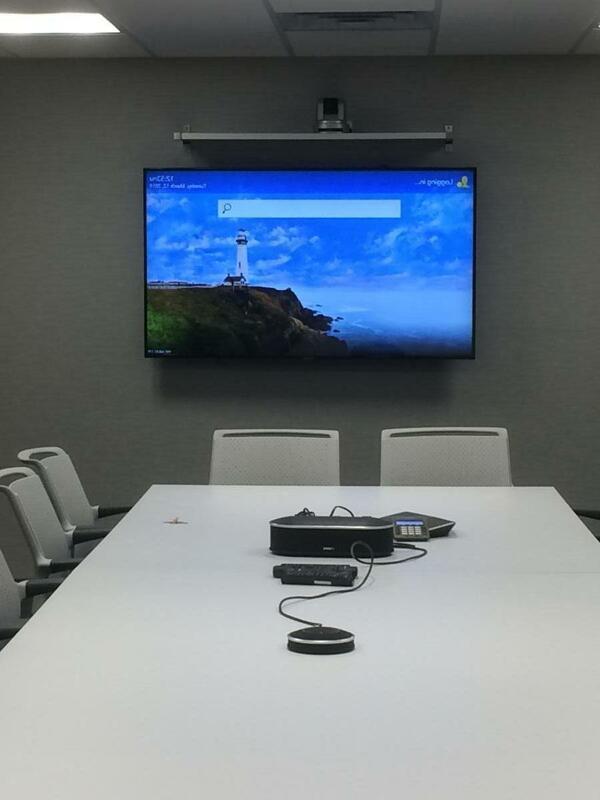 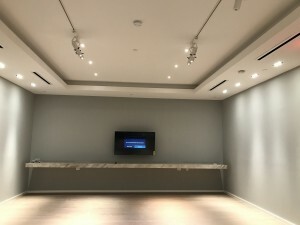 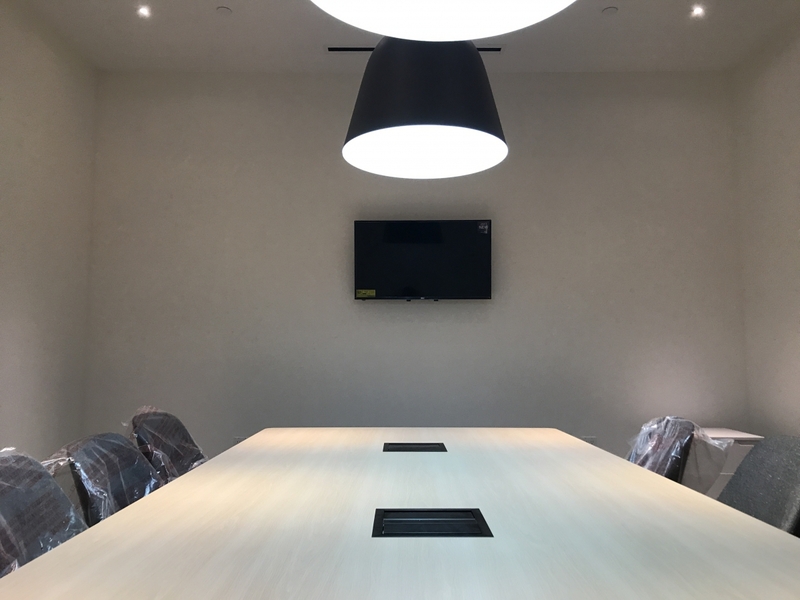 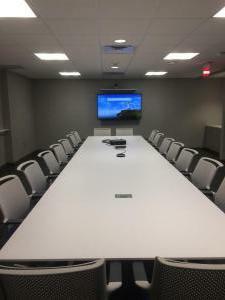 Installation Gallery – XS Applied Technologies Inc.
XS installed a complete video conferencing system for a conference room center. 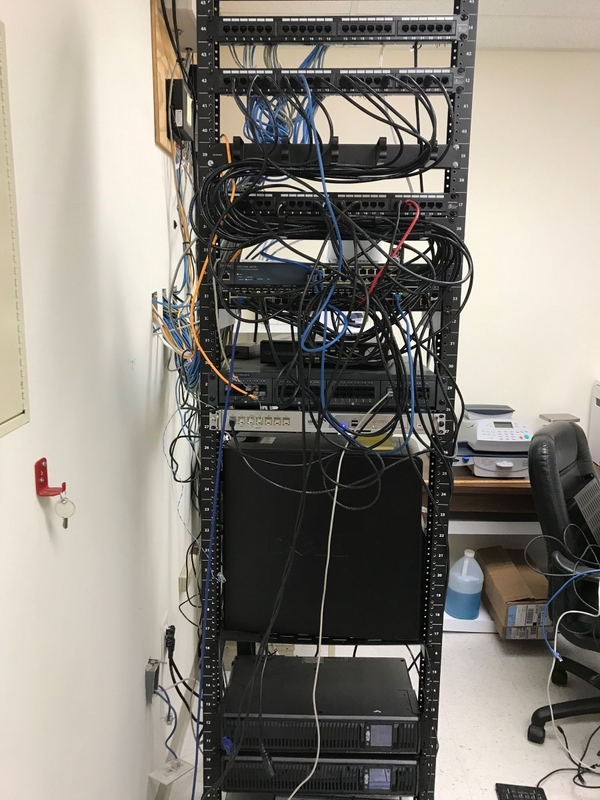 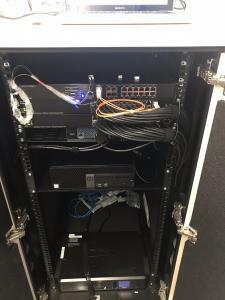 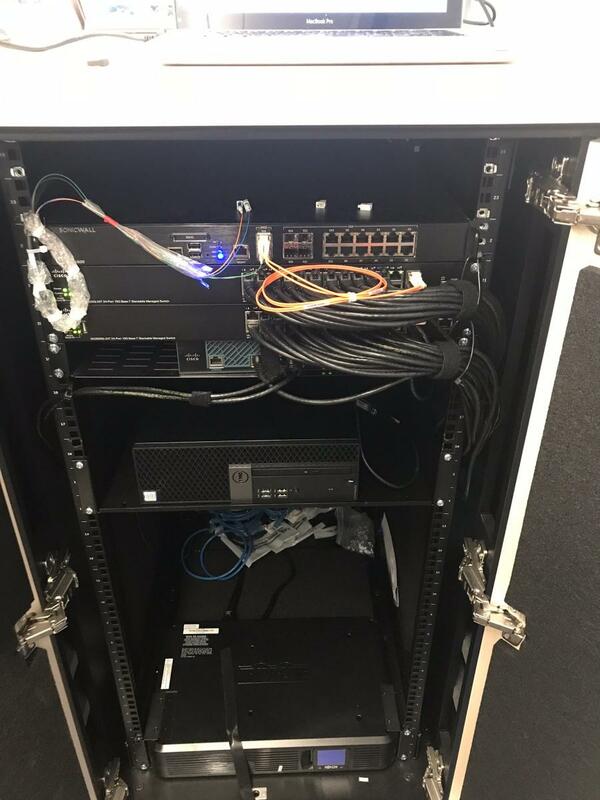 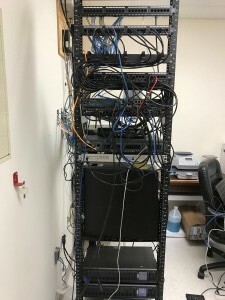 The build out included all furnishings, Wifi, in ceiling speakers, wireless microphone, 20X zoom web camera and the brains of the operation a computer in the IT closet behind the conference room. 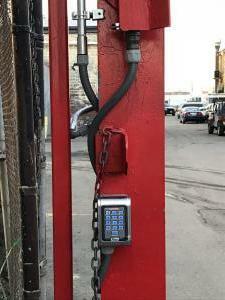 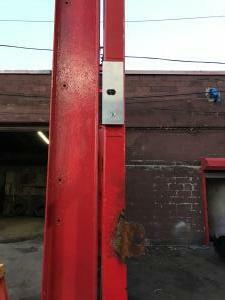 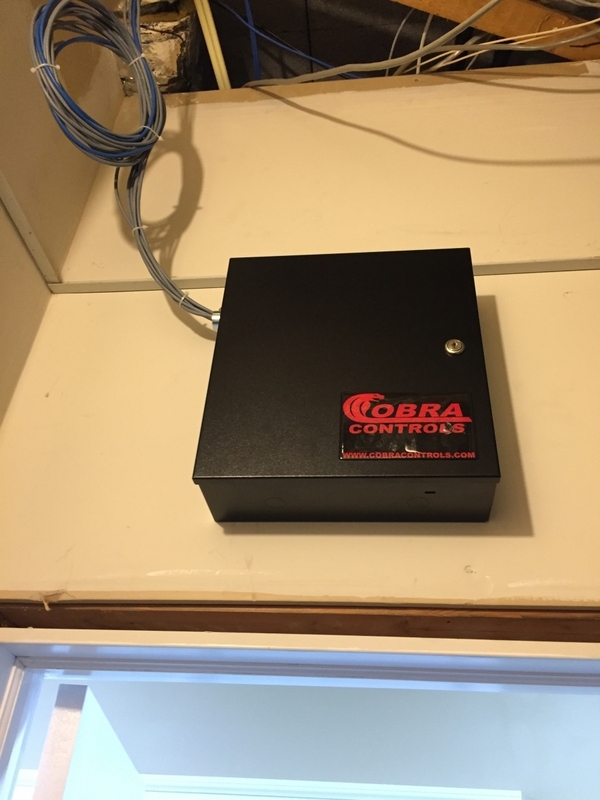 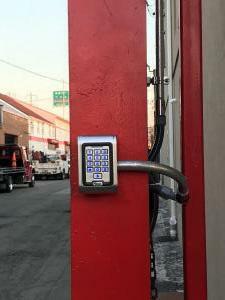 We installed a Cobra Controls 1500 lb weather proof mag lock with dual access keypads. 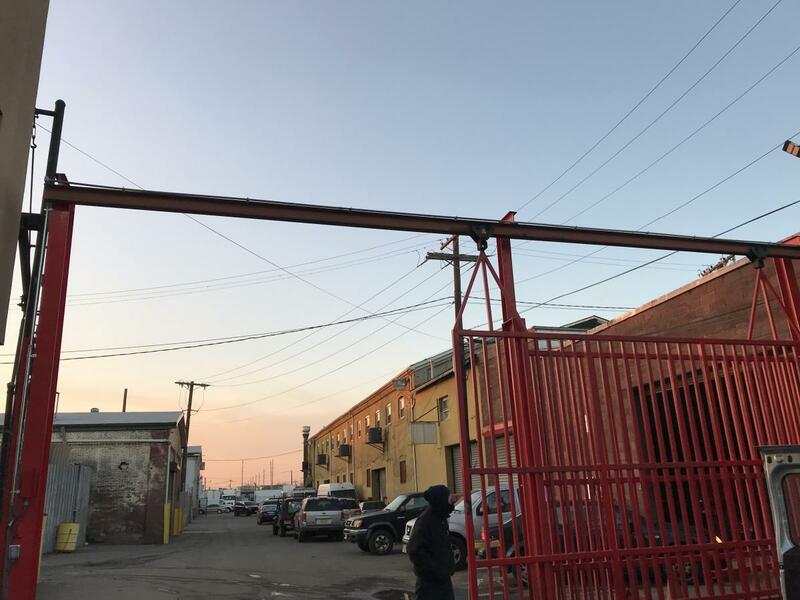 The gate was made of structural I beams, forty feet long by twenty five feet high. 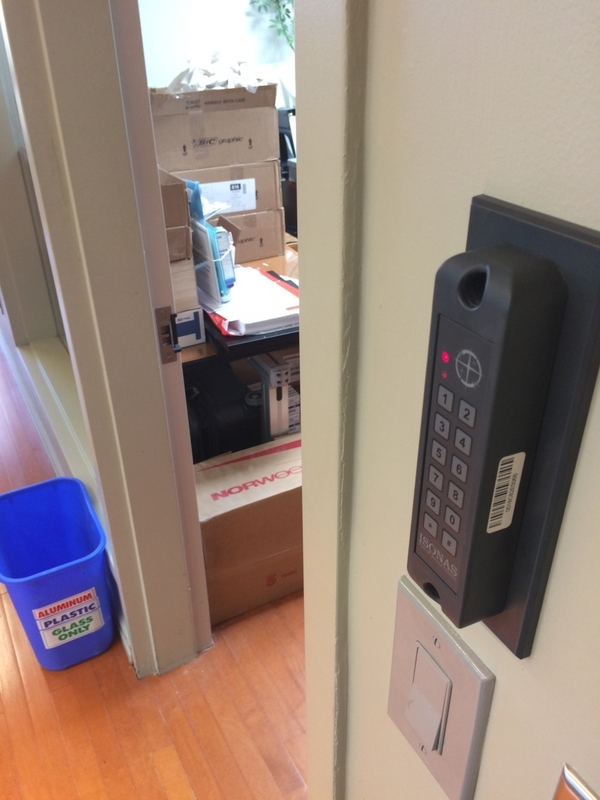 We ran conduit from the keypads to the control panel inside the building. 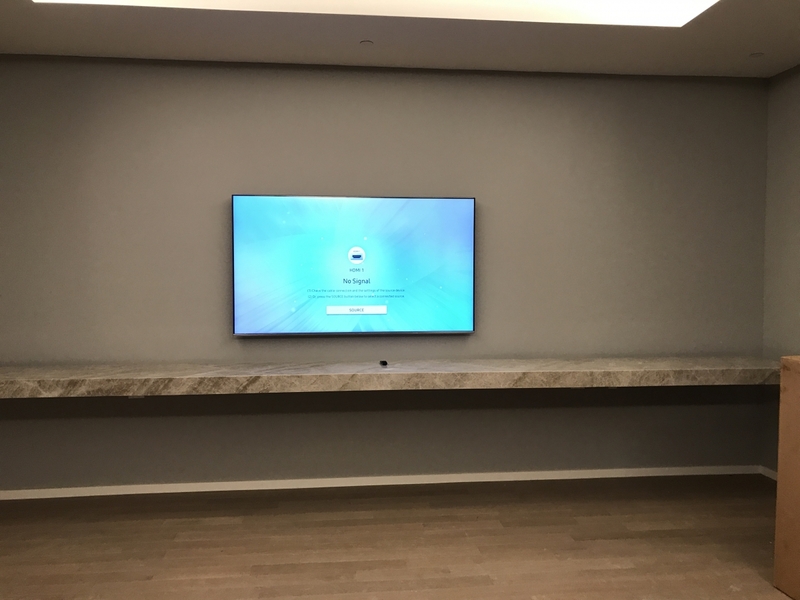 We installed multiple touch screen Sharp TV’s and along with a Yamaha speaker system and a few Sonos sound bars. 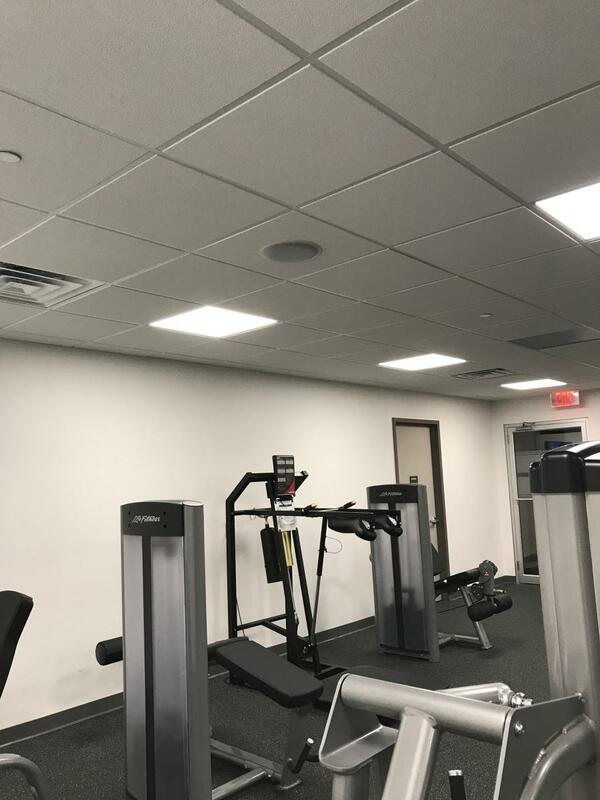 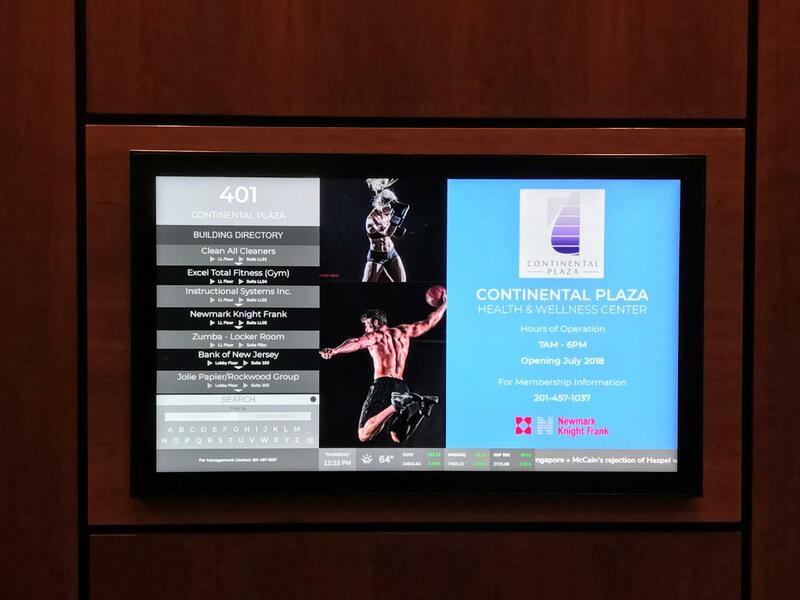 We also installed and configured a Wireless network throughout the building for use in the conference center and gym. 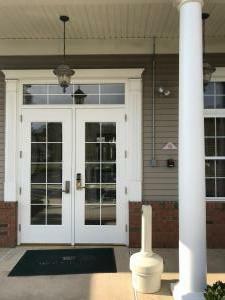 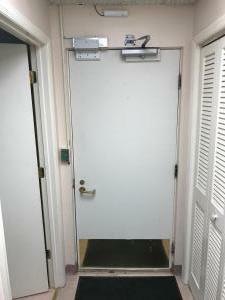 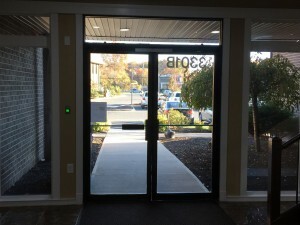 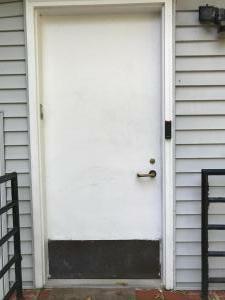 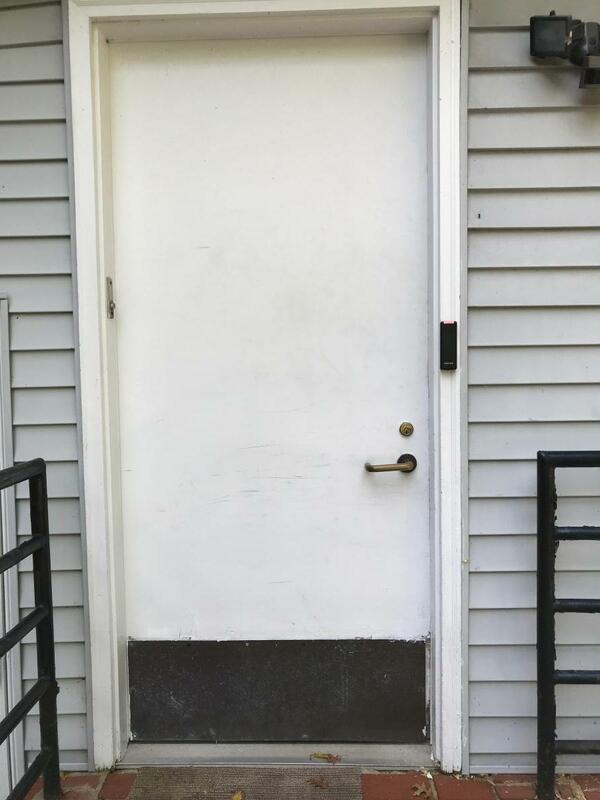 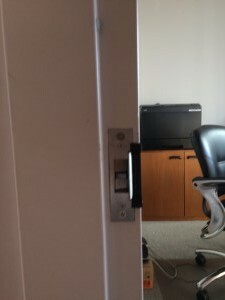 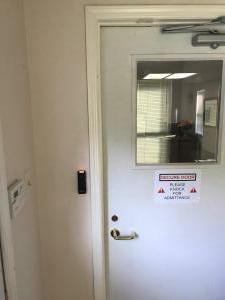 We are installing a multi door access control system in central Jersey. 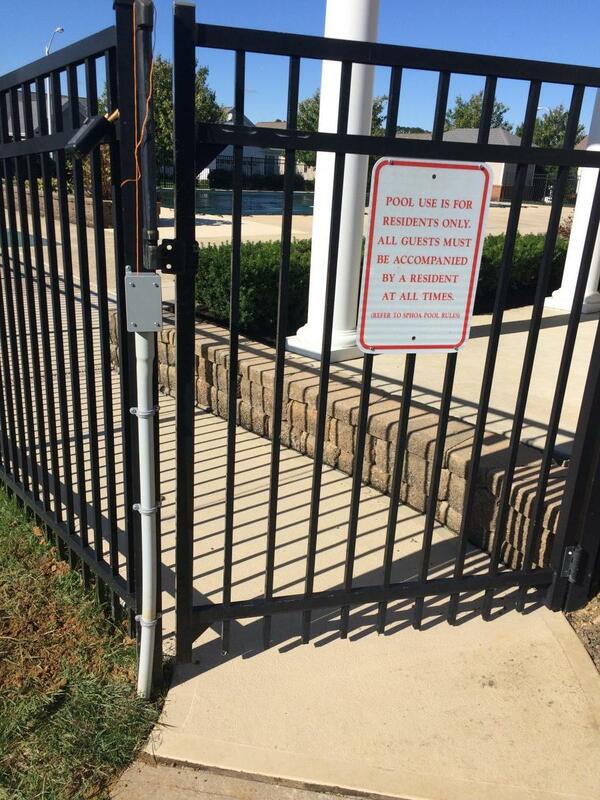 The site is a HOA club house and pool gate. 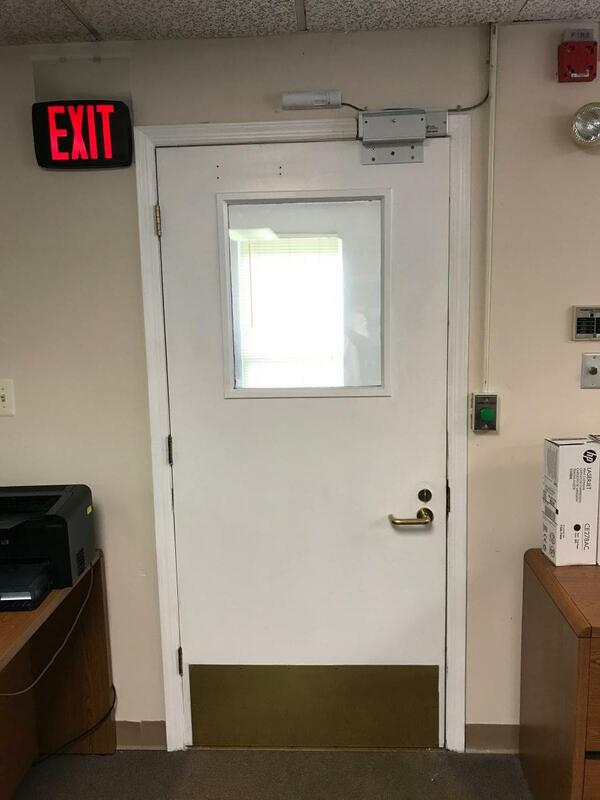 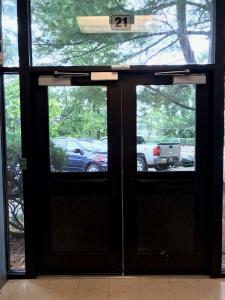 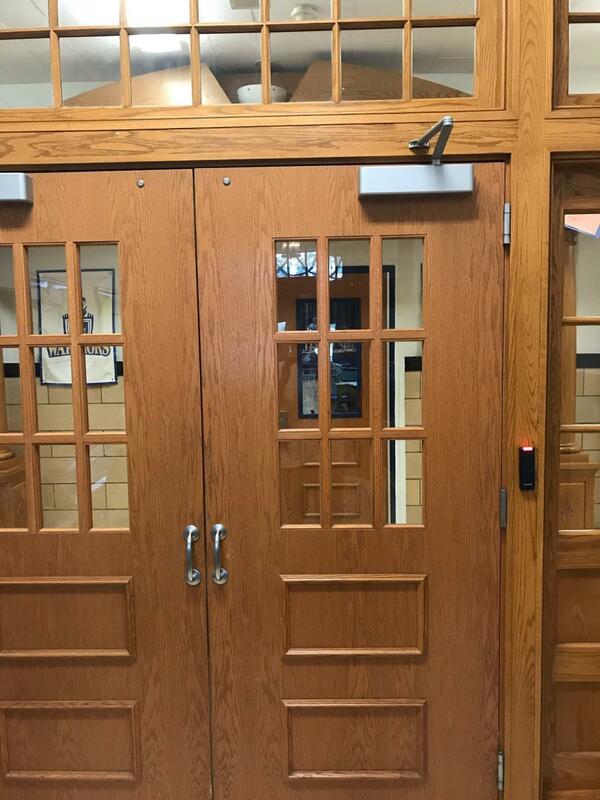 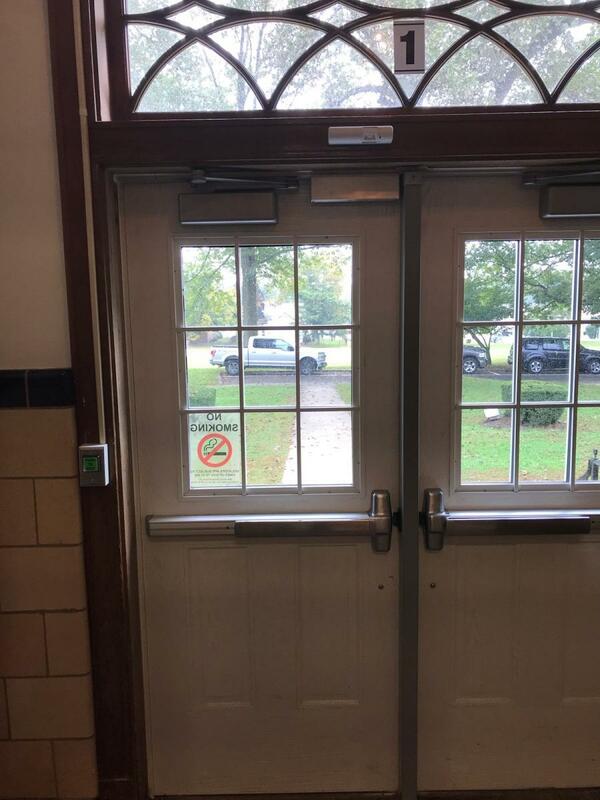 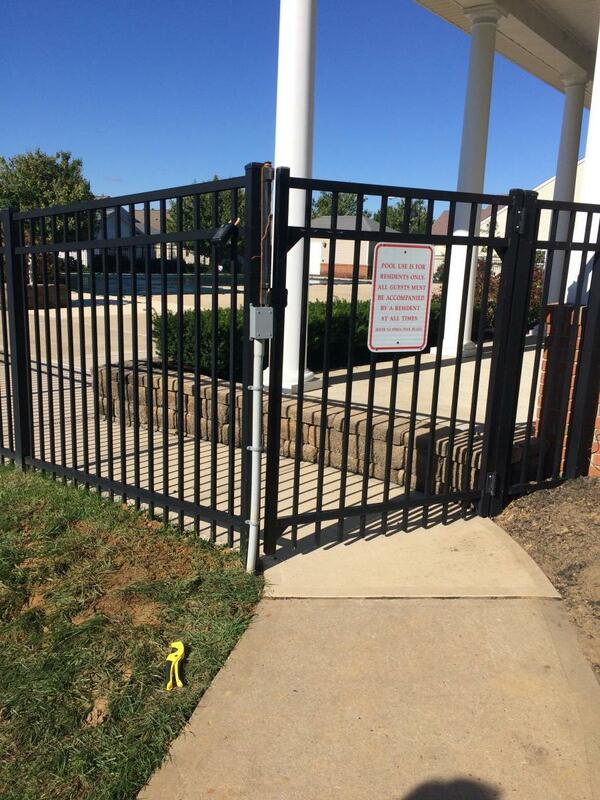 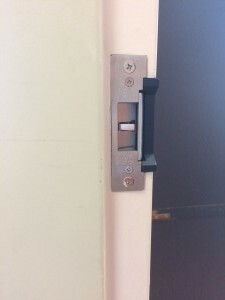 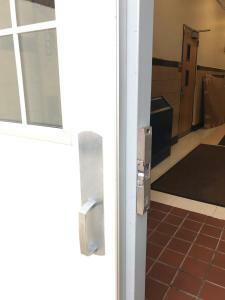 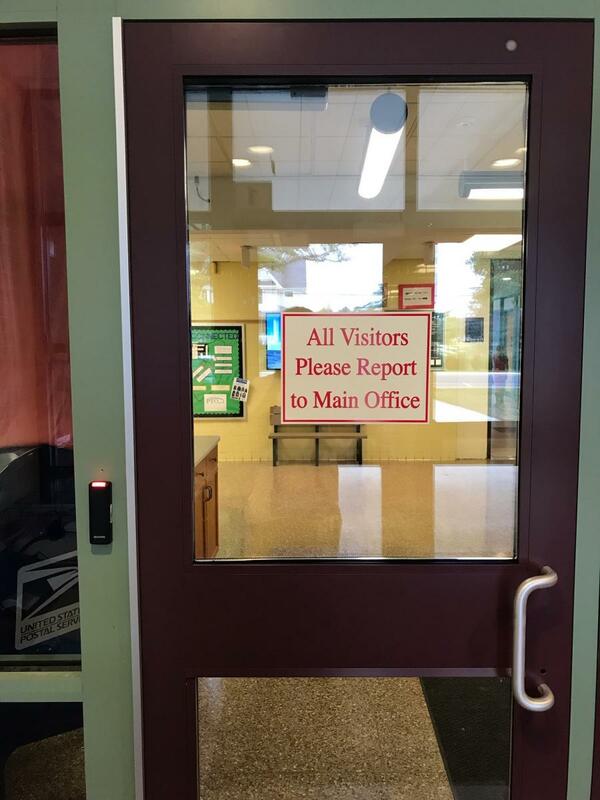 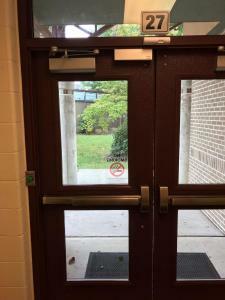 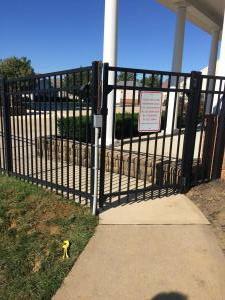 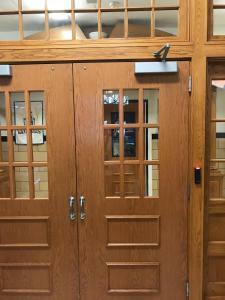 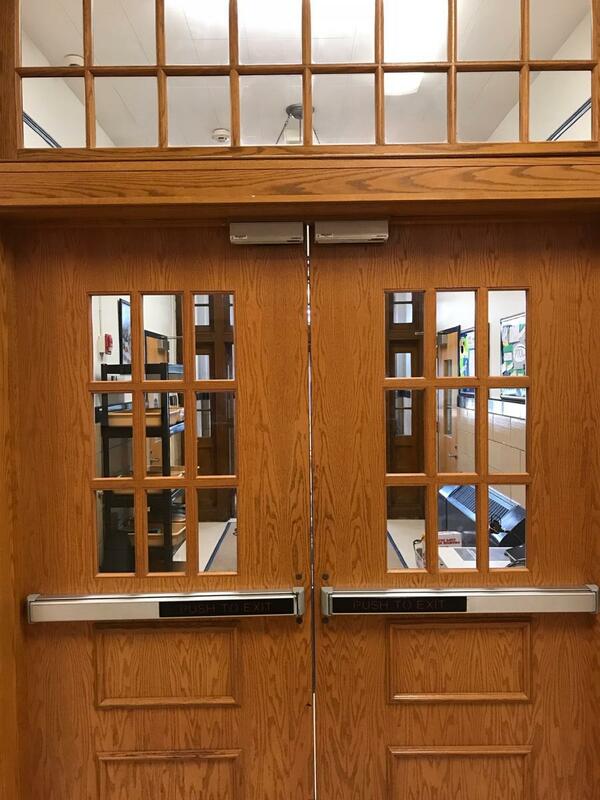 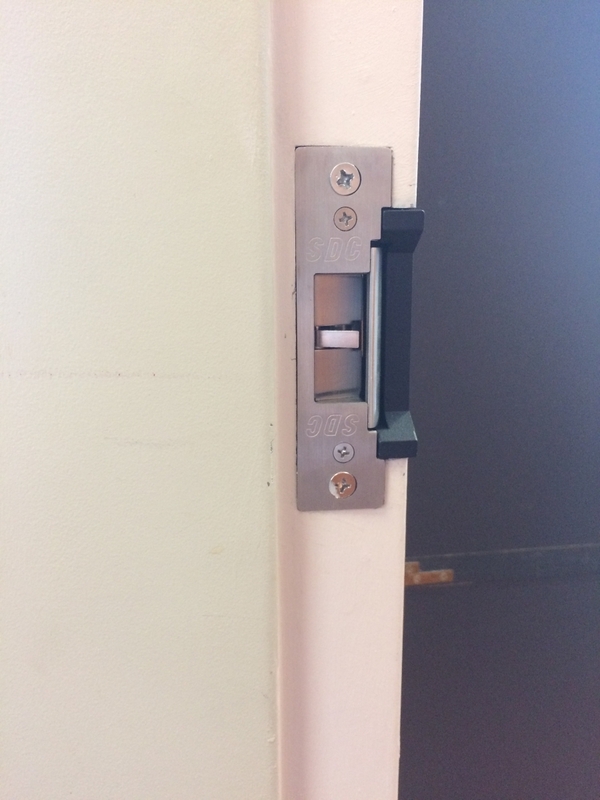 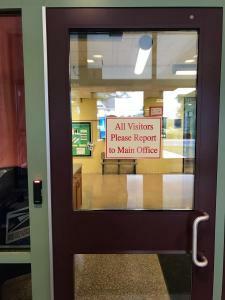 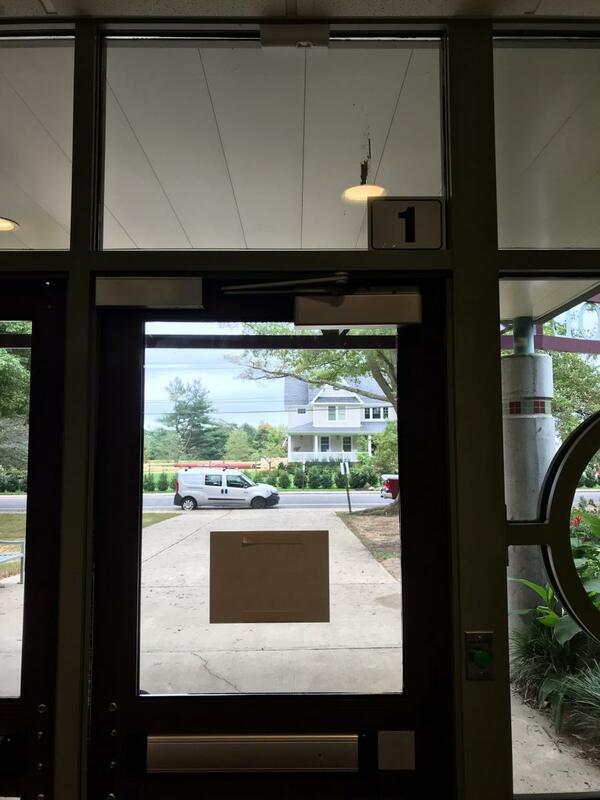 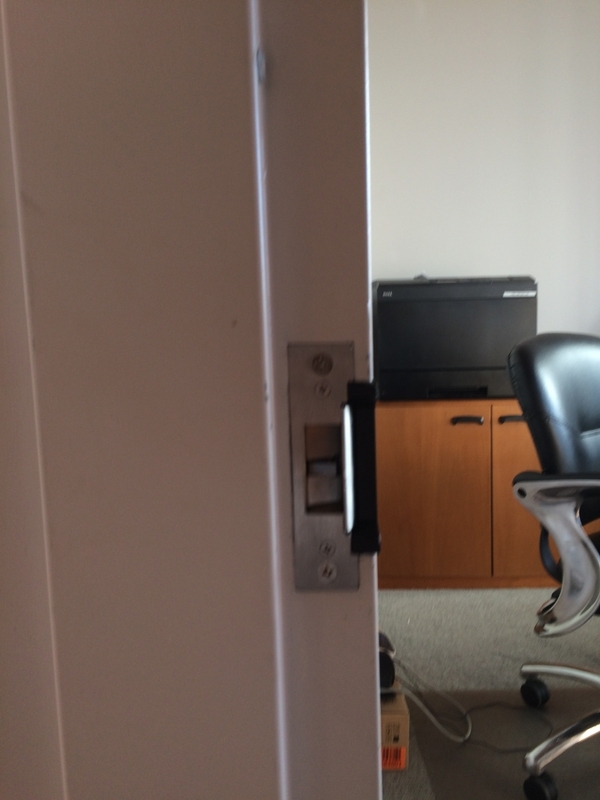 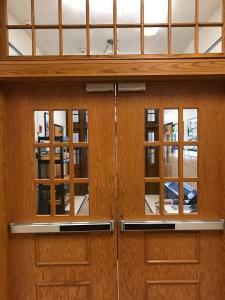 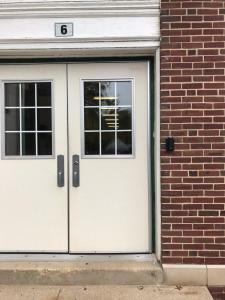 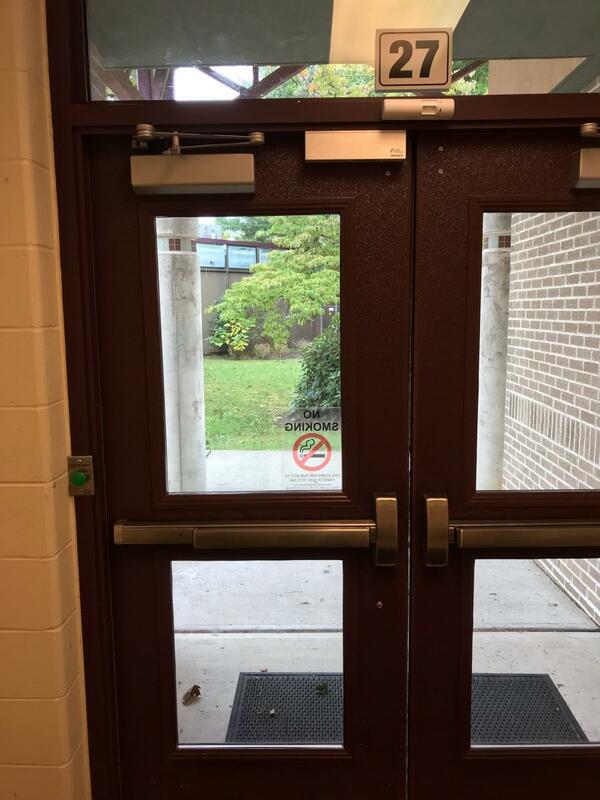 We installed 13 Isonas Access Control doors in two schools and the board of ED. 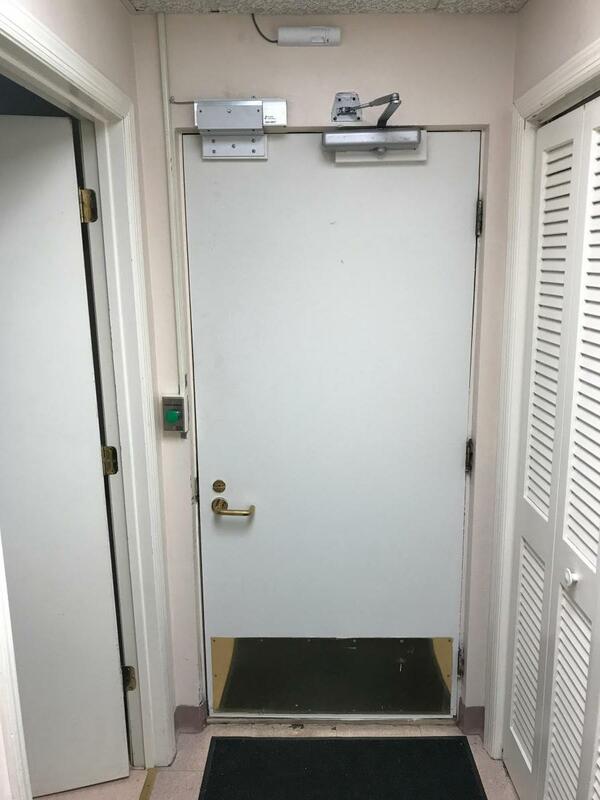 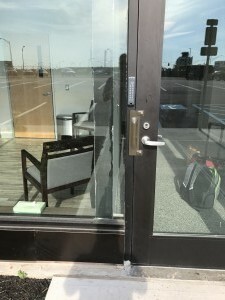 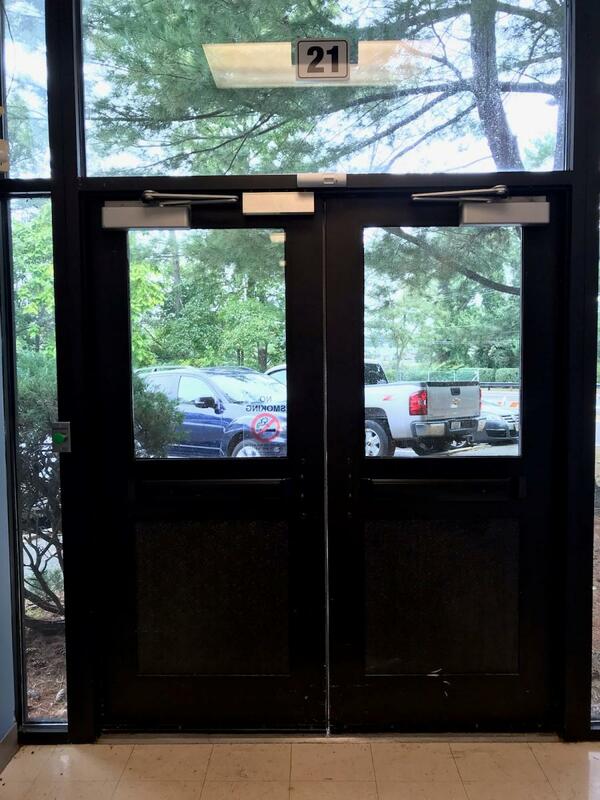 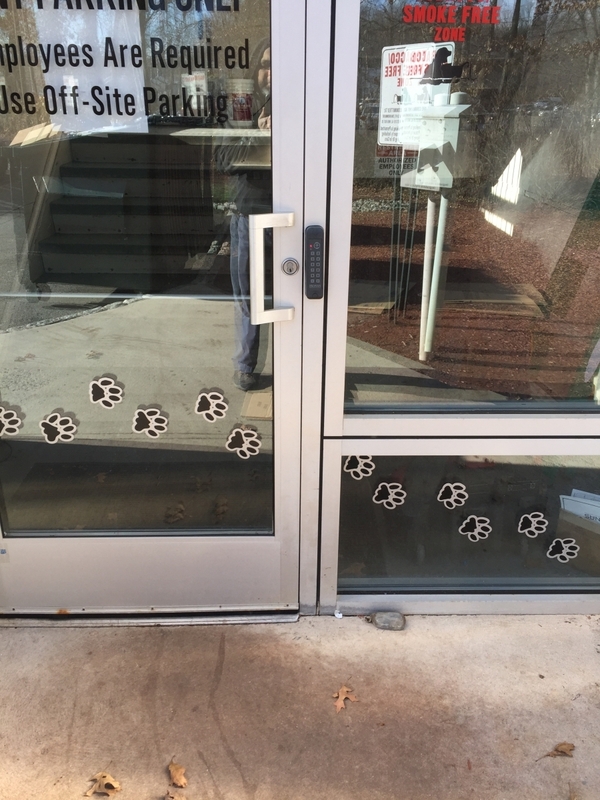 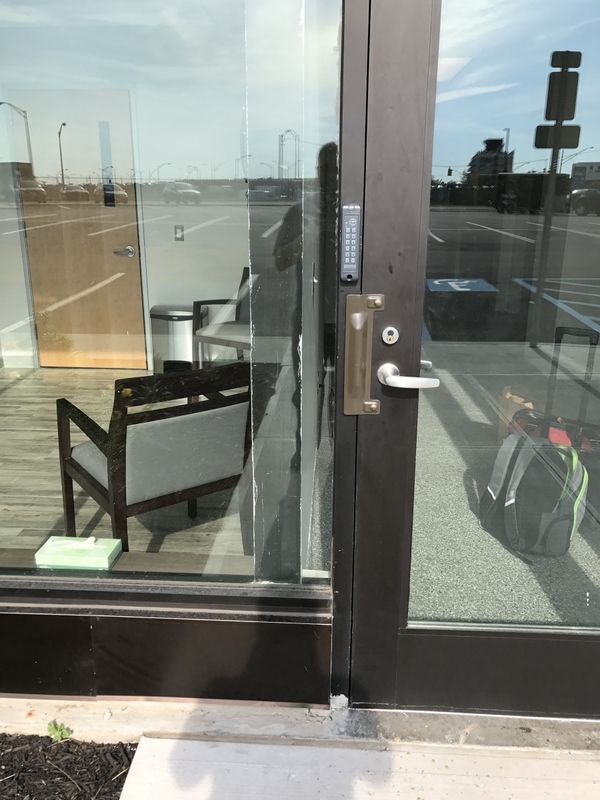 All doors are setup with Mag-locks and a state of the art cloud based badge management system That allows for centralized management of personnel for multi site setups. High tech design firm in Palo Alto, California. 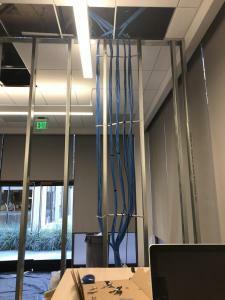 We ran 60 network drops with a capacity to handle 10 Gbe network speeds. 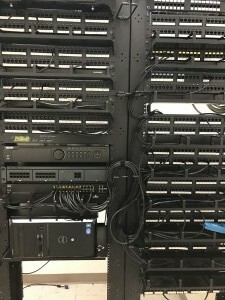 We also install a SonicWall 6500 router and a 3 unit 10 Gbe stack from Cisco. 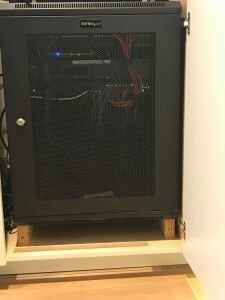 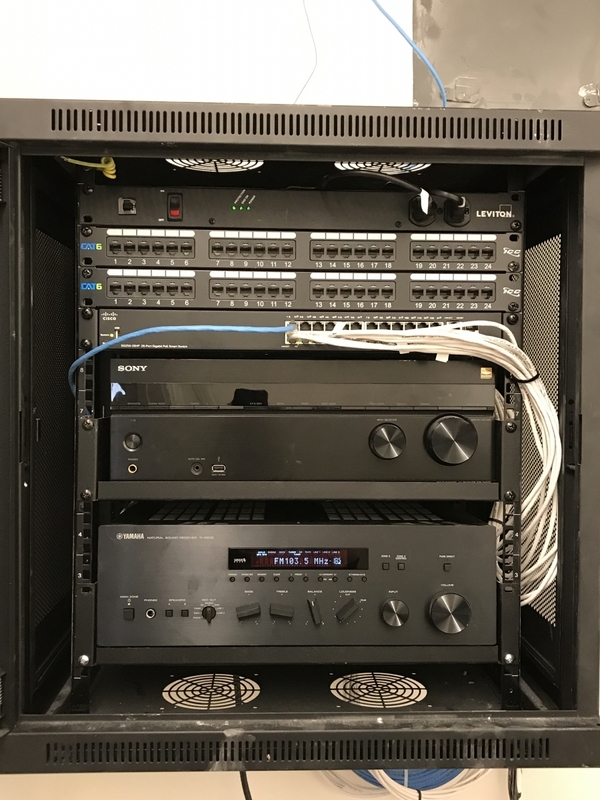 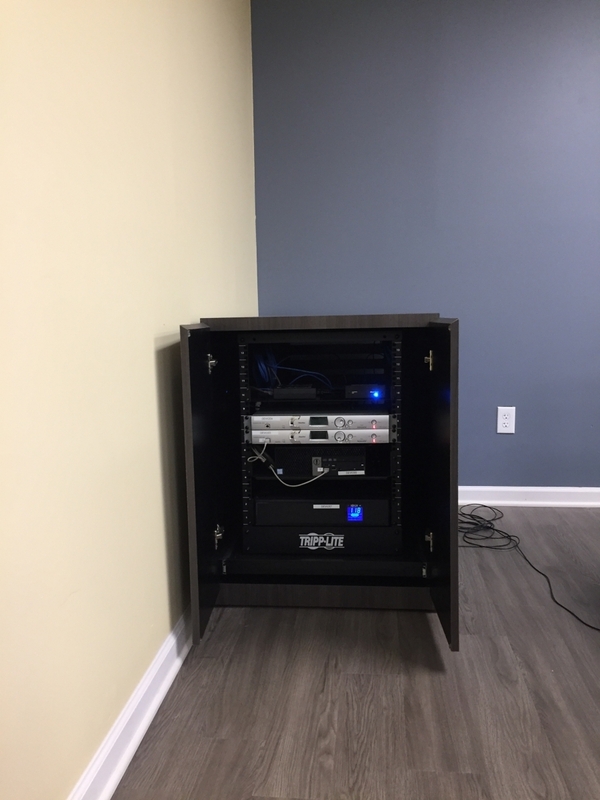 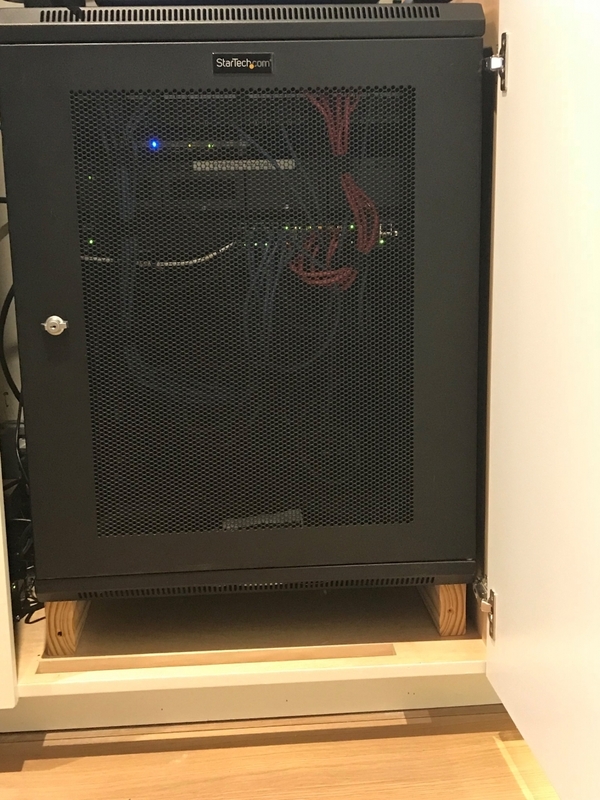 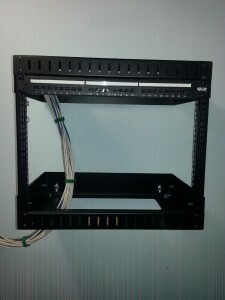 All installed in a custom vented and sound proof rack cabinet. 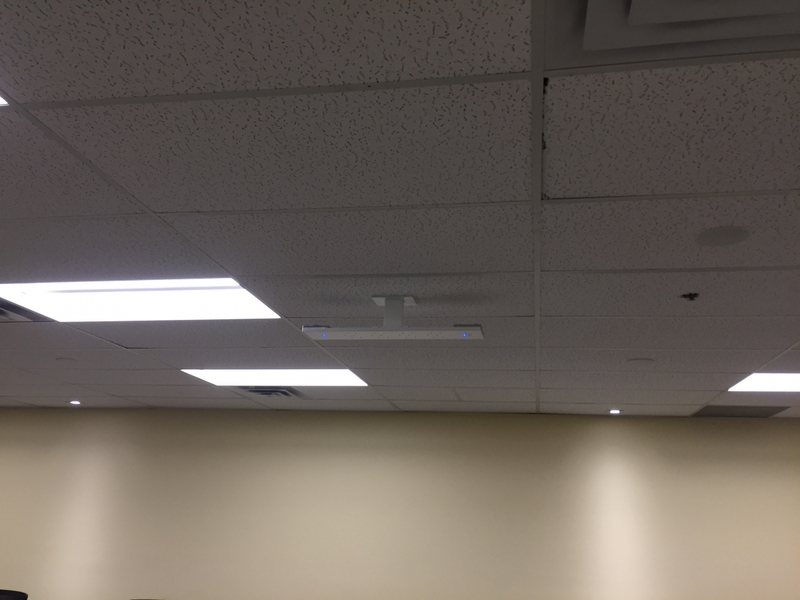 We also installed and configured a Cisco wireless controller and two WAPS. 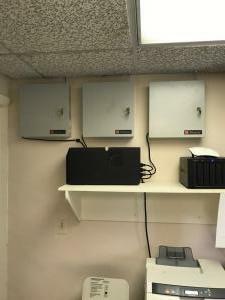 This is a small law office in Red Bank with 30 voice and data drops a complete server rack setup and migration and a 10 handset phone system. 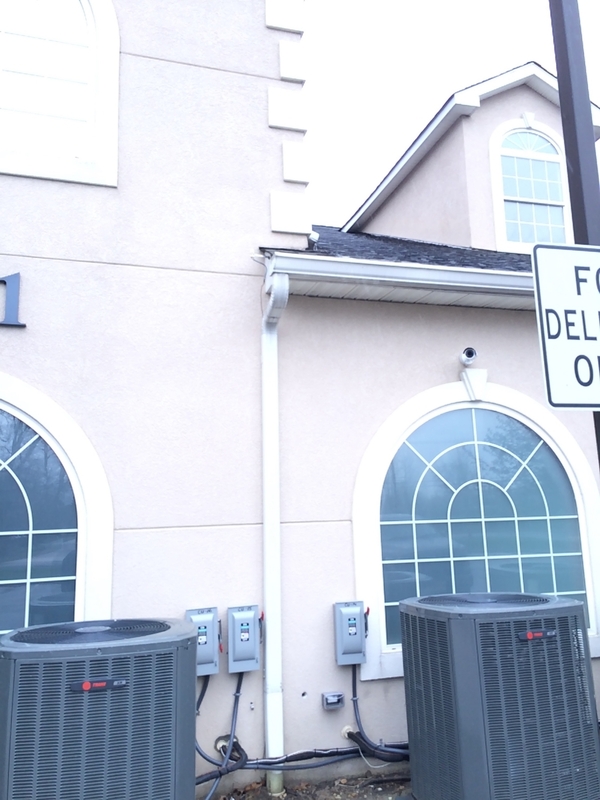 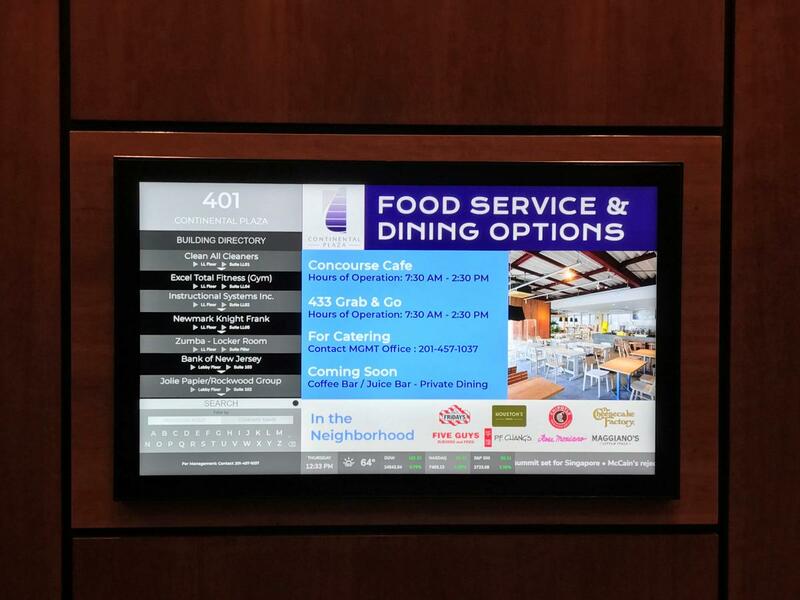 We installed interactive building directories for a client in Hackensack, NJ. 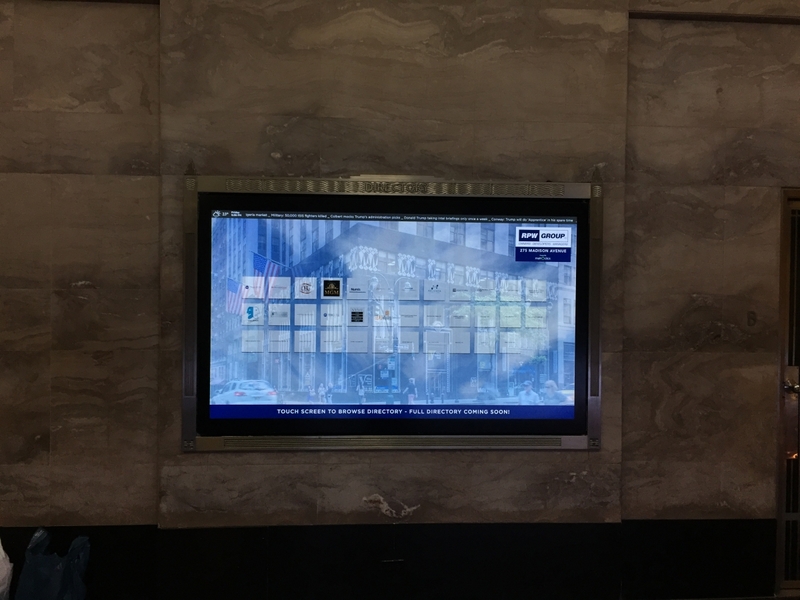 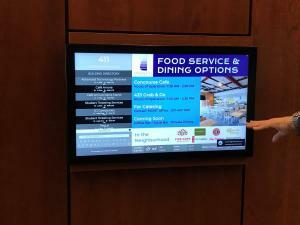 We removed the existing smaller 15″ monitors and installed 43″ touch screens to make this directory truly interactive. 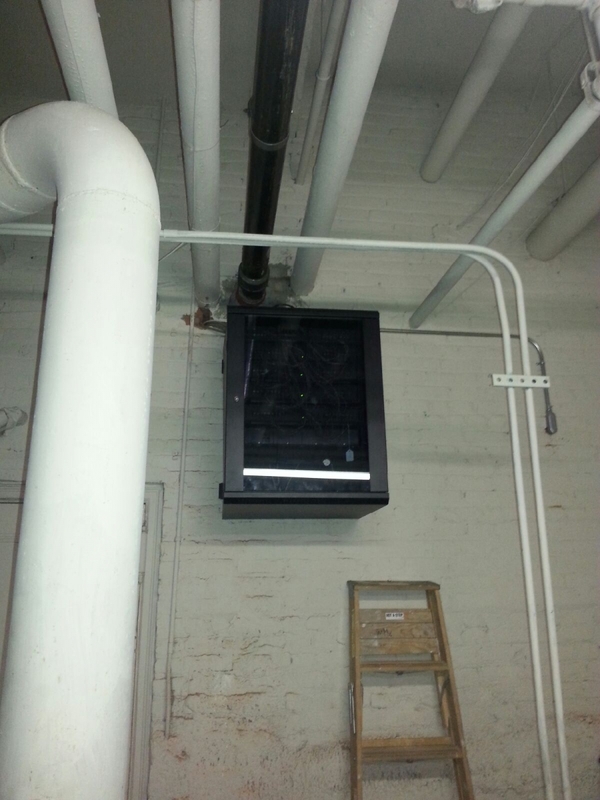 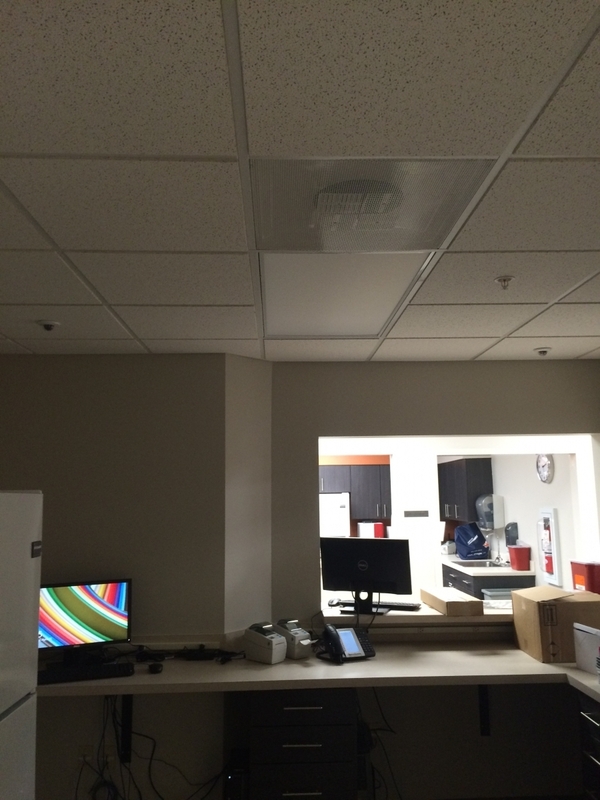 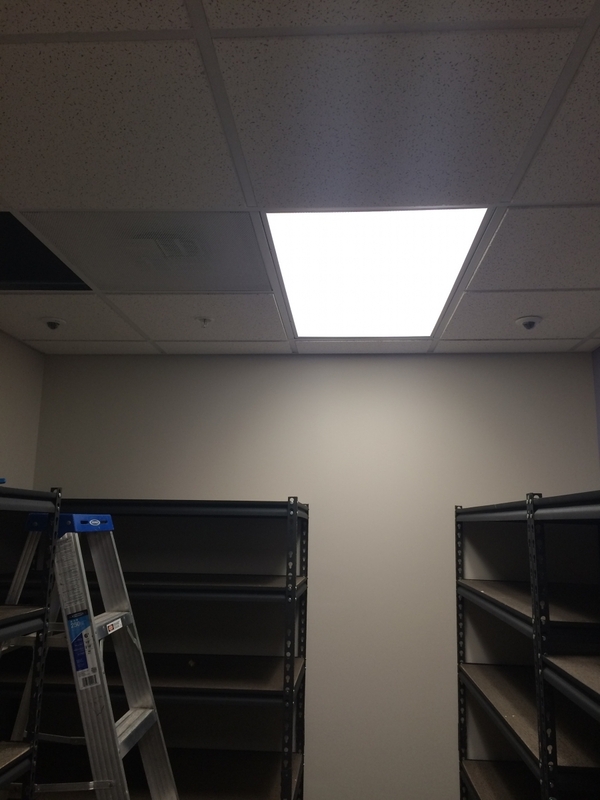 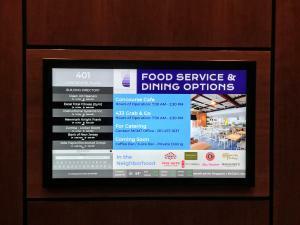 We installed a total of 5 directories 3 43″ and 2 55″ in multiple buildings. 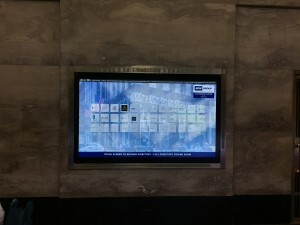 Each monitor is controlled by a micro PC which is then updated and monitored by our friends at MetroClick.com. 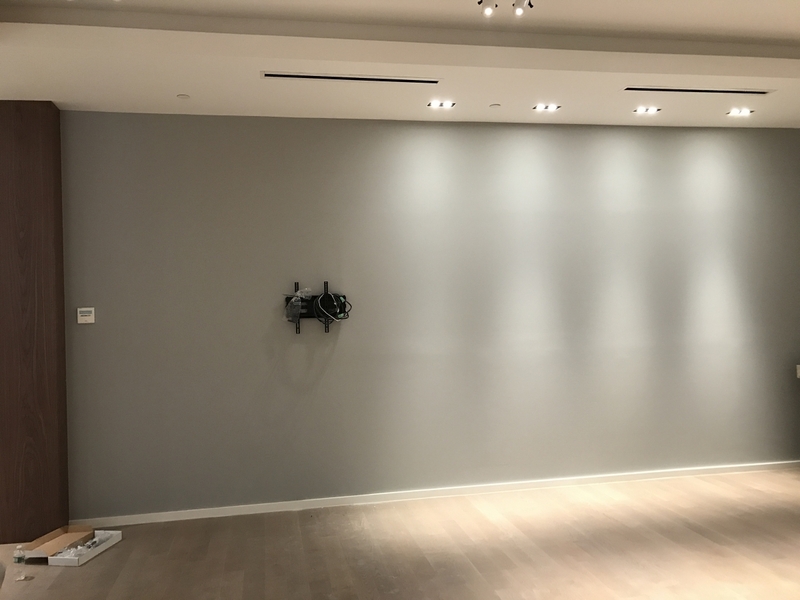 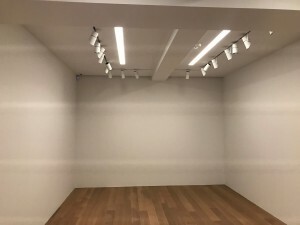 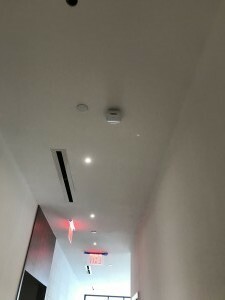 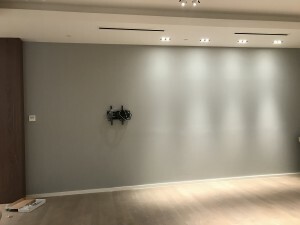 Voice and Data installation for an Art Gallery in Manhattan. 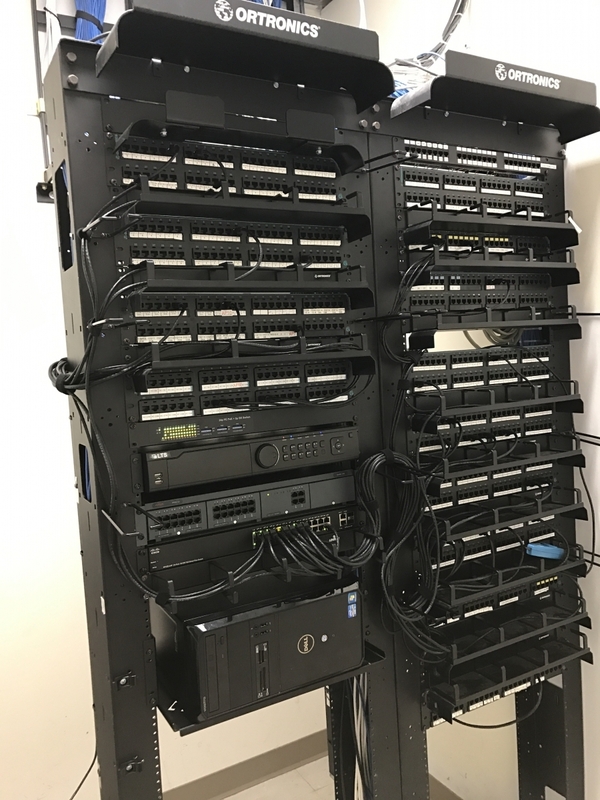 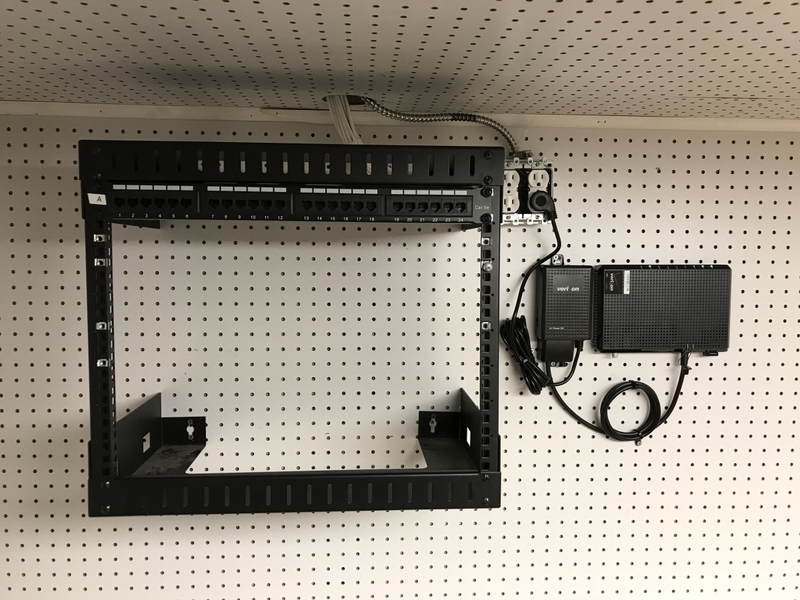 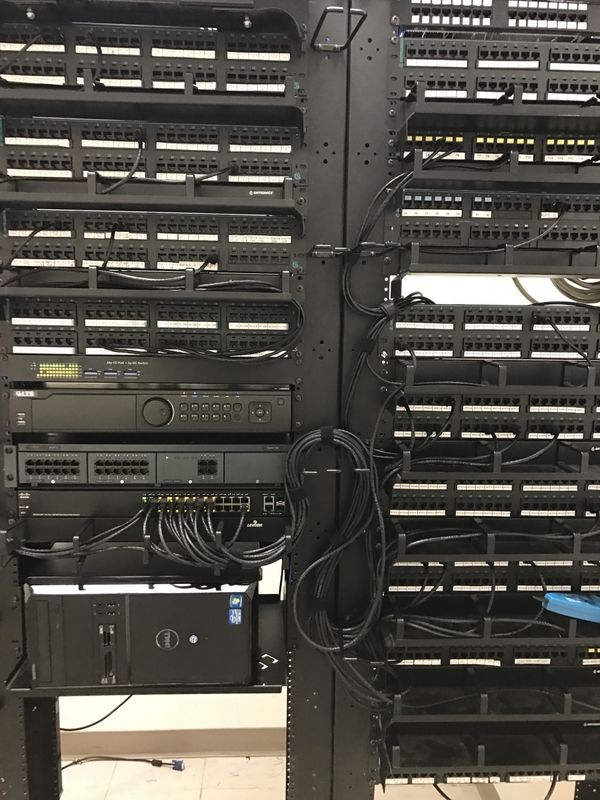 We terminated all 60 plus drops, installed Cisco Switches, W.A.P.S and a Cisco Spark Board. 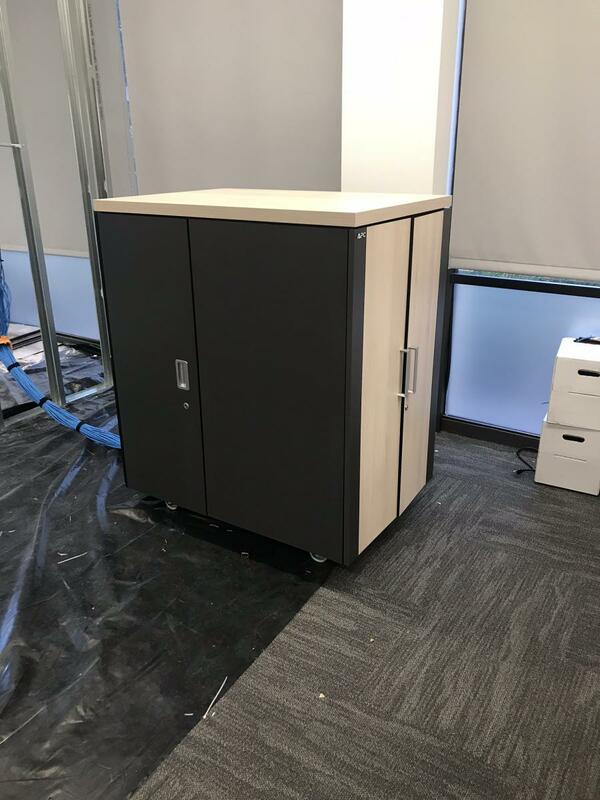 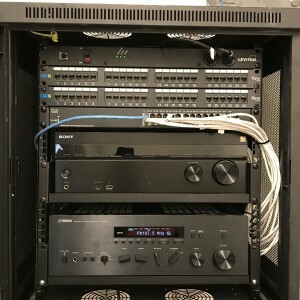 We also installed an Avaya IP office phone system with connections to HQ in the UK. 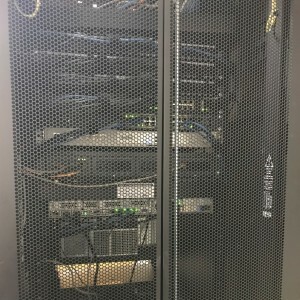 We disassembled the old rack and put in a new 42U enclosed rack. 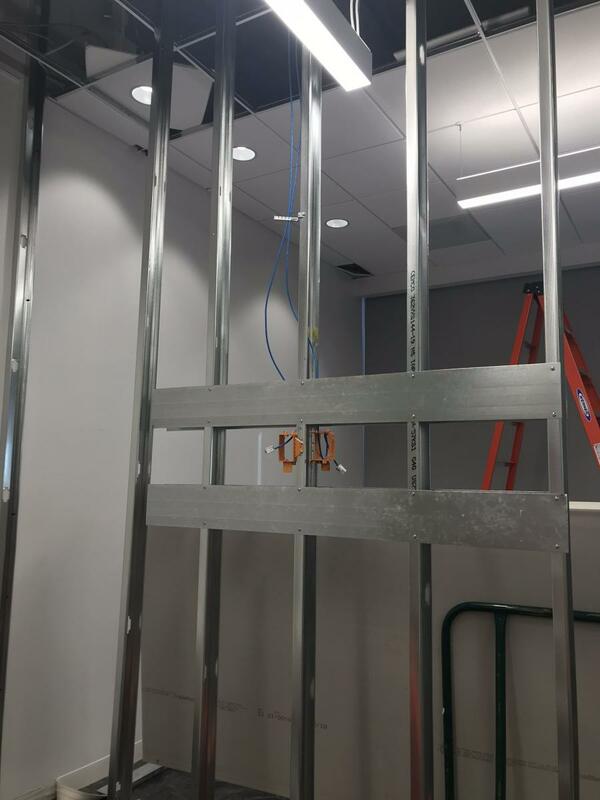 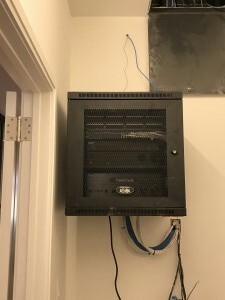 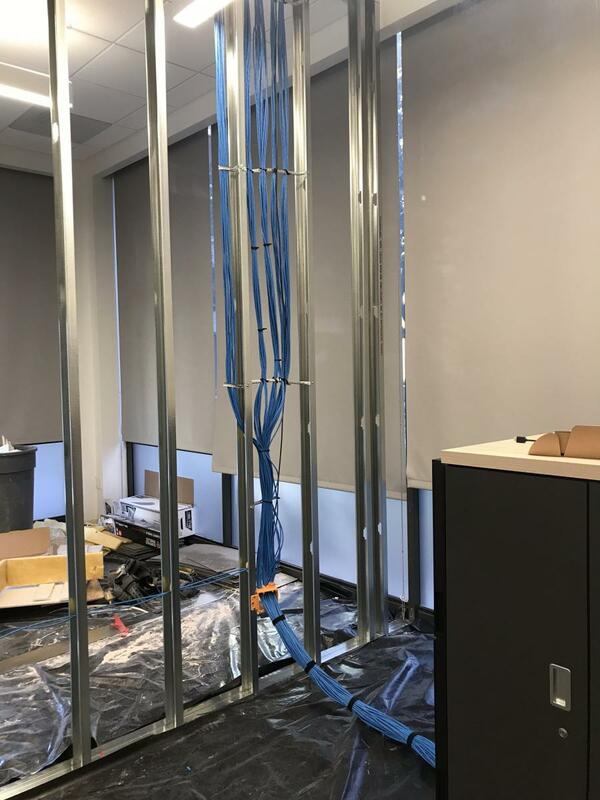 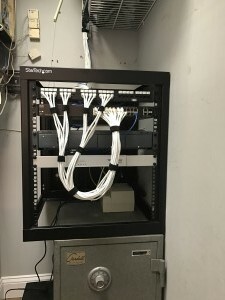 We ran 20 voice and data cat6 plenum drops in this small office move to connect all their computers to a cloud server and connect their Avaya IP Office phone system. 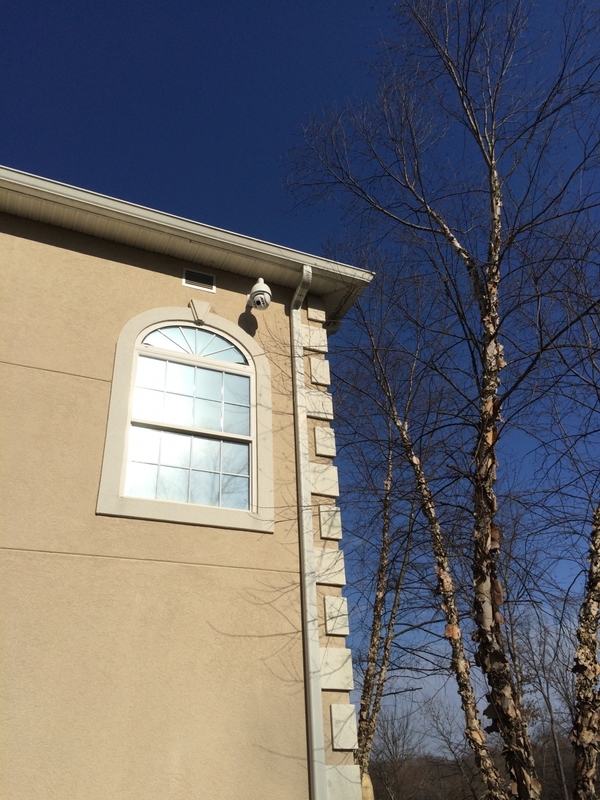 We also added a small 4 camera Security Camera system for some on premise security. 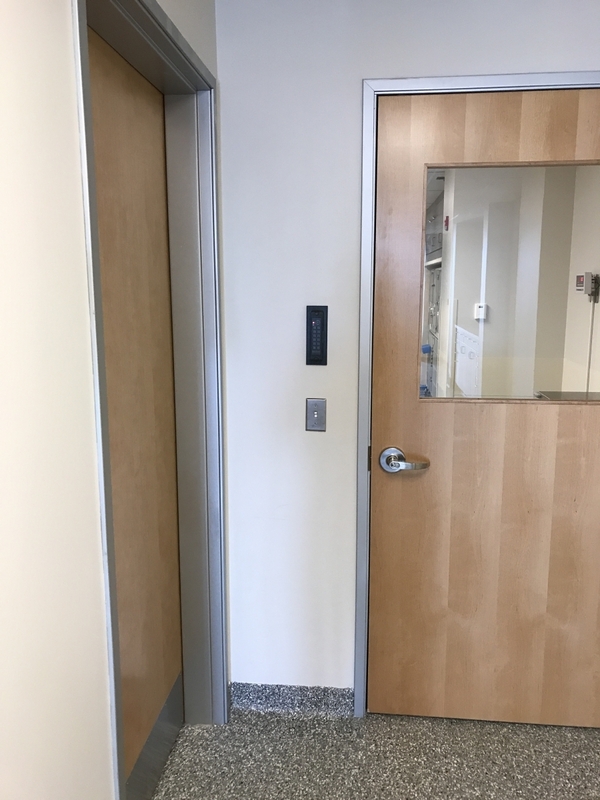 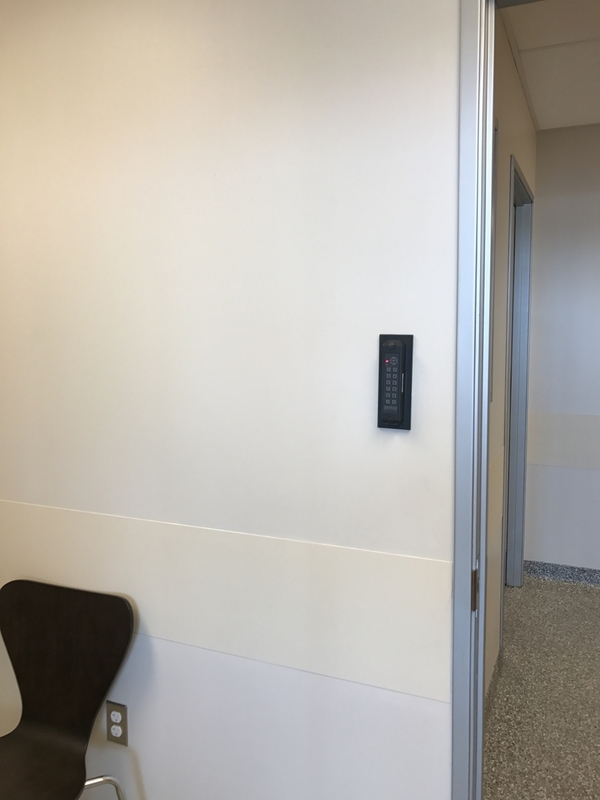 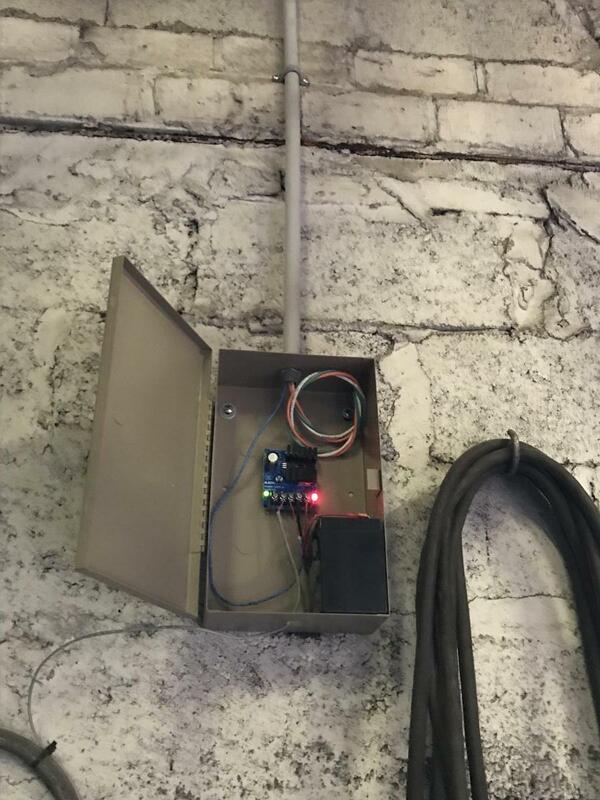 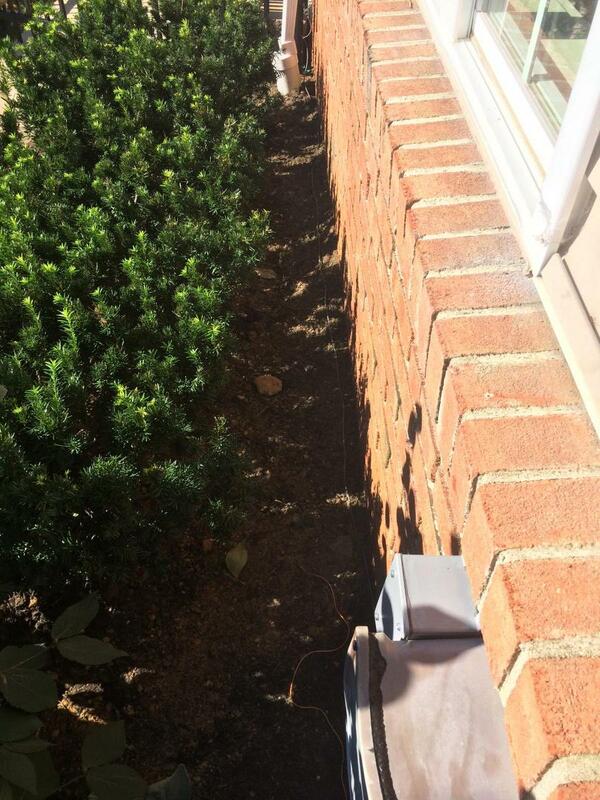 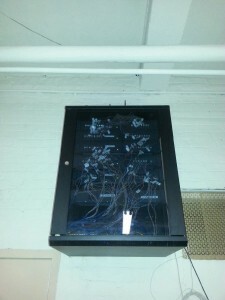 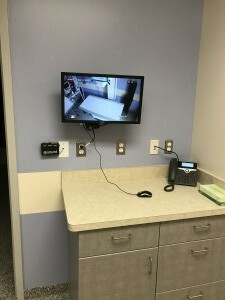 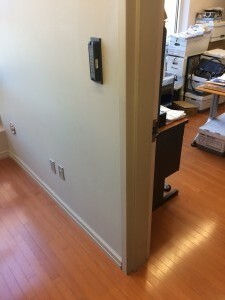 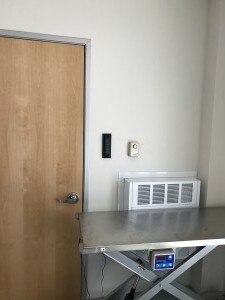 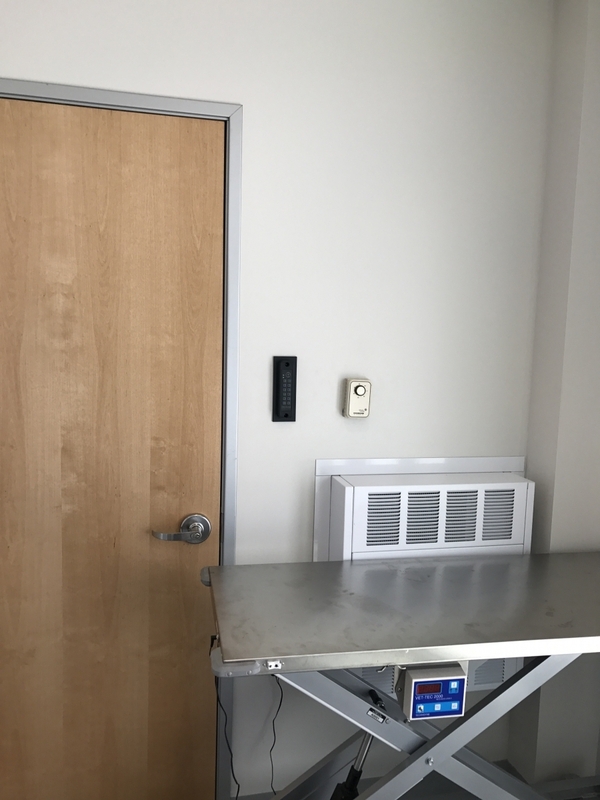 We replaced the existing exterior mounted directory and installed this directory with a hidden in-wall compartment that houses power internet access and a computer to run the directory. Before and after photos of a small rack cleanup job in Freehold. Infrastructure install for a Condo sales gallery. We wired the space for both wired and wireless networks. 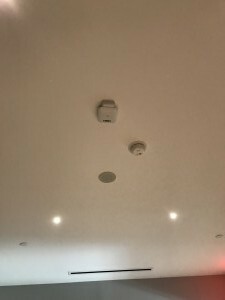 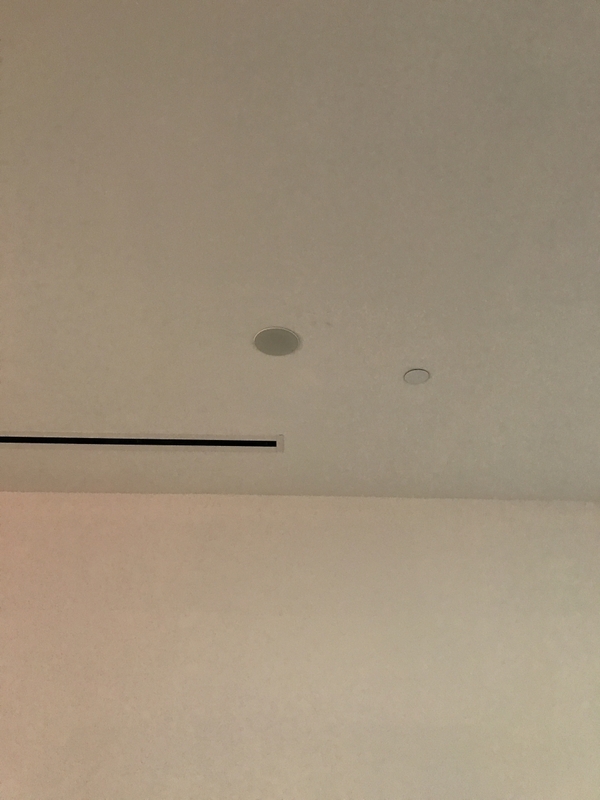 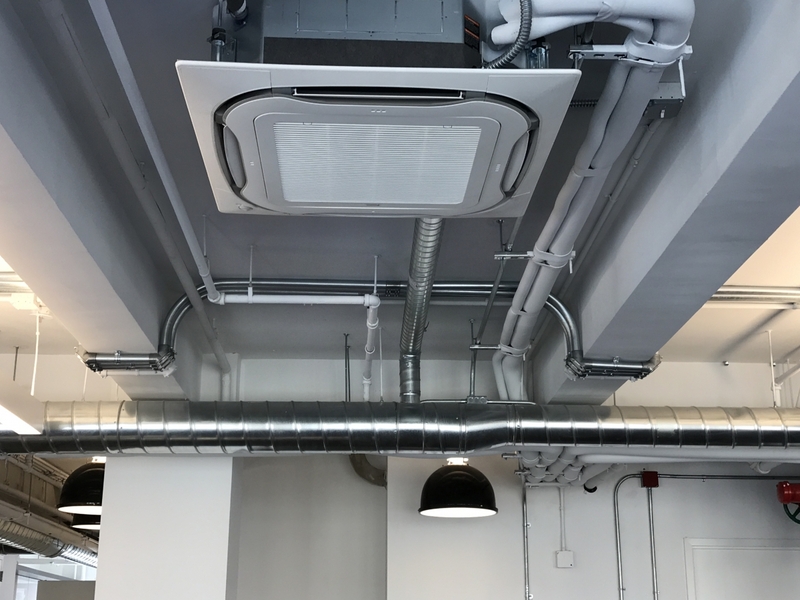 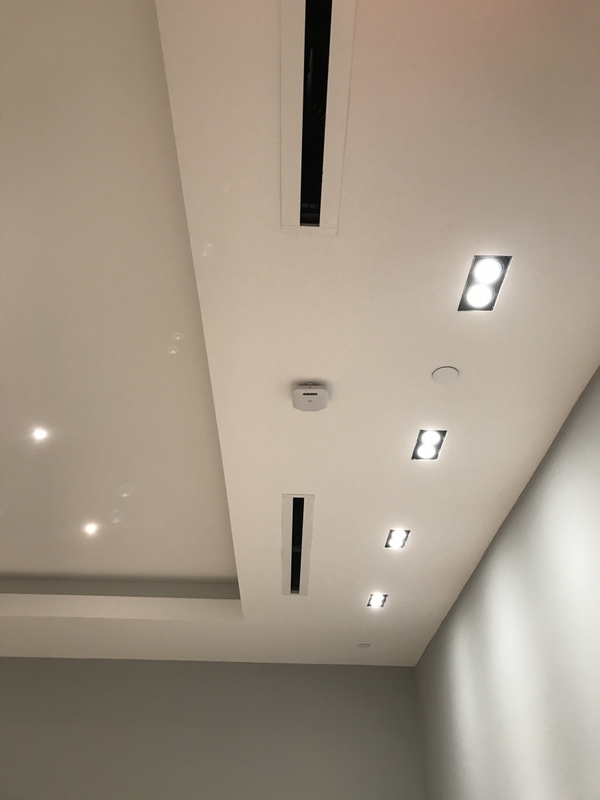 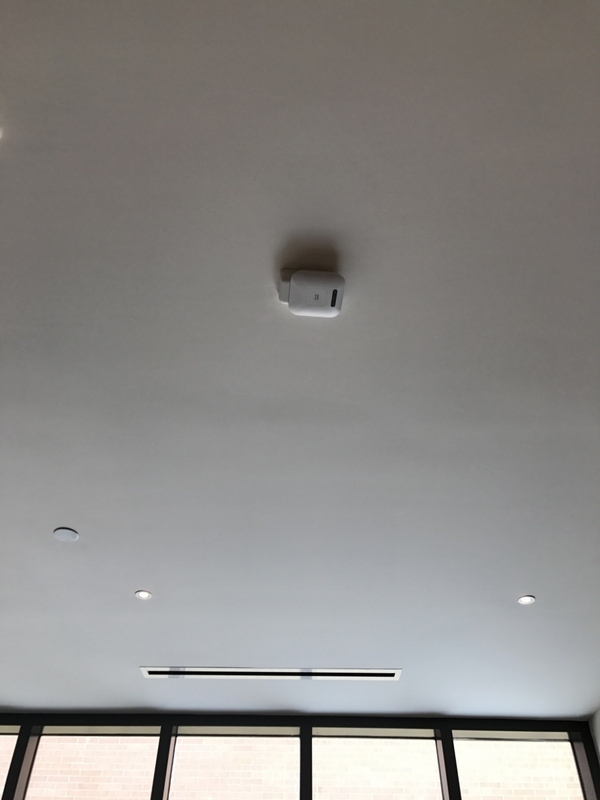 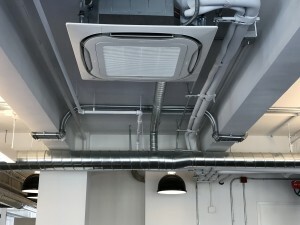 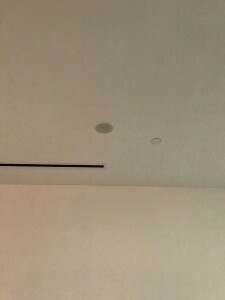 We installed a recessed 6 speaker Yamaha sound system throughout the space. 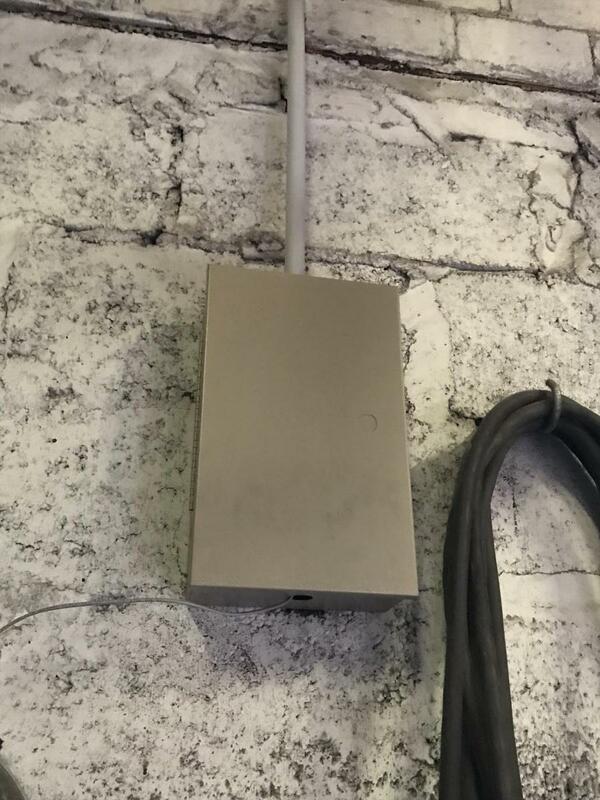 Cisco Wireless Access Points allow for seamless internet service through out an otherwise cellular dead zone. 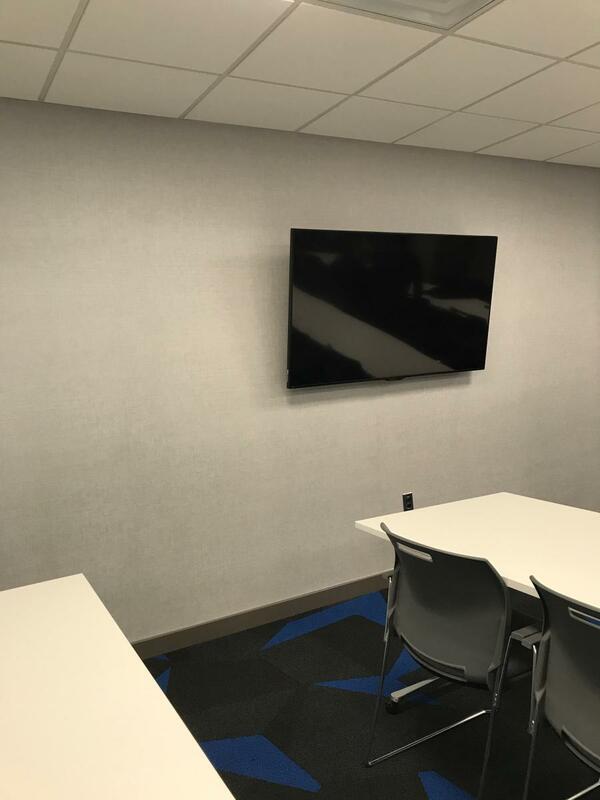 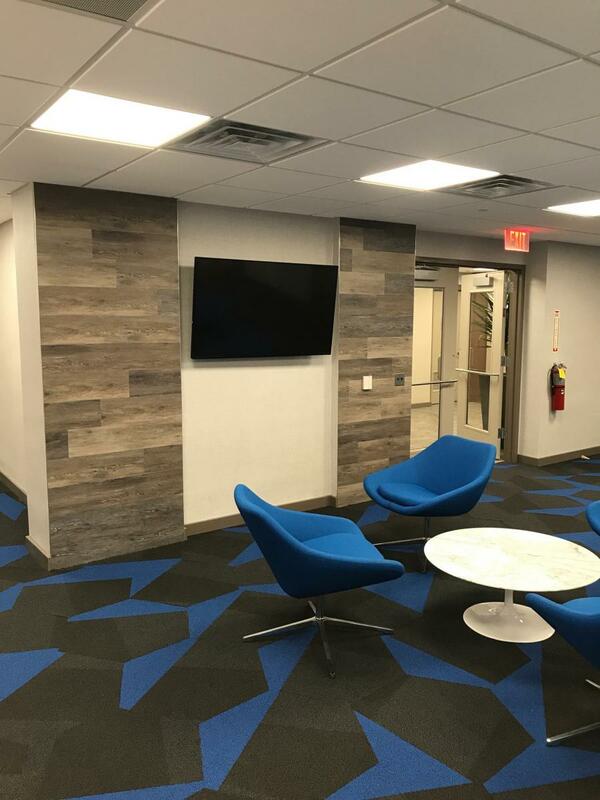 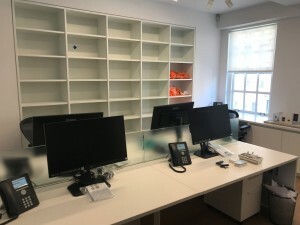 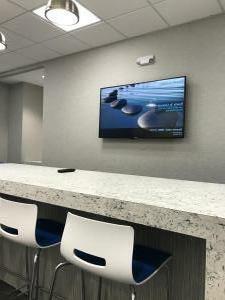 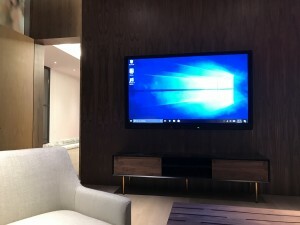 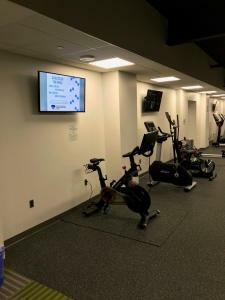 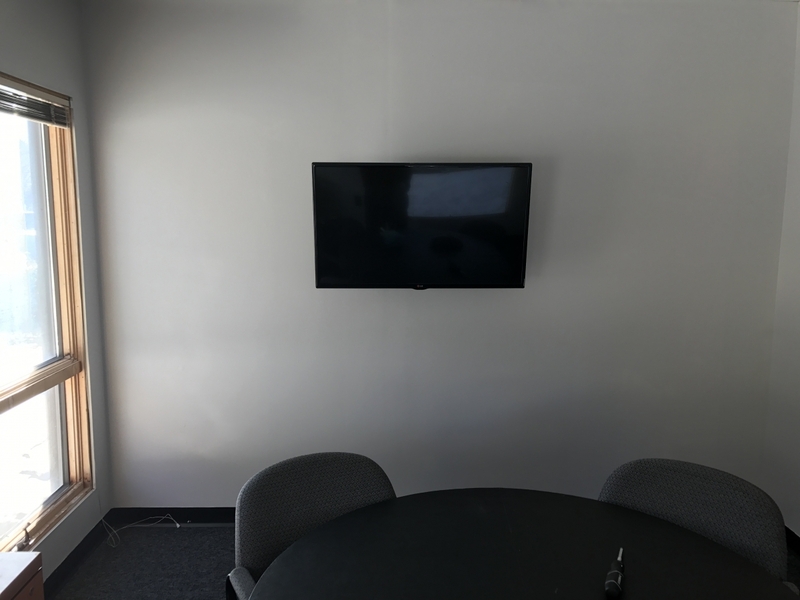 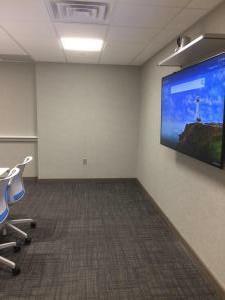 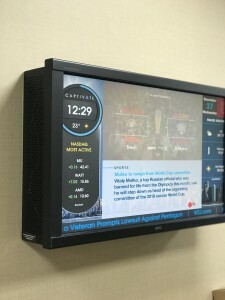 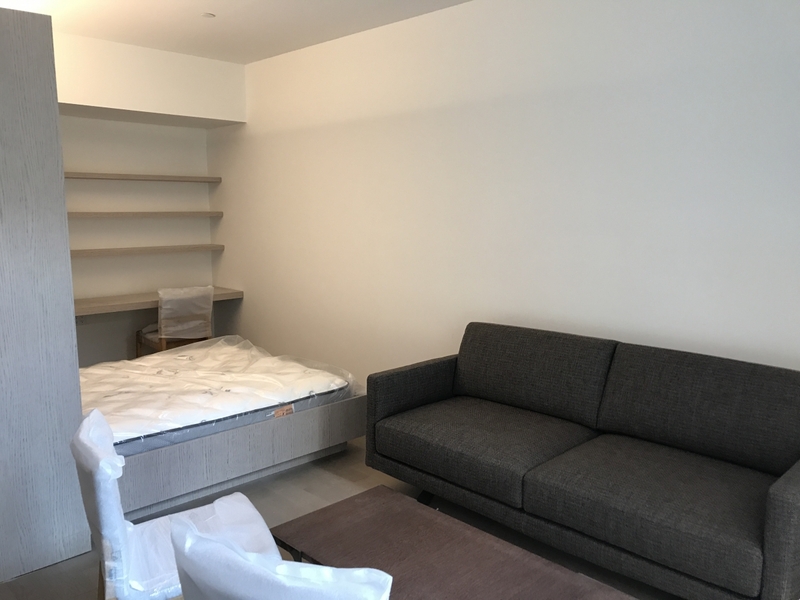 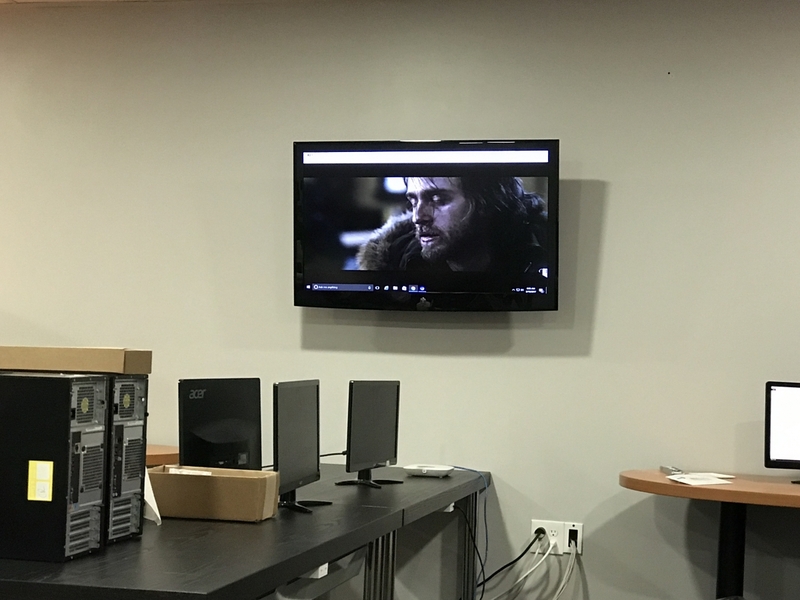 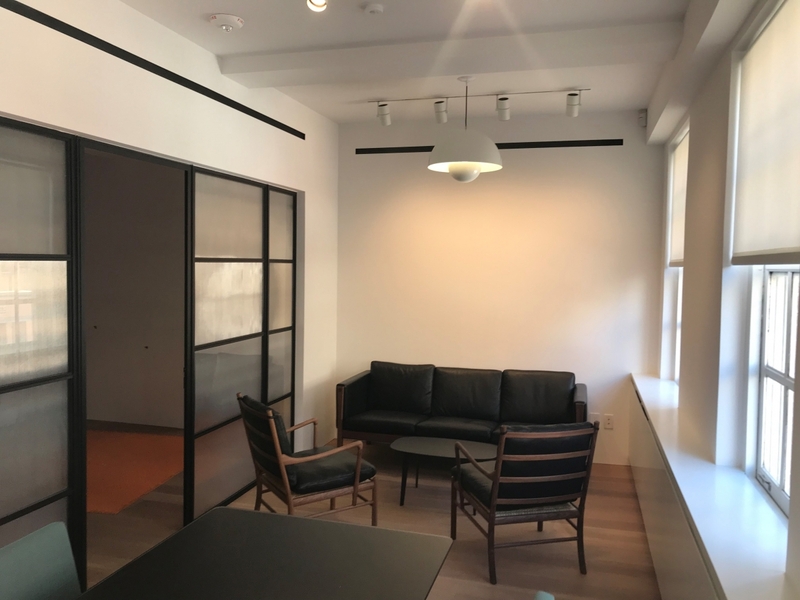 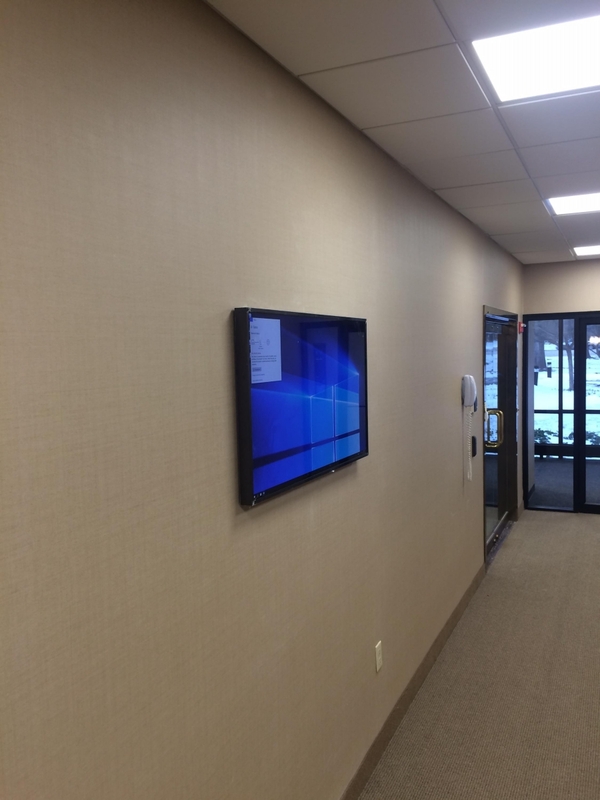 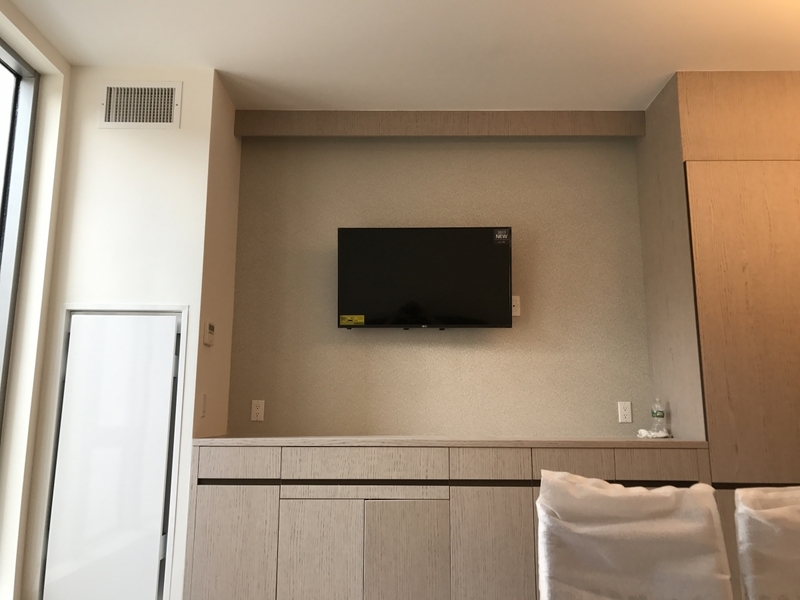 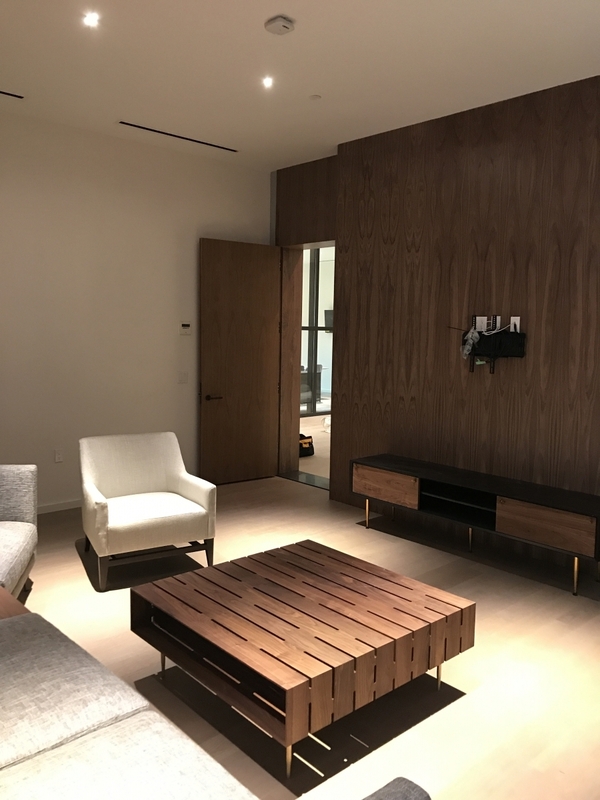 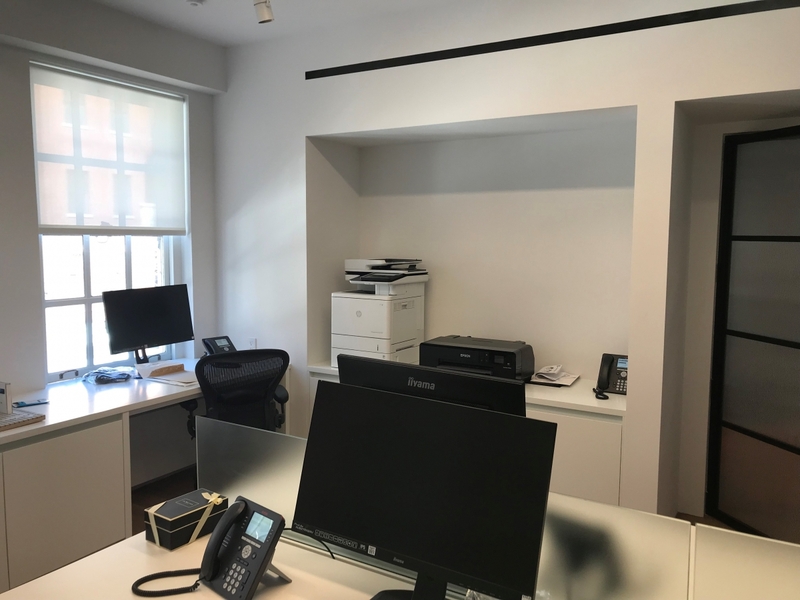 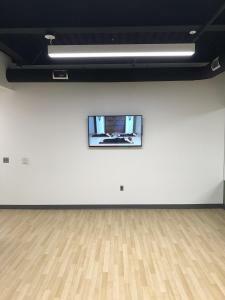 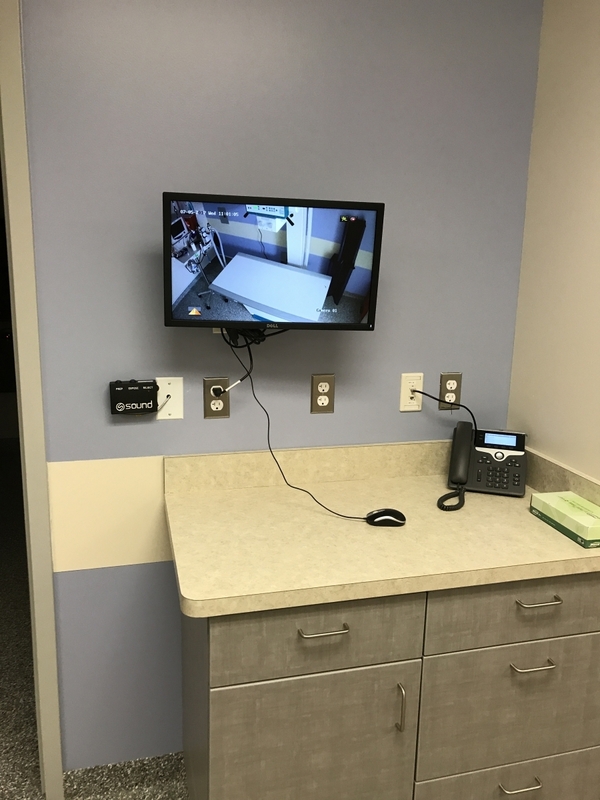 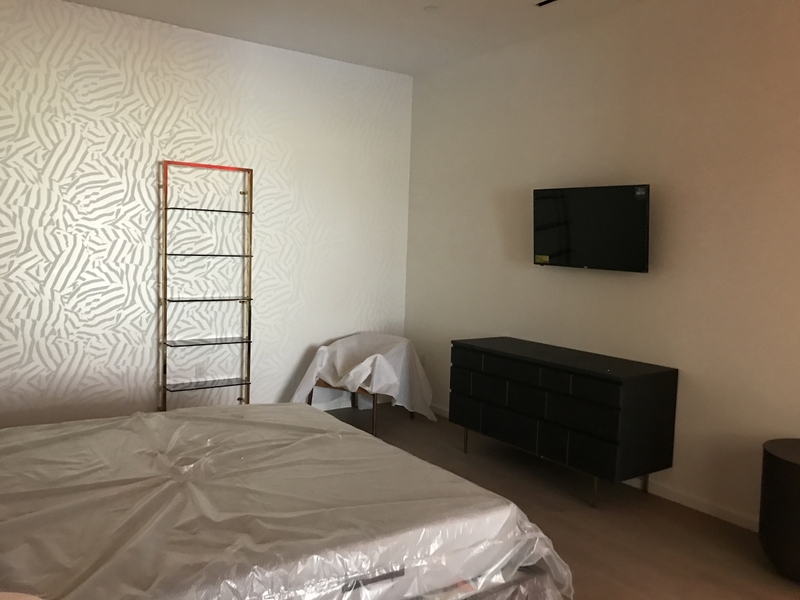 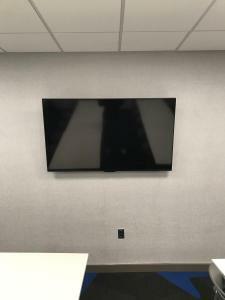 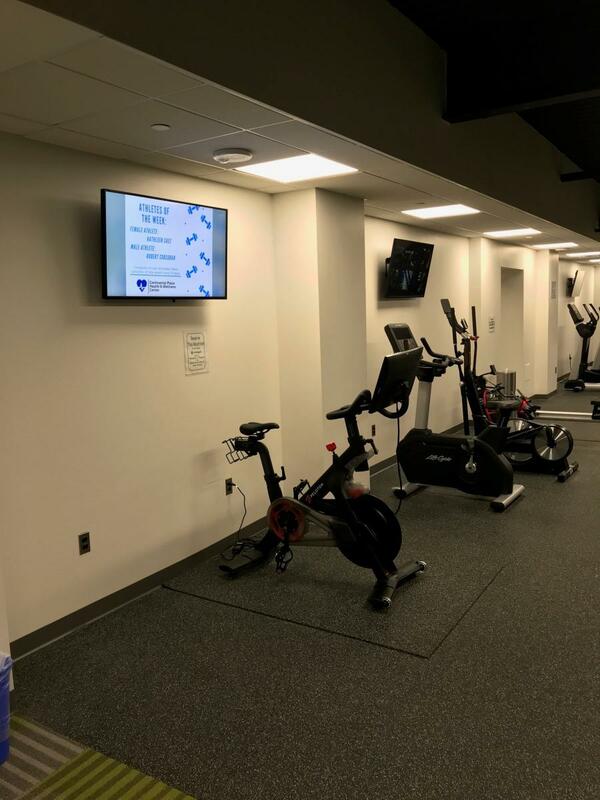 Installed 3 43″, 1 60″ and 2 55″ touch screen tv’s throughout the space all wired for data and some for HDMI and USB to accommodate the required touchscreen technology. 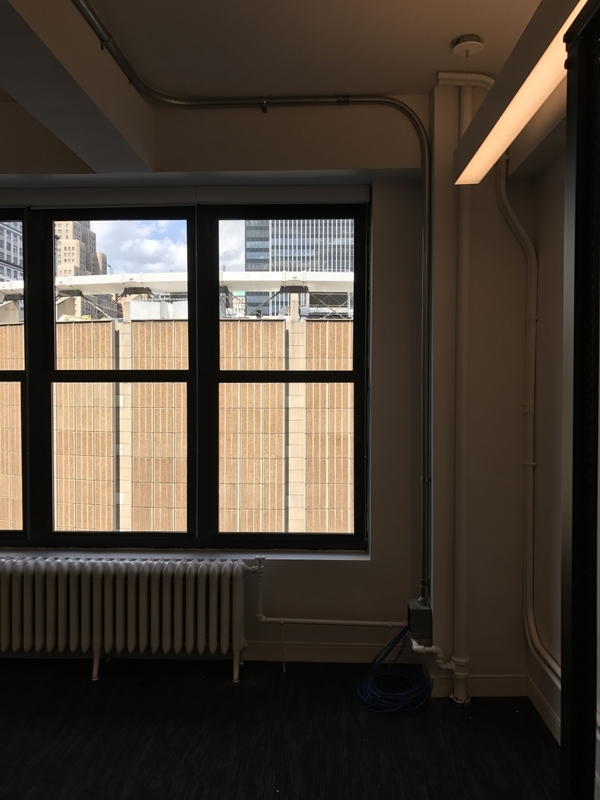 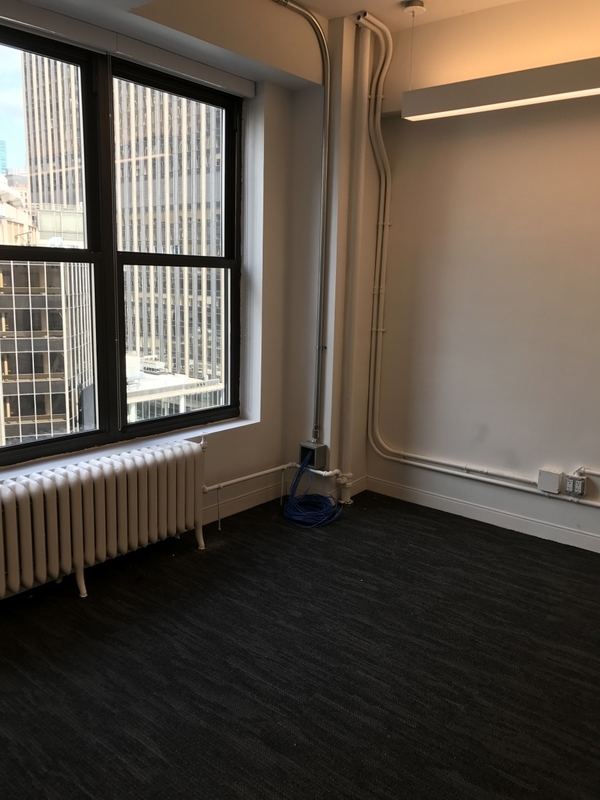 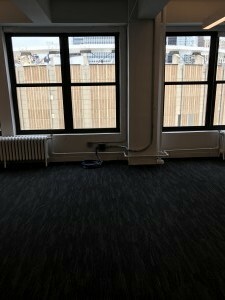 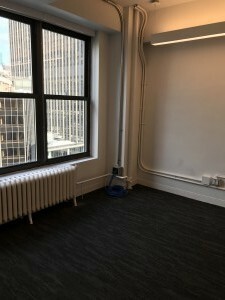 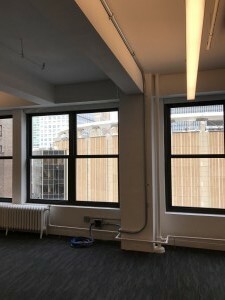 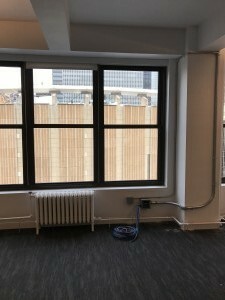 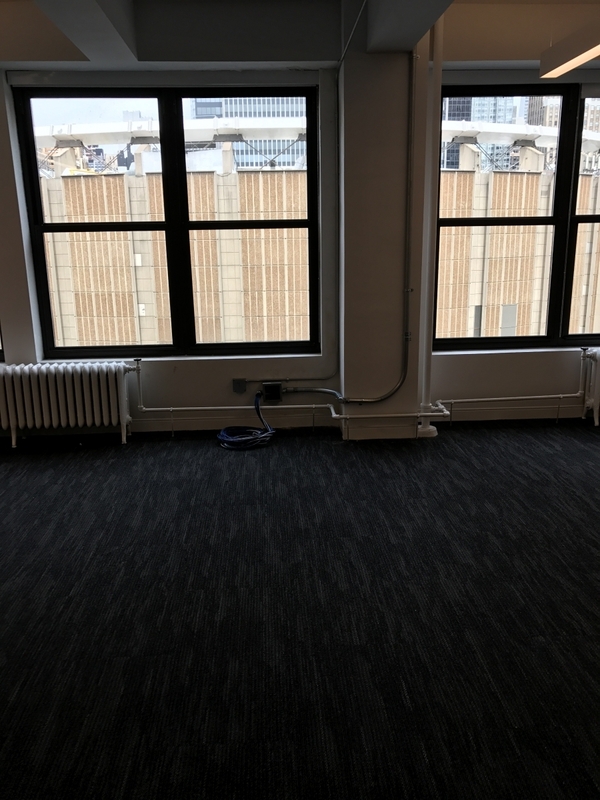 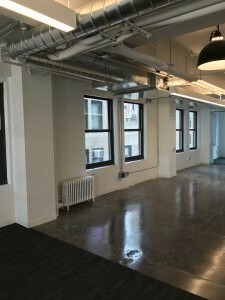 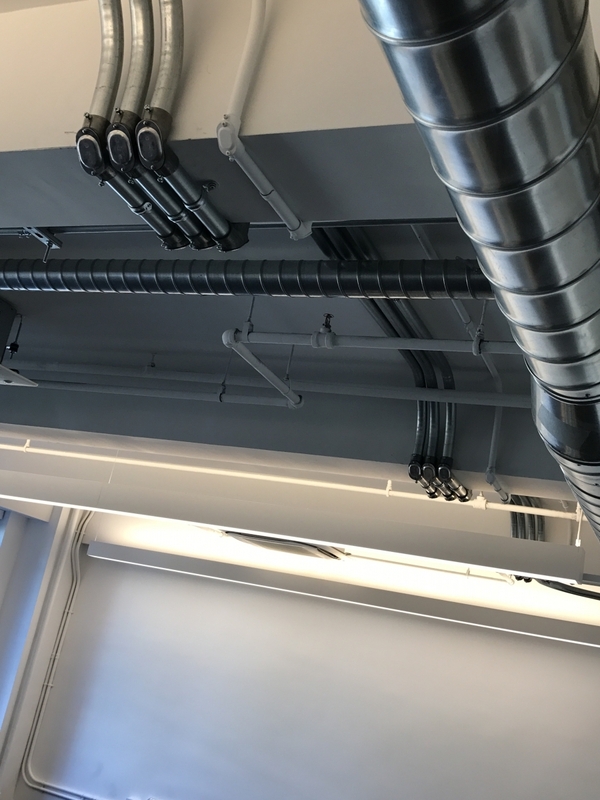 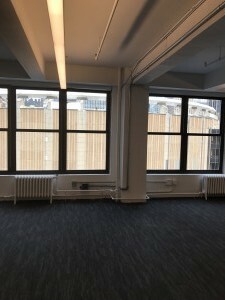 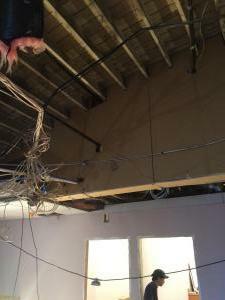 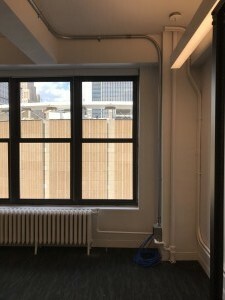 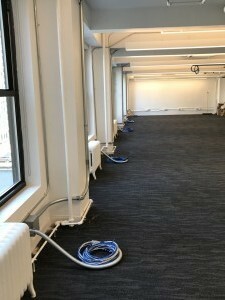 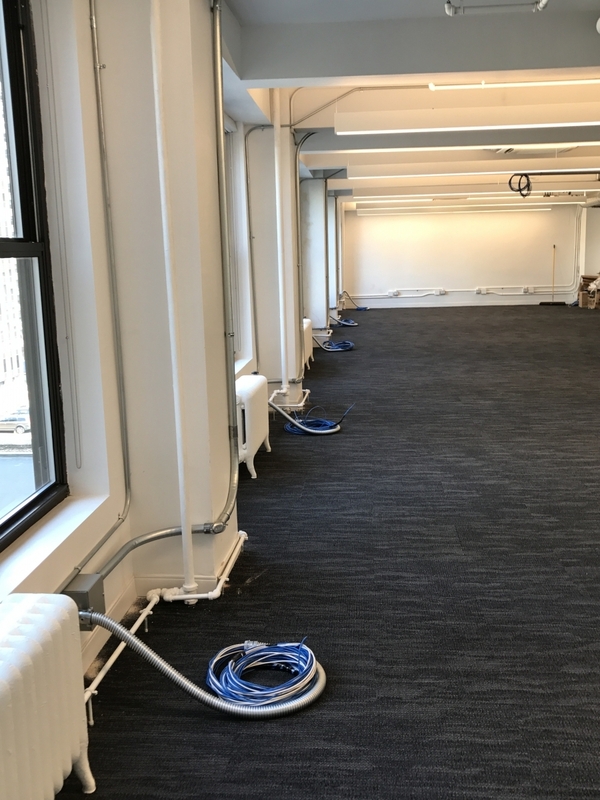 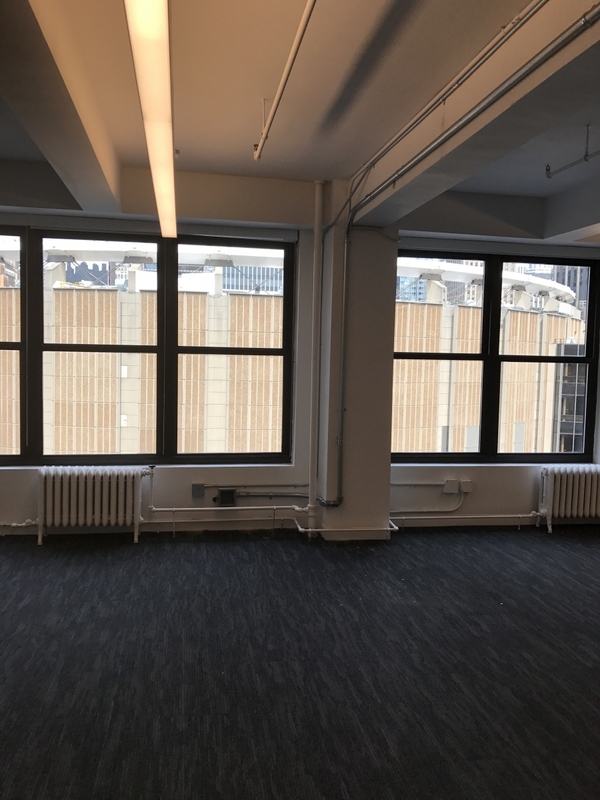 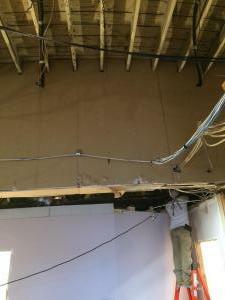 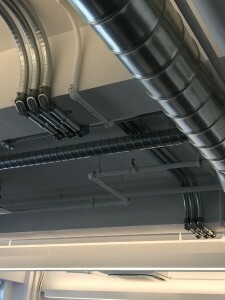 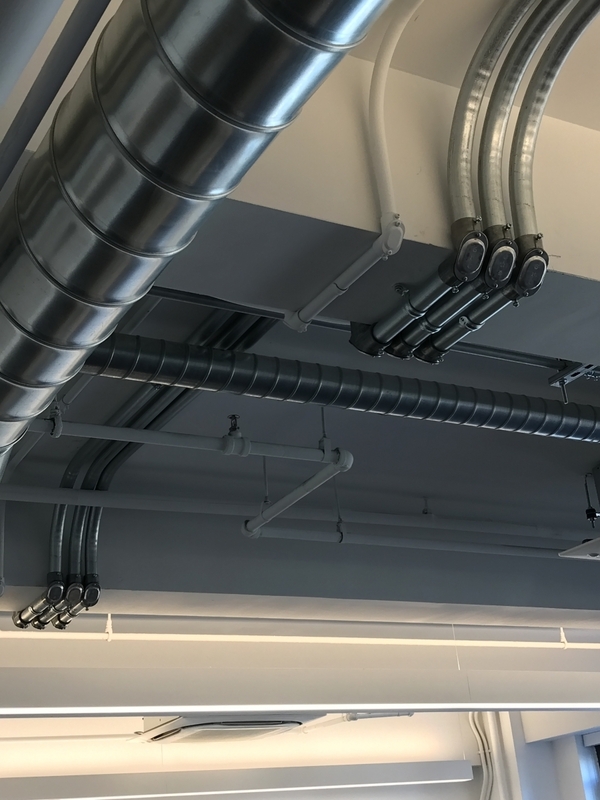 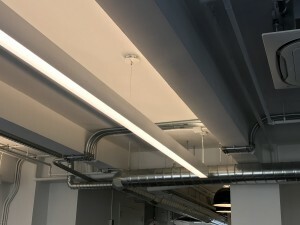 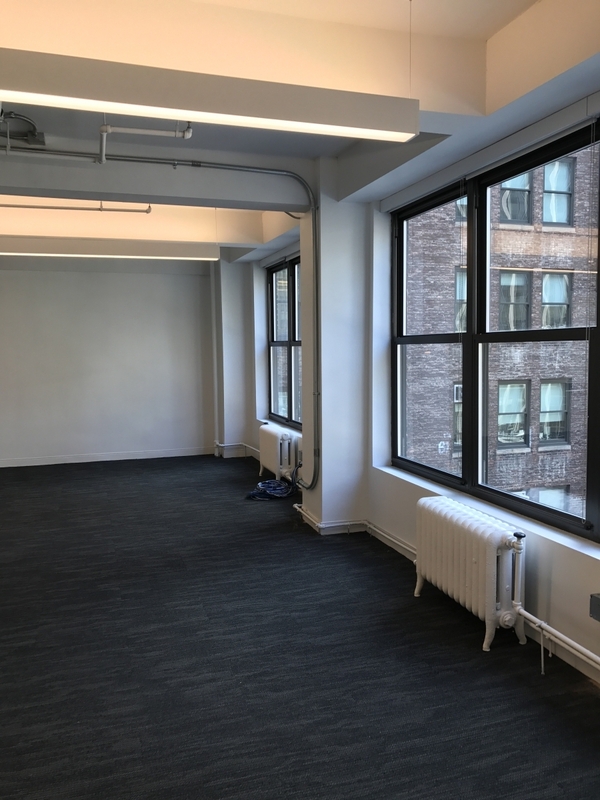 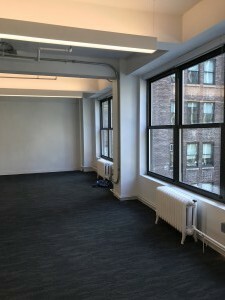 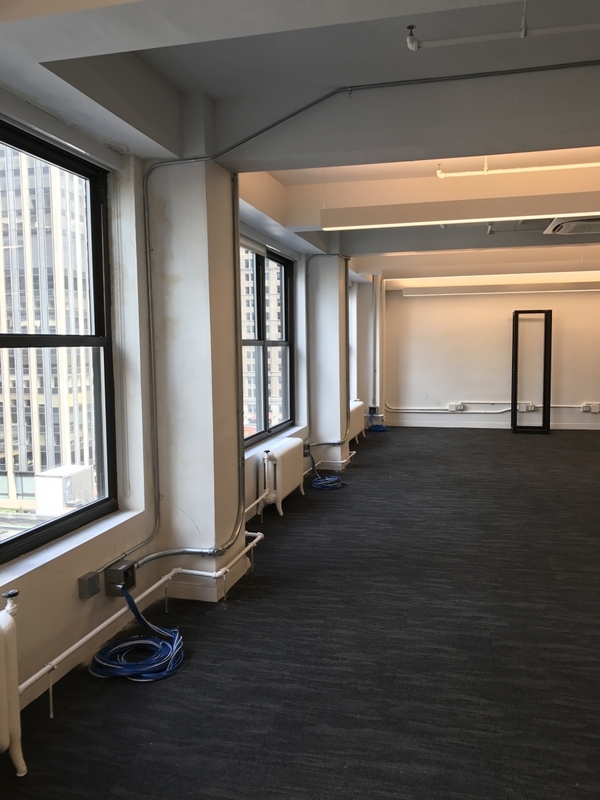 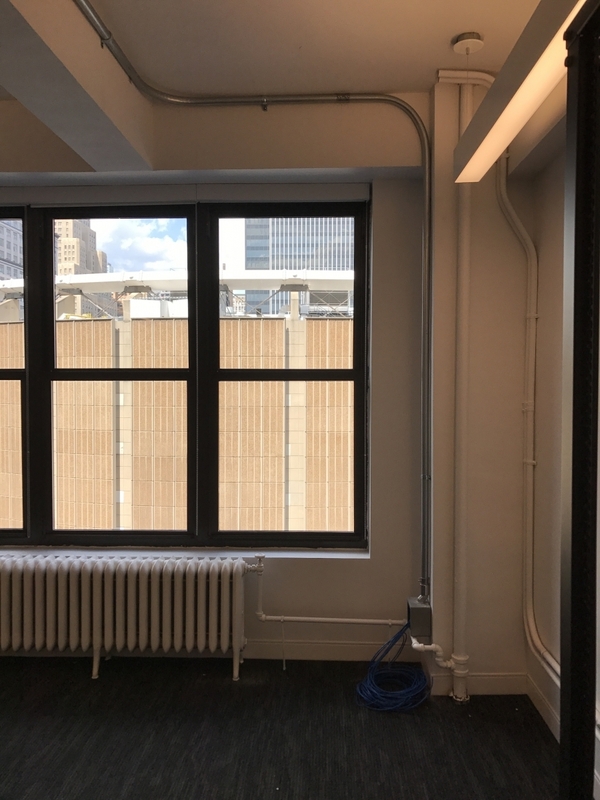 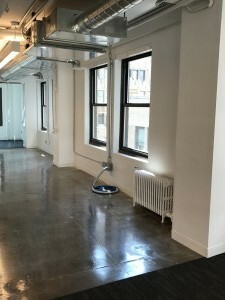 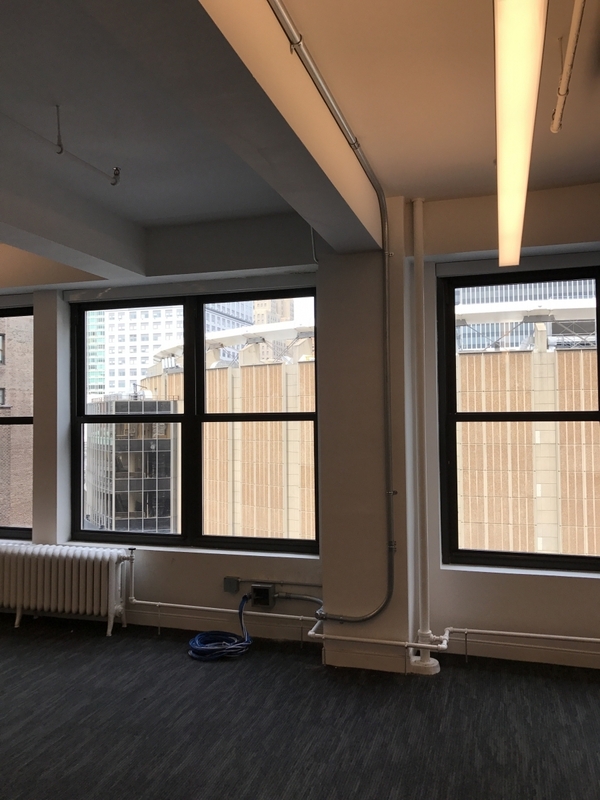 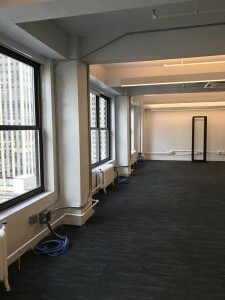 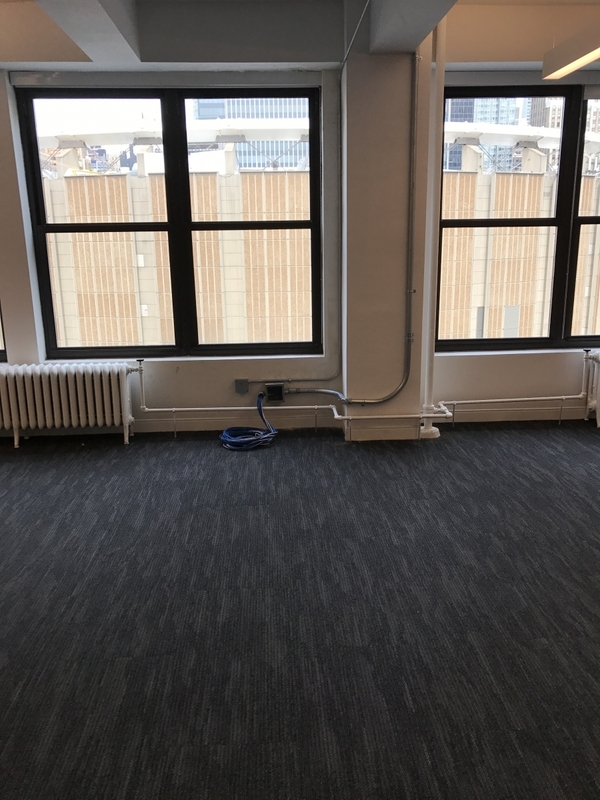 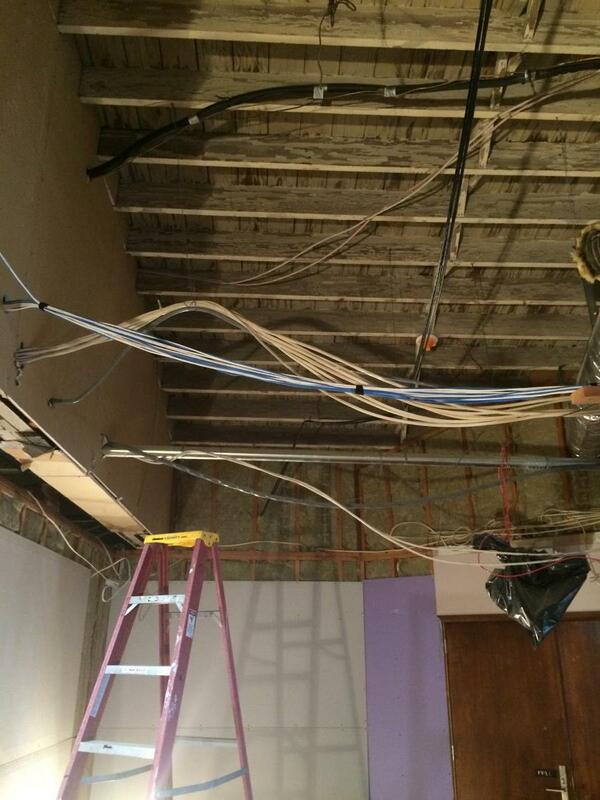 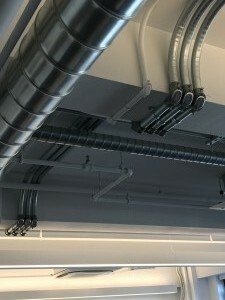 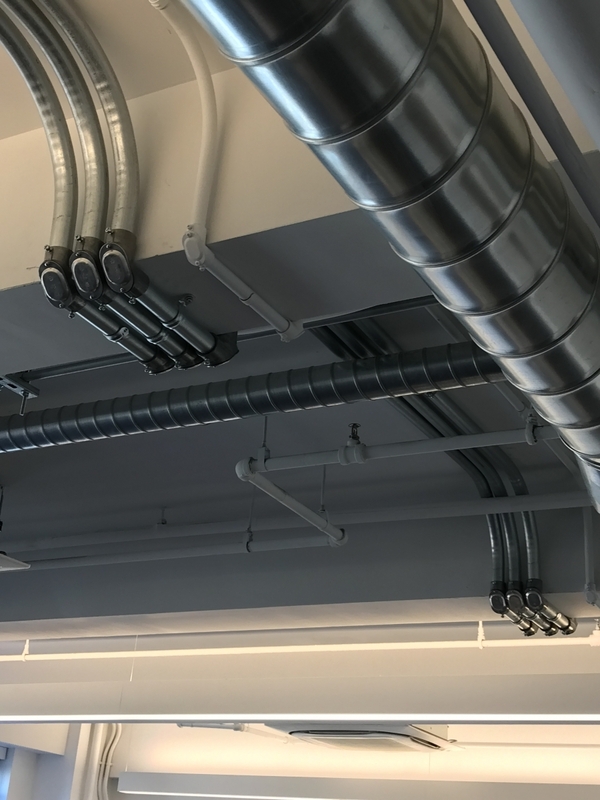 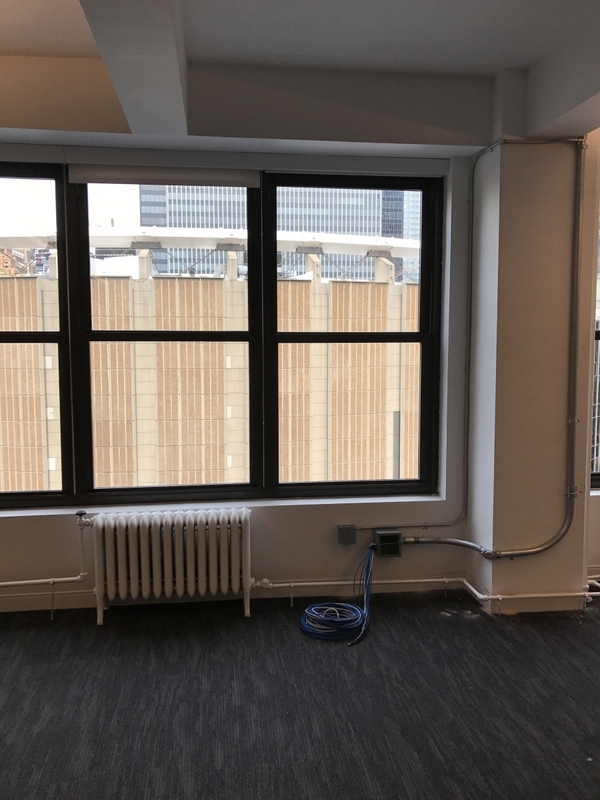 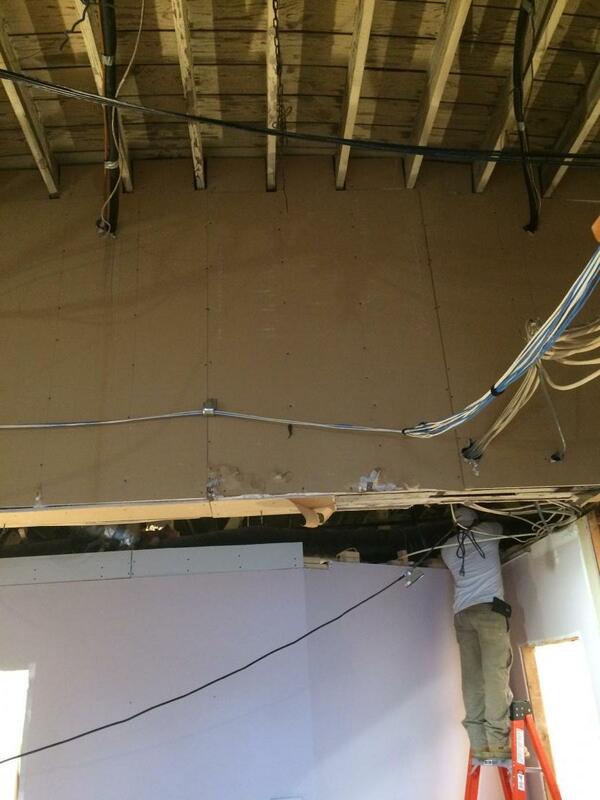 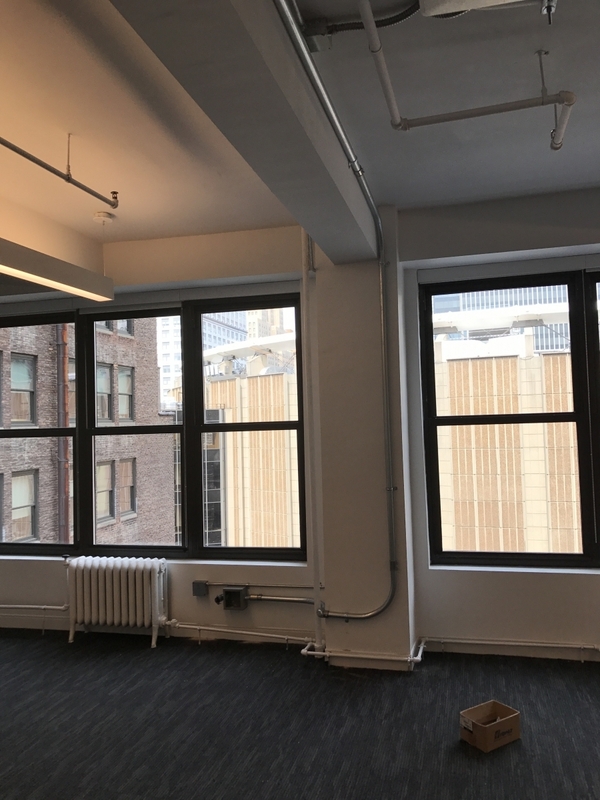 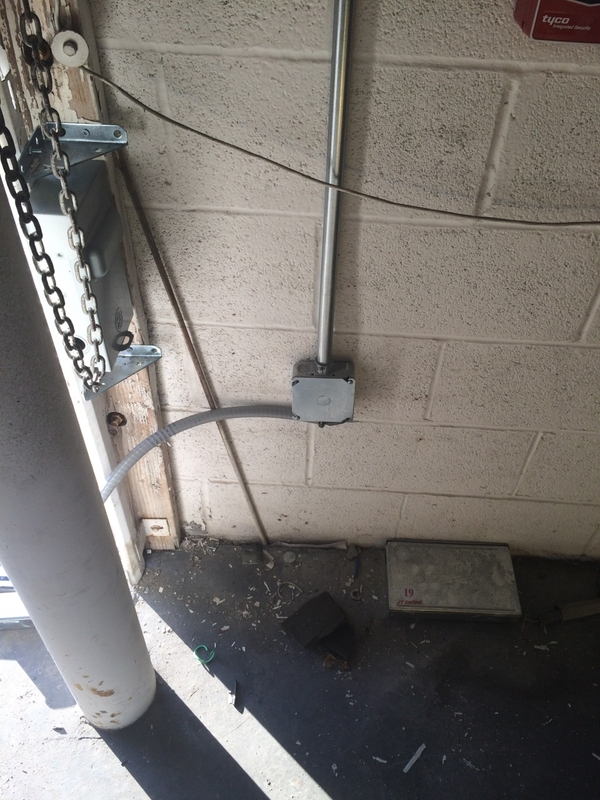 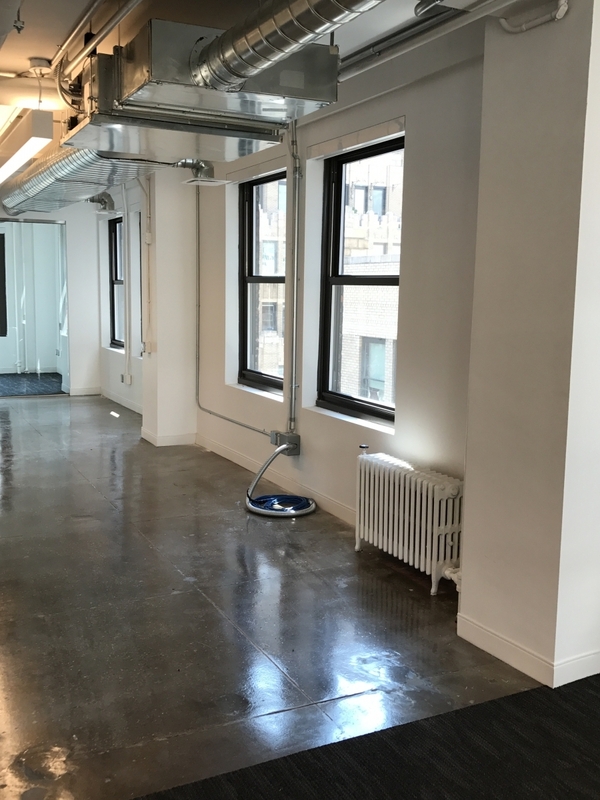 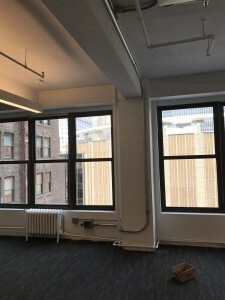 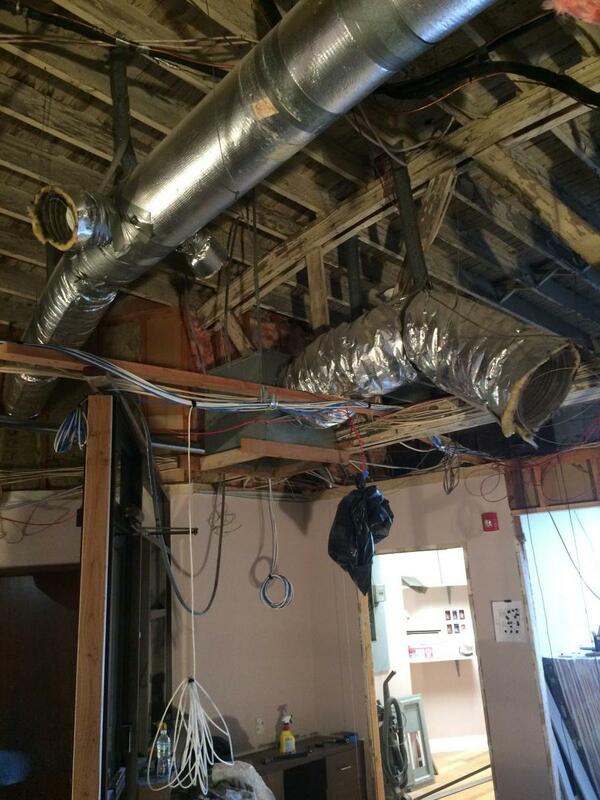 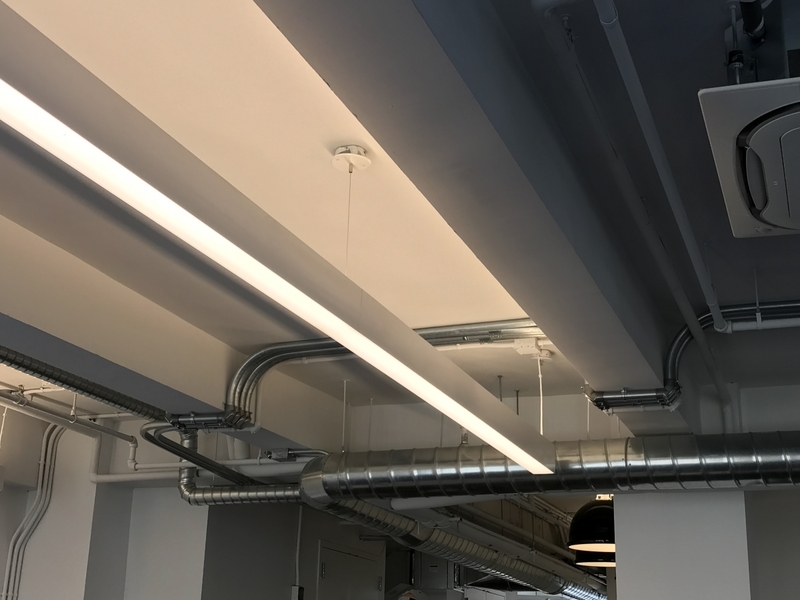 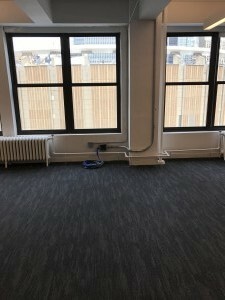 Over 120 drops incased in 700 feet of 1 1/4″ conduit installed in a loft office space in NYC. 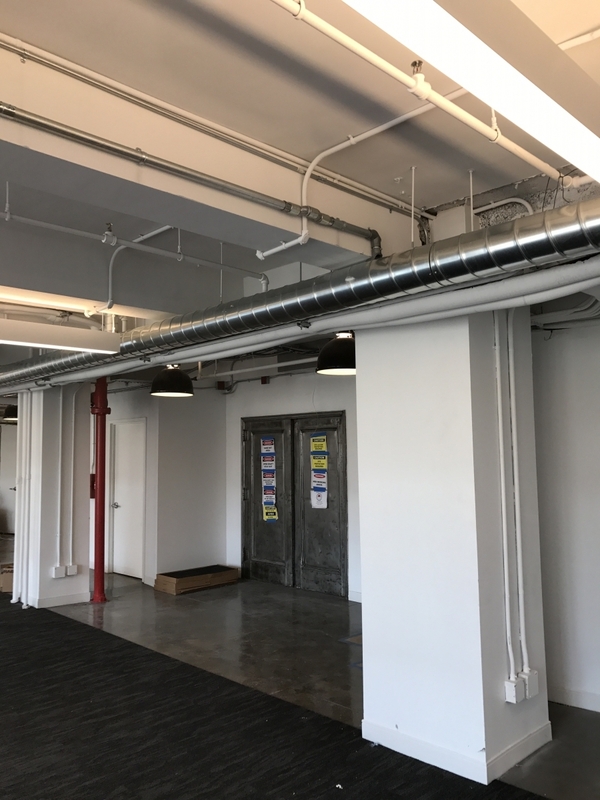 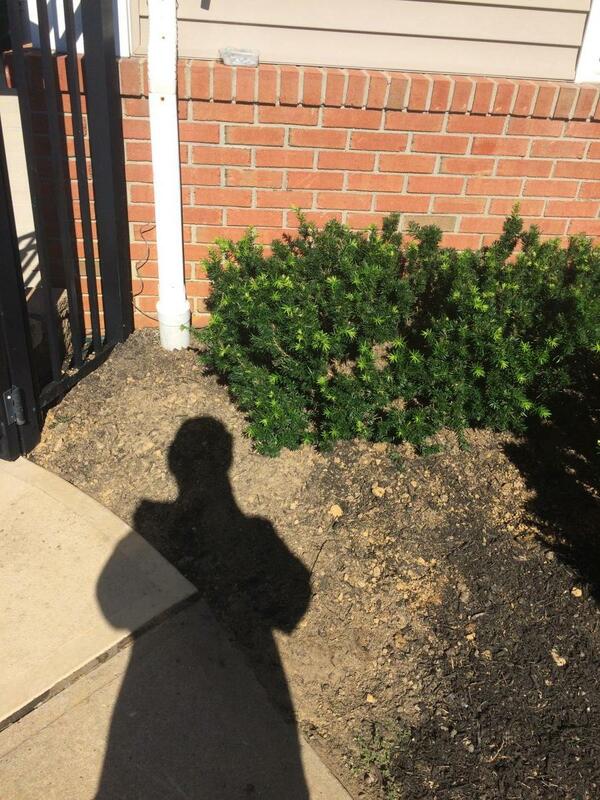 Each run will be terminated at a shared workspace. 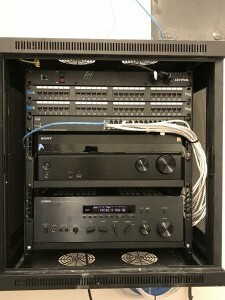 A complete residential home entertainment system installation, using Yamaha 7.1 Surround Sound decoder and speakers. We setup an Apple TV as the interface for the home media server containing a large collection of digital media. An Apple Computer is used for web browsing and video chat on the large screen tv. 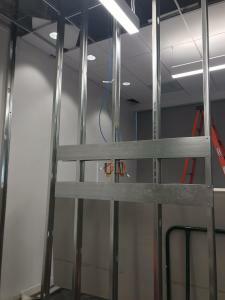 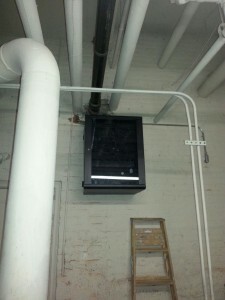 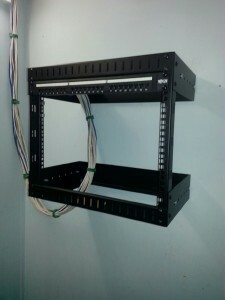 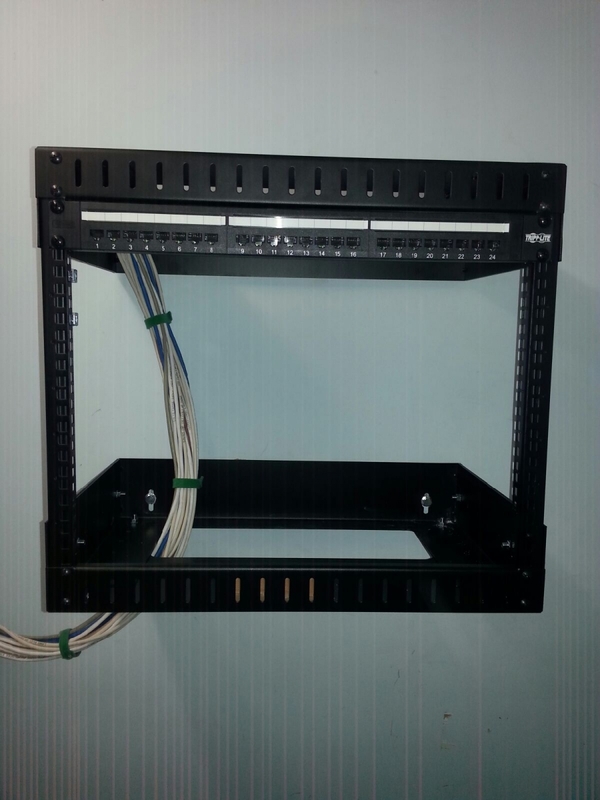 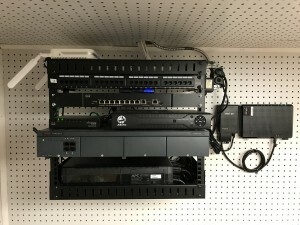 All components have been rack mounted, recessed into the wall and trimmed with a black frame. 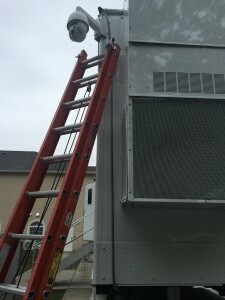 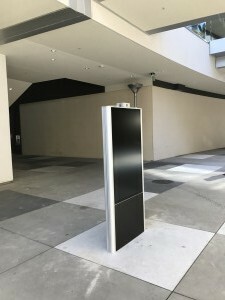 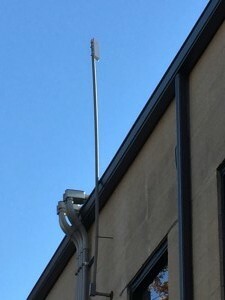 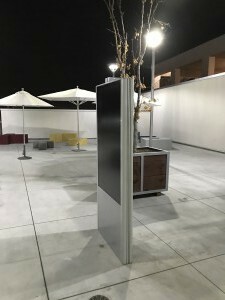 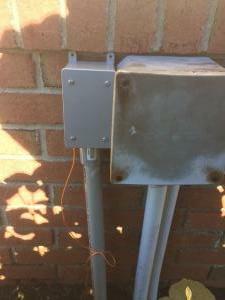 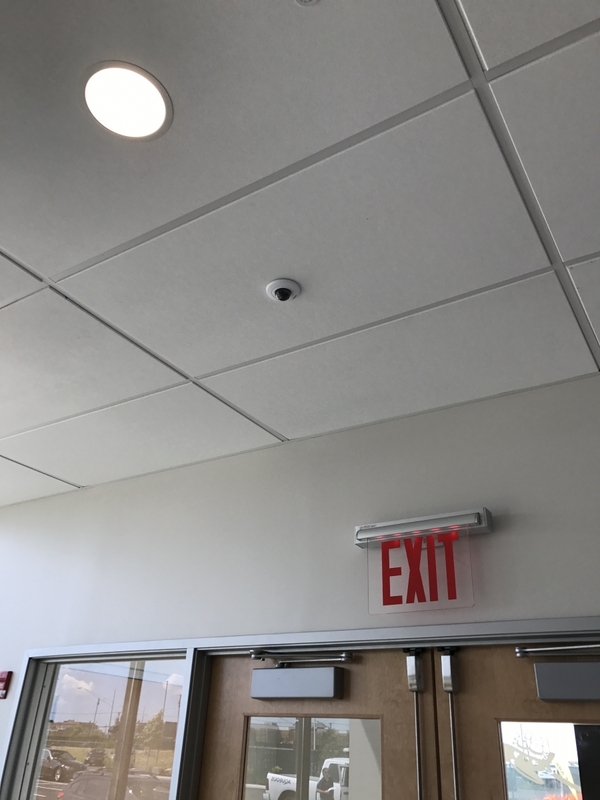 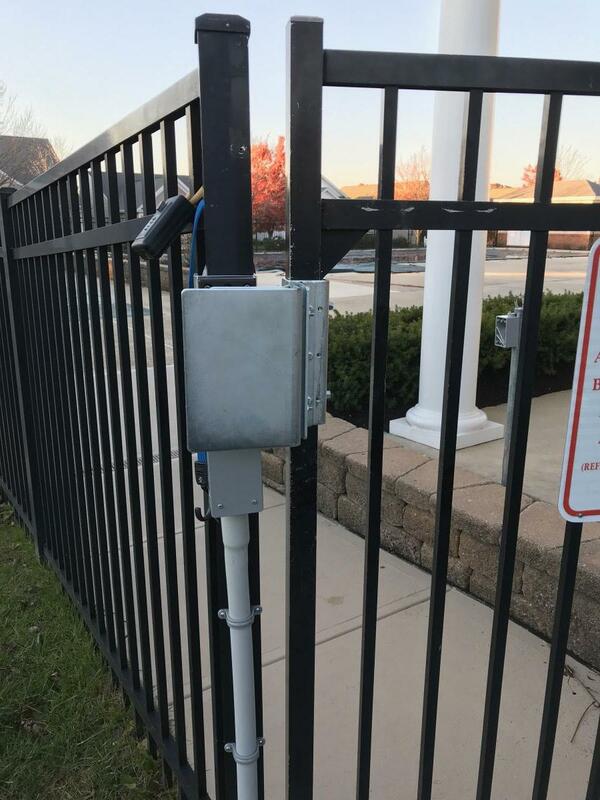 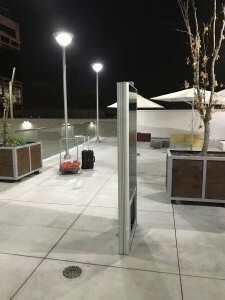 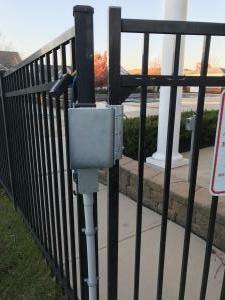 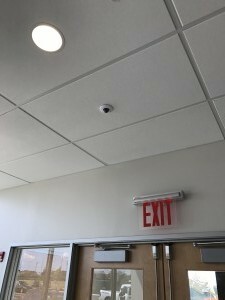 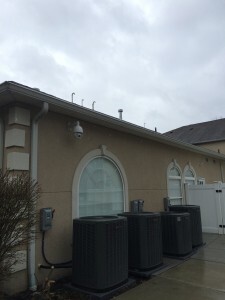 This a multi building installation with an outdoor Wireless network to connect the computerized access control units. This is an Isonas access control system with multiple doors on multiple buildings. 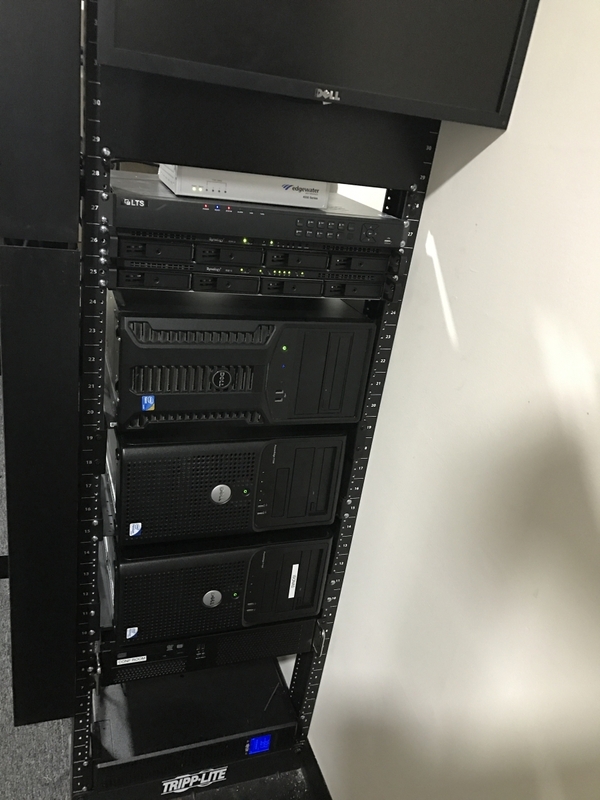 The different buildings are located in cities throughout the North East and Managed from one server located at the customers Head Quarters. 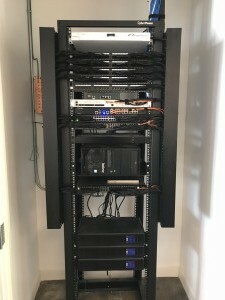 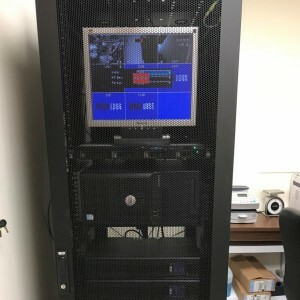 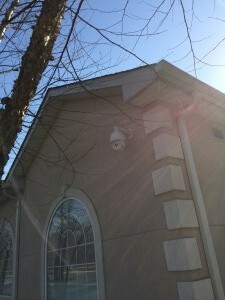 Commercial Surveillance system with multiple 64 channel NVR’s connected with fiber optic data runs. 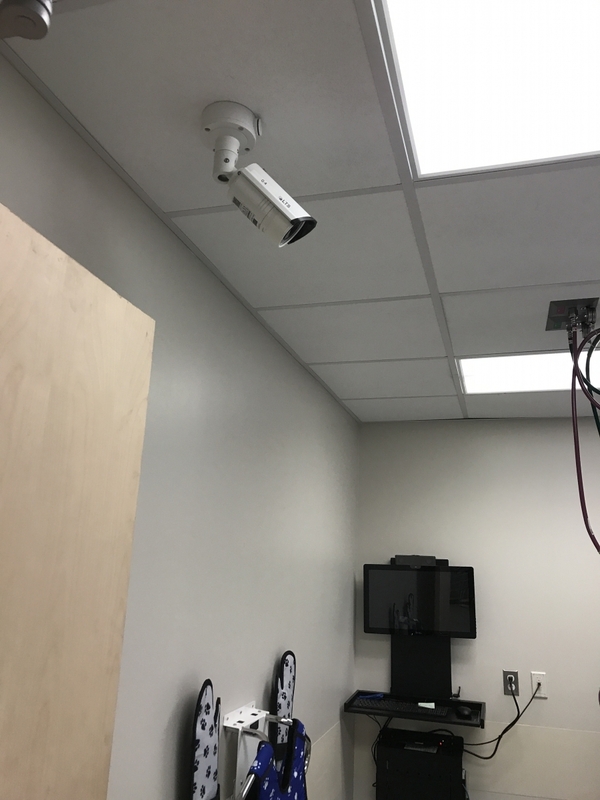 The cameras include recessed in ceiling 4mp cameras and motorized PTZ exterior cameras. 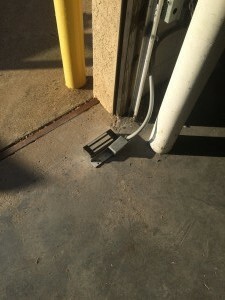 3 Door Electric Strike and Push Paddle Door Releases managed by and Isonas Card Reader. The system incorporates video conferencing with ClearOne’s Professional series conference room equipment. 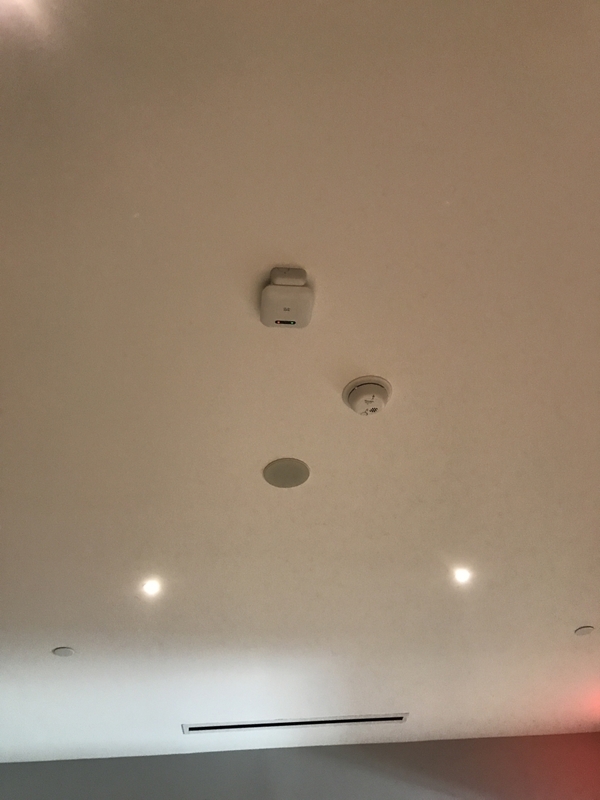 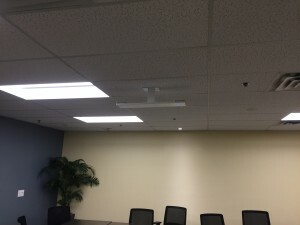 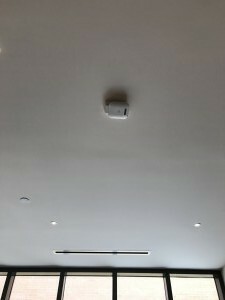 We have installed two ceiling mounted beam forming microphones, four in-ceiling Yamaha speaker, system amplifier, conferencing control unit and a usb interface for video conferencing. 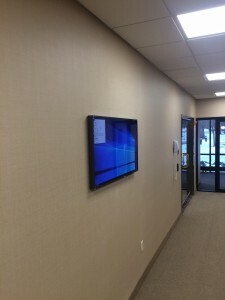 On the wall we mounted an 80″ Sharp Aquos touch screen and a 1080p ptz webcam. 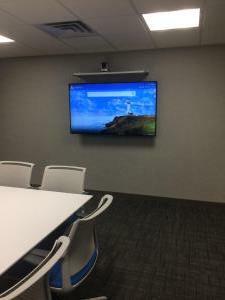 The system is compatible with any web conferencing software available on the market. We installed 4 phone systems across 4 buildings connected by a dedicated network. The phone system has over 750 phones connected to it and can dial across buildings. 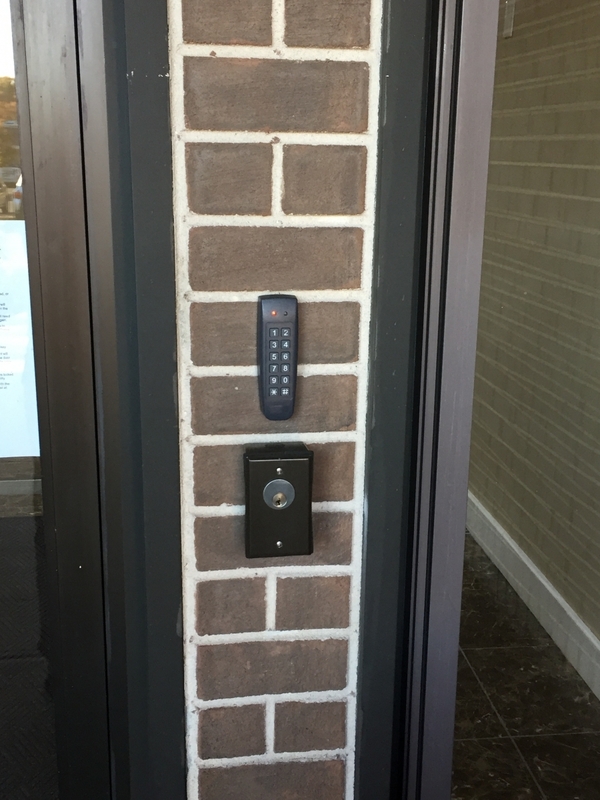 It is currently being used as the infrastructure for a residential complex in which each resident has a doorman phone in their apartment. When a phone in the apartment is picked up it will automatically dial the doorman in that building. 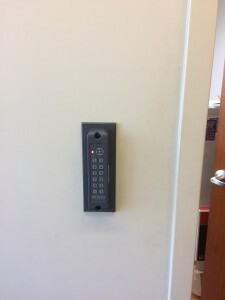 At an apartment level the system can be configured to receive doorman calls directly to the apartment phone or dial any other phone number. The images below depict the secure rack installation of the individual PBX’s. 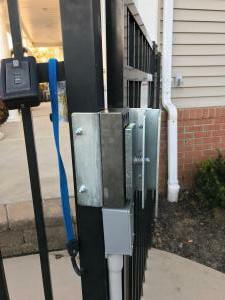 Big or small we install them all. 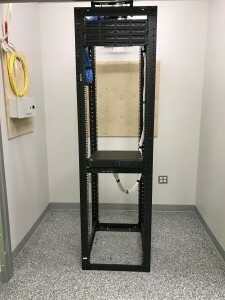 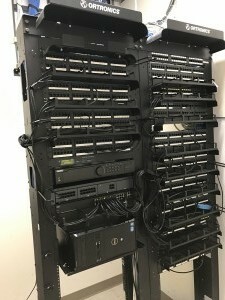 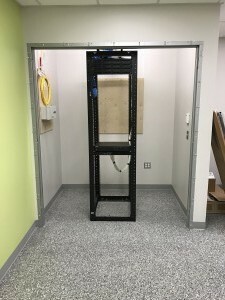 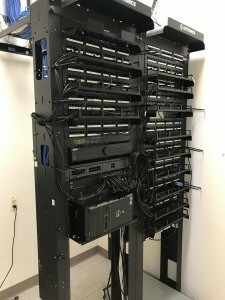 This is a small 22 drop voice and data rack installation. 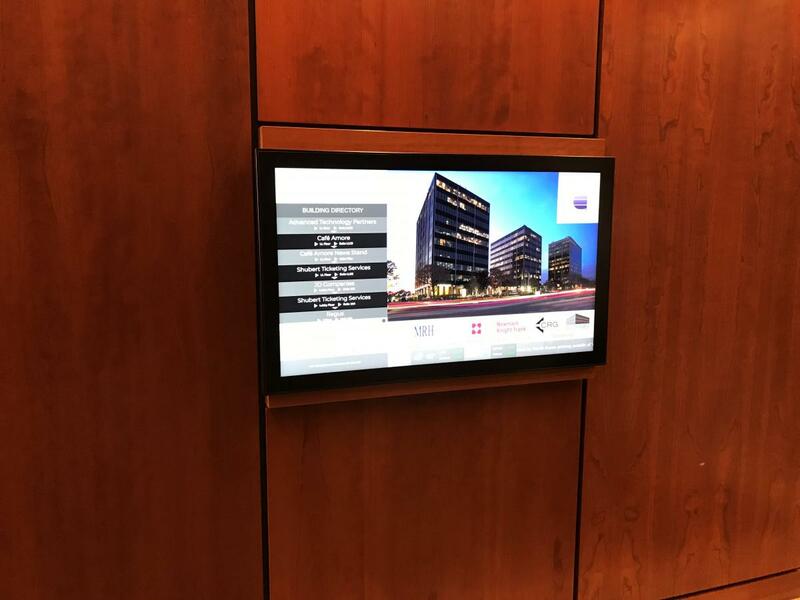 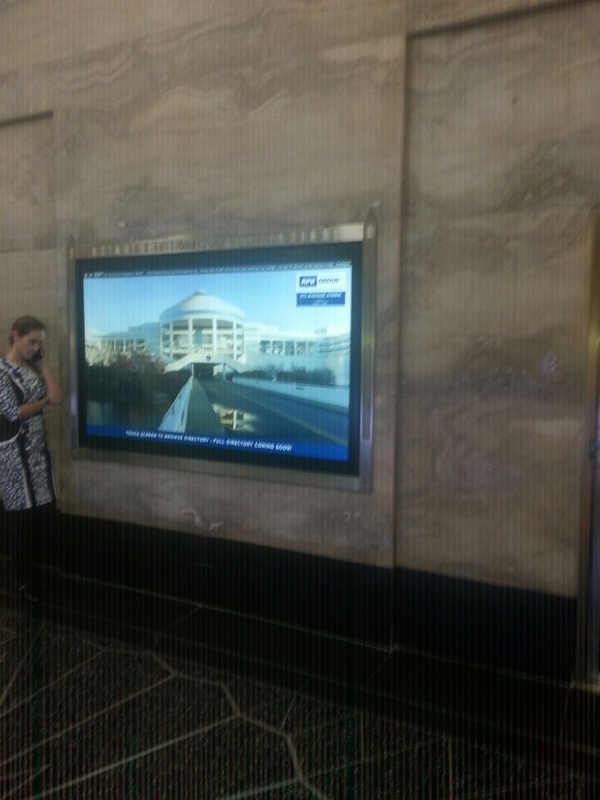 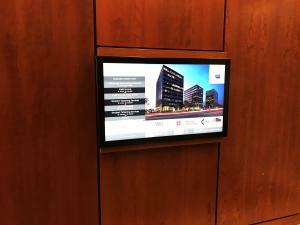 Custom installation of an 84 inch touch interactive screen used as the building’s virtual directory. 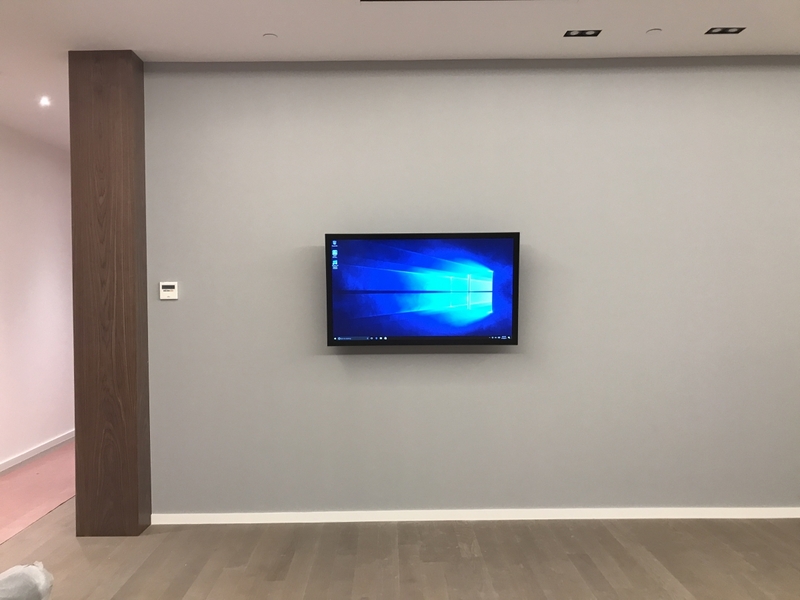 The custom touch screen was inserted into the wall with an antique brass frame that is original to the building architecture. The screen runs custom software that displays local transit, weather and news while not in use. 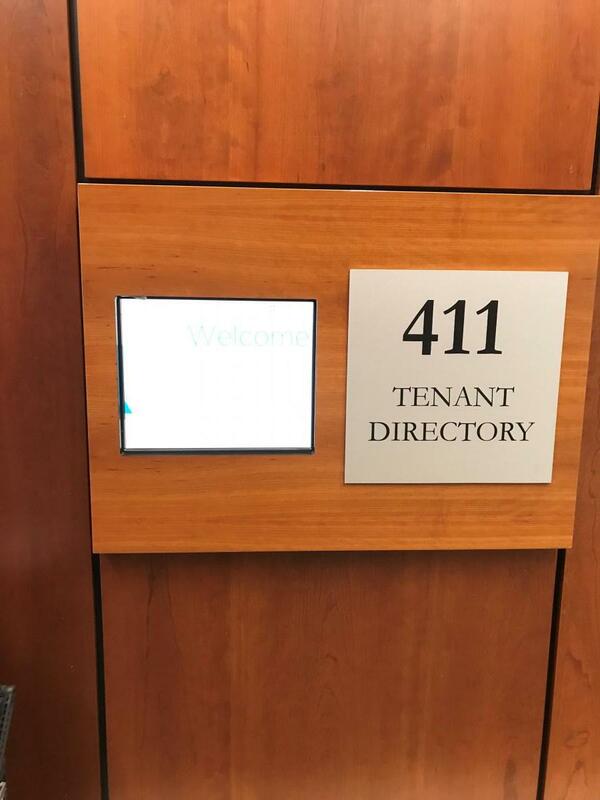 When the screen is touched the building directory menu appears and the visitor can find the required information on the building tenant. 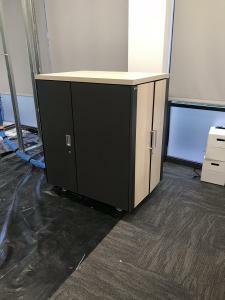 Moved a small office infrastructure to accommodate for growth. 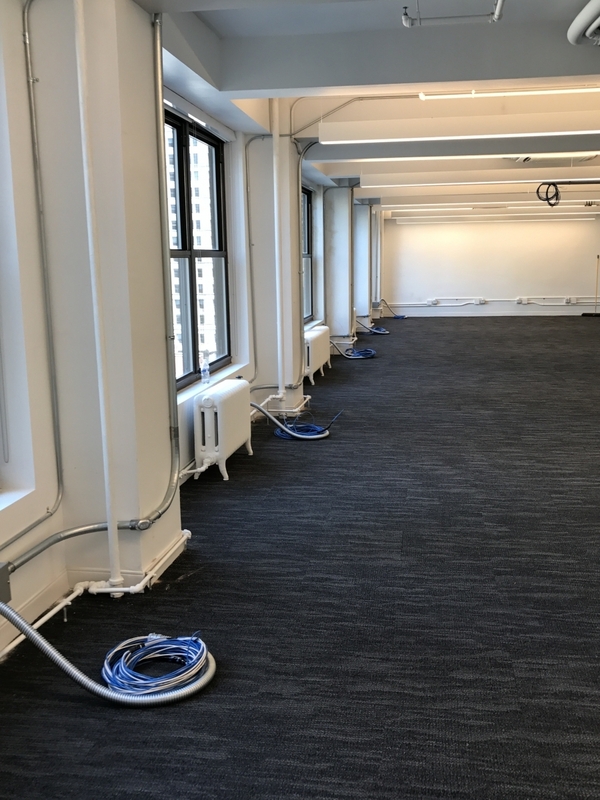 The new office space consisted of 60 voice and data drops, 4 video over IP drops, an access control system and IP cameras for the space. 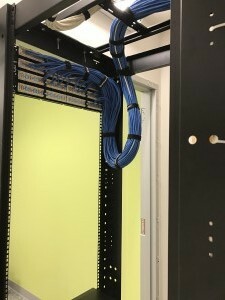 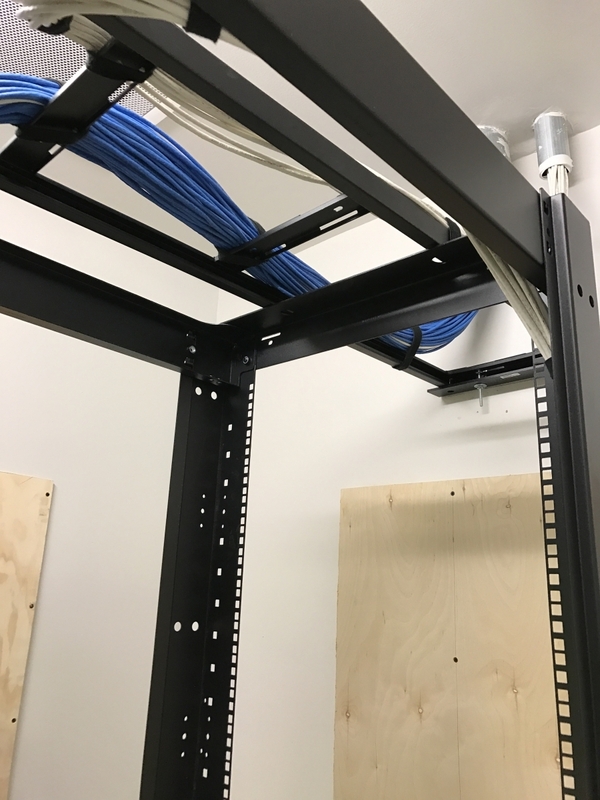 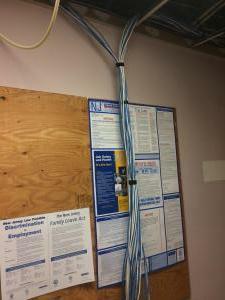 All cabling was run in Cat 6 Plenum to the grounded rack in the storage room. 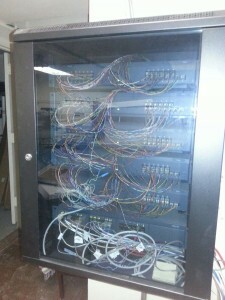 Every drop is tested and labeled for ease of use and to ensure that it is working properly. 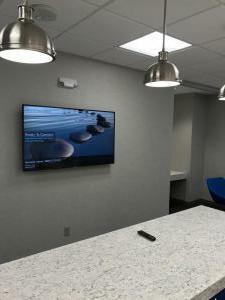 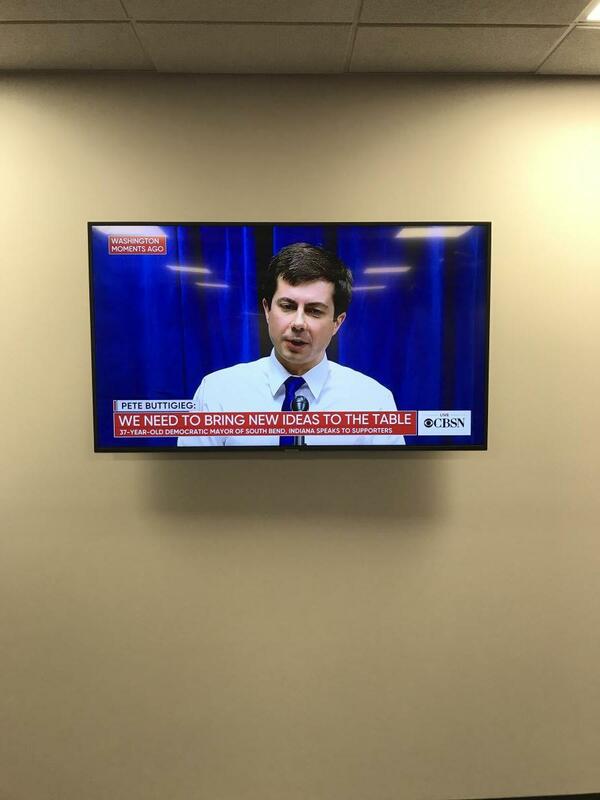 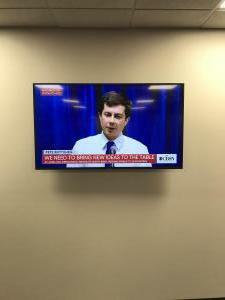 We also installed 4 tv’s throughout the space. 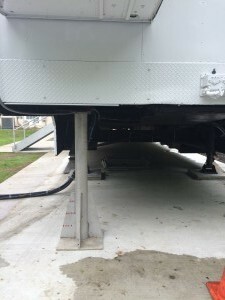 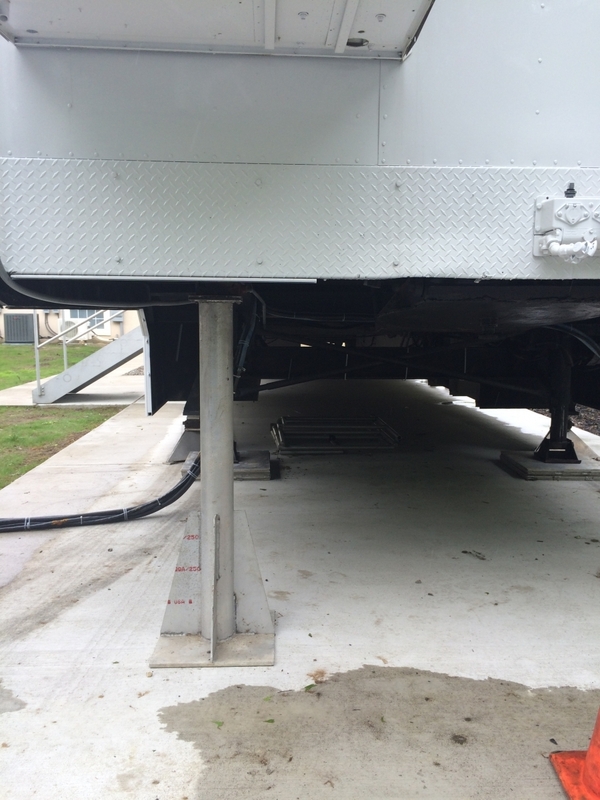 Voice, Data and Video drops to an MRI Trailer in Mt. 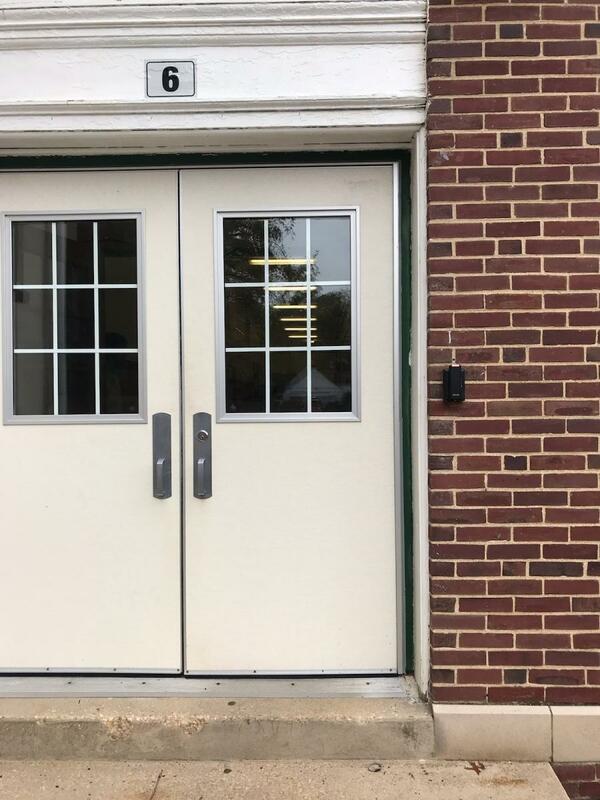 Laurel. 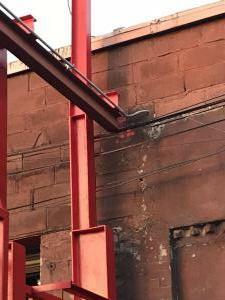 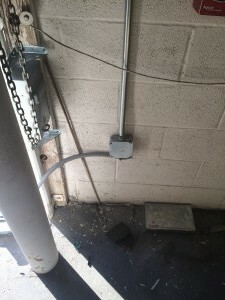 The client needed to light up the trailer so conduit was run from the building underground to just outside the trailer. 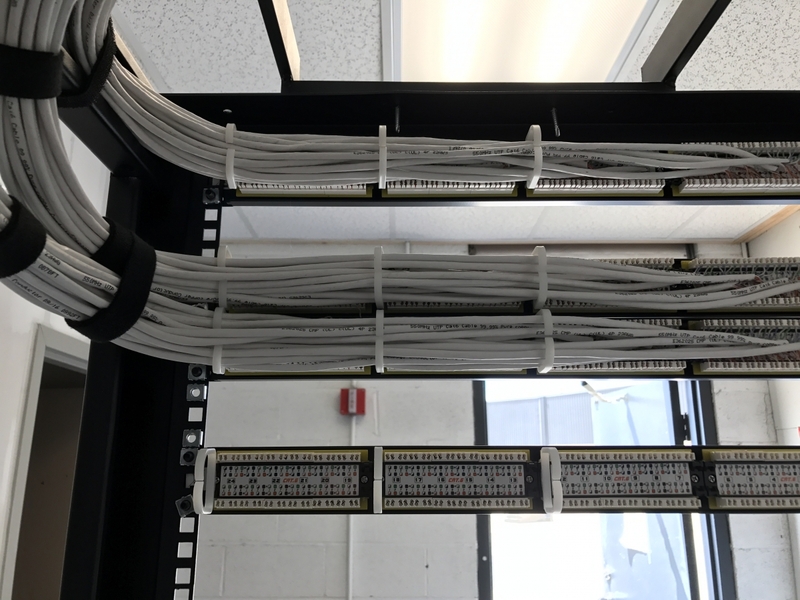 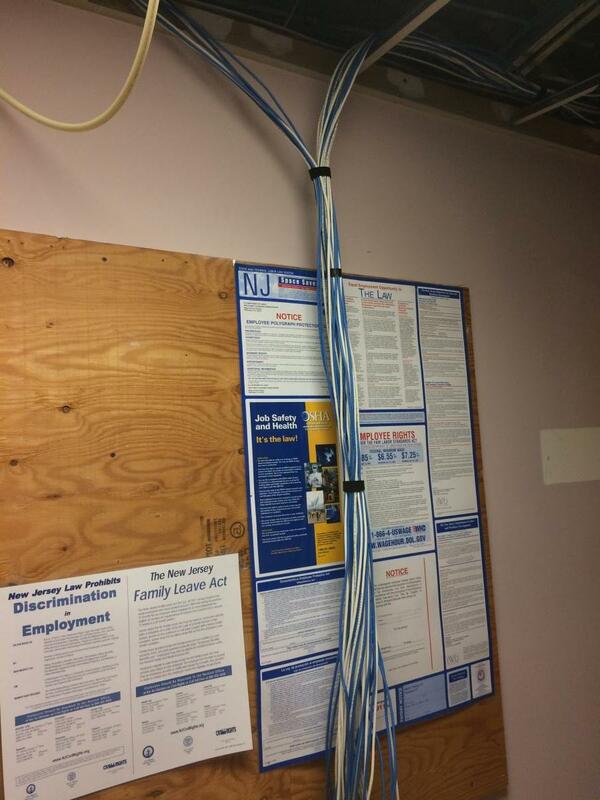 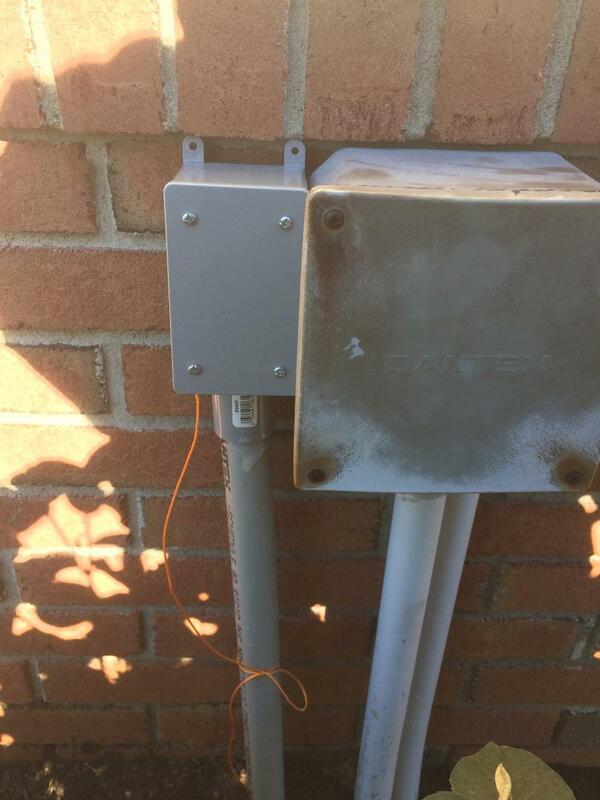 Completed a 150 drop Voice and Data Cabling job for a new customer in NJ. 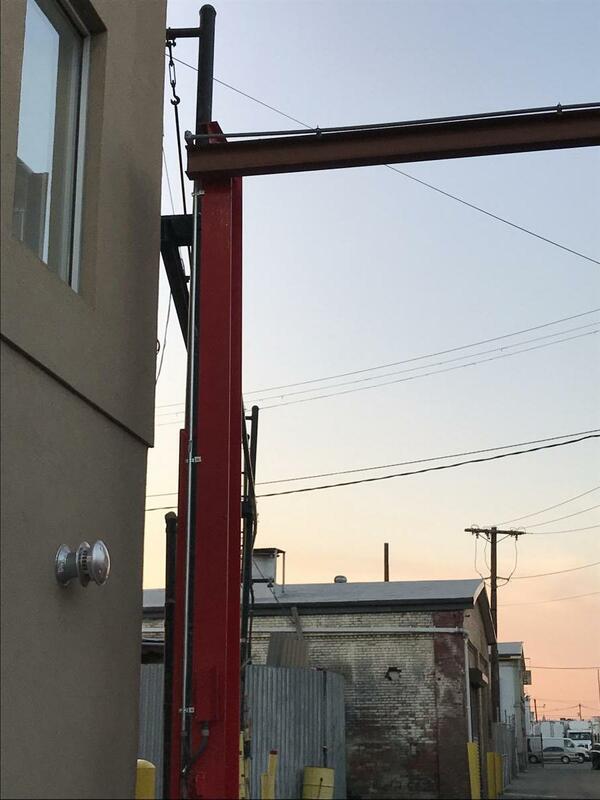 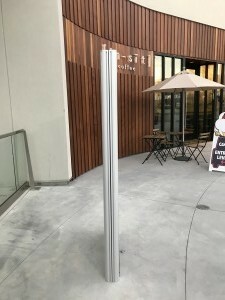 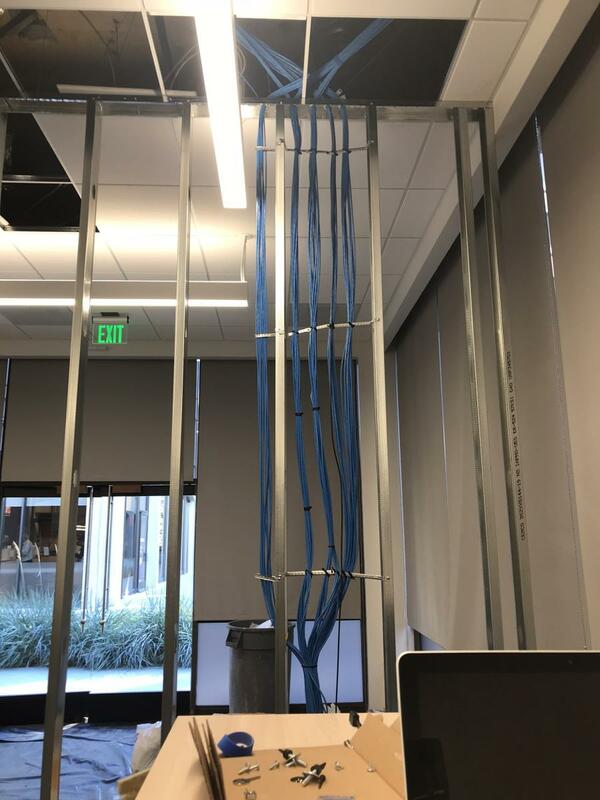 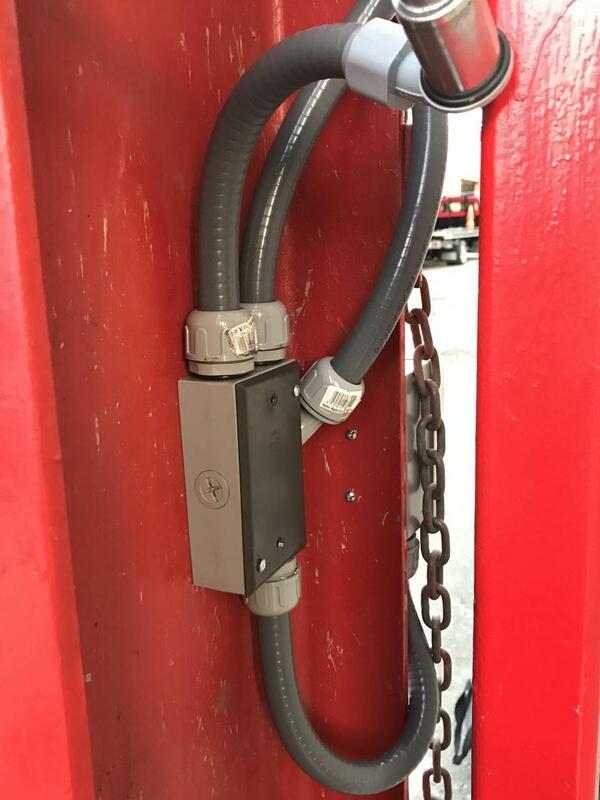 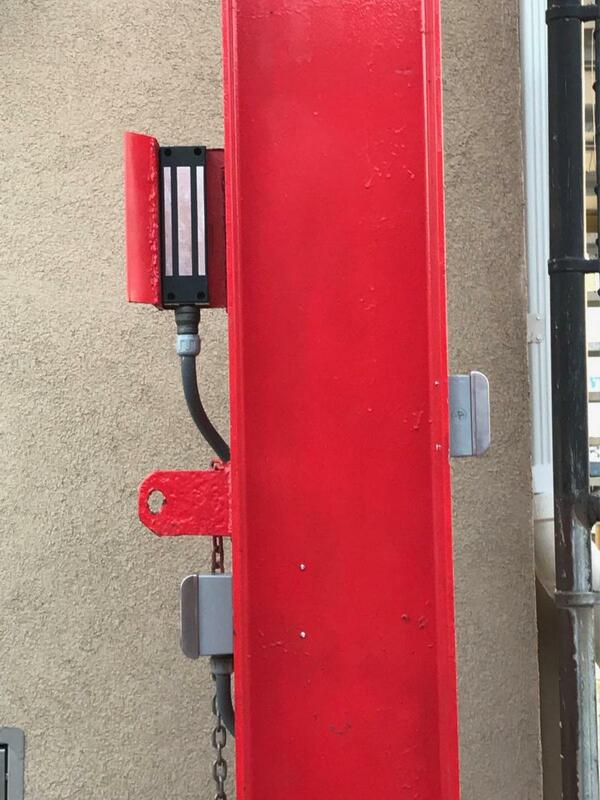 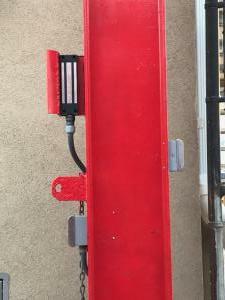 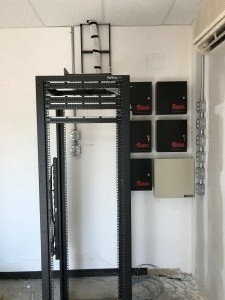 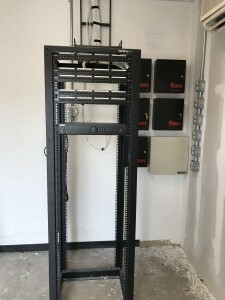 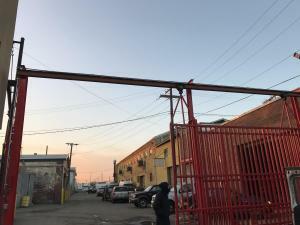 We installed and grounded the 4 post rack and punched down tested and certified all connections. We installed a 32 Camera Surveillance system, Avaya IP office phone system, 16 Door access control system and 16 speaker Bogen intercom system. 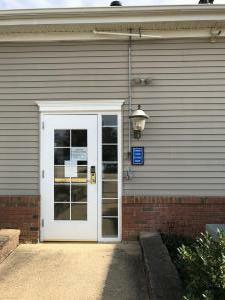 The customer’s office is a 22 thousand square foot office space located in Neptune. 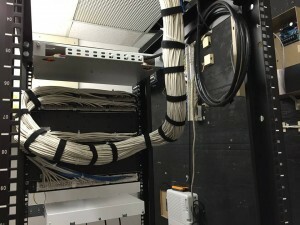 We also cabled the space for voice data and video. 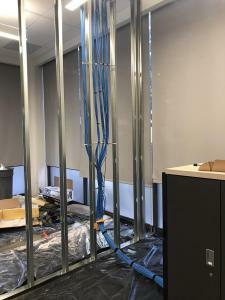 Avaya IP Office installation in Freehold NJ. 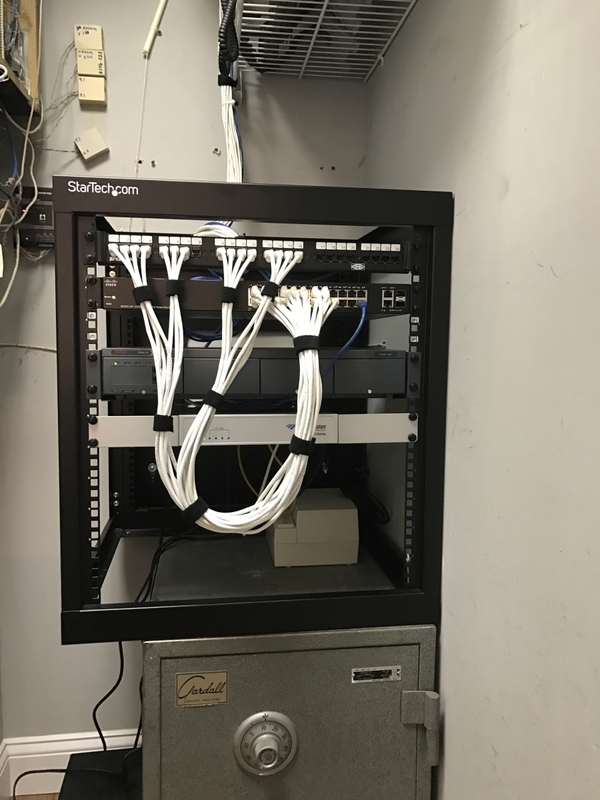 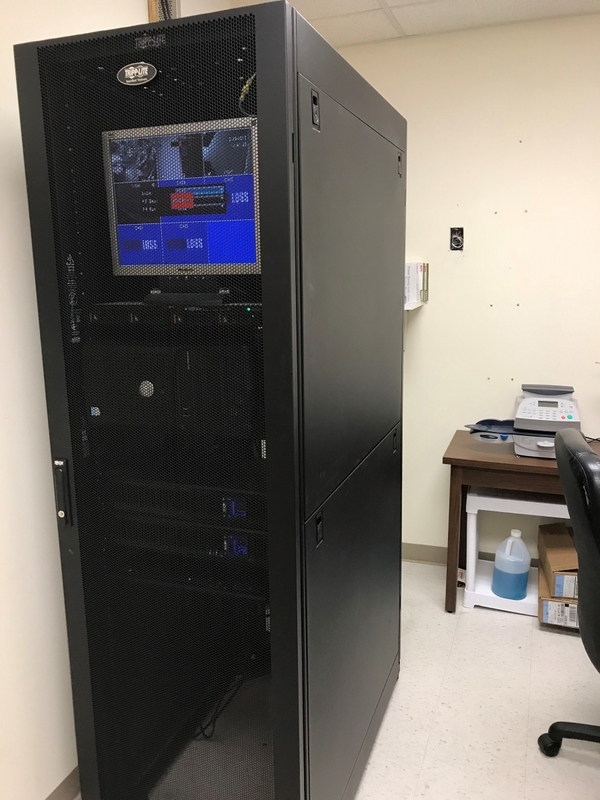 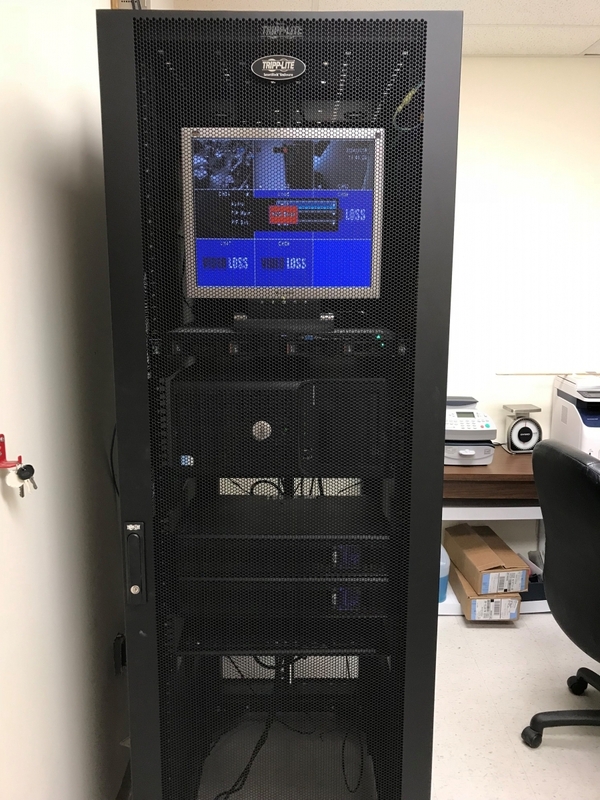 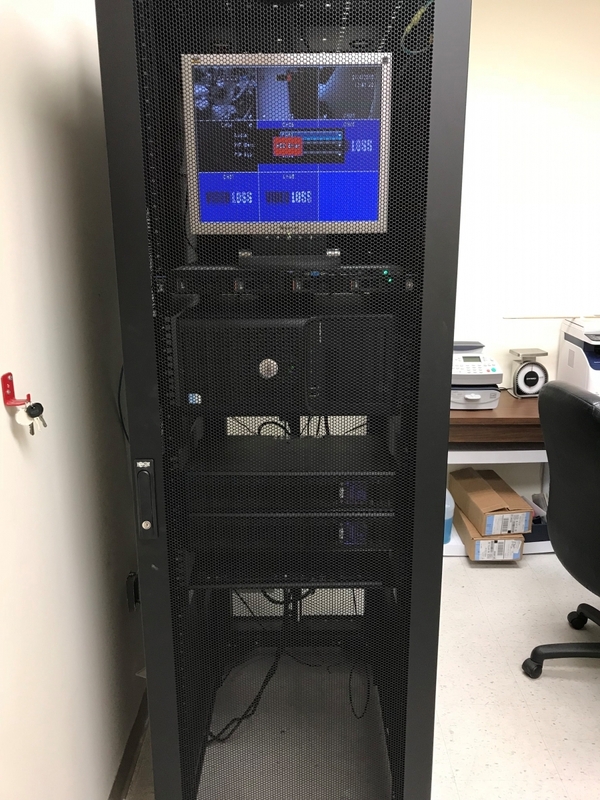 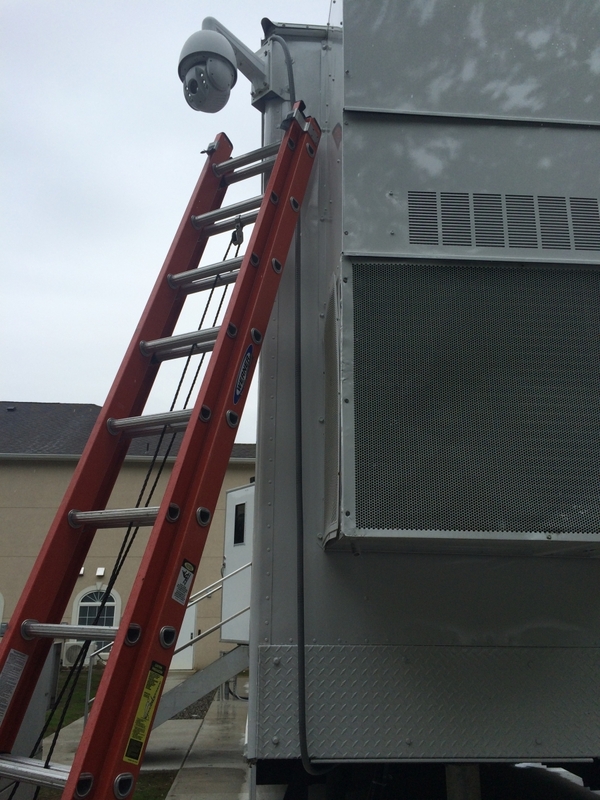 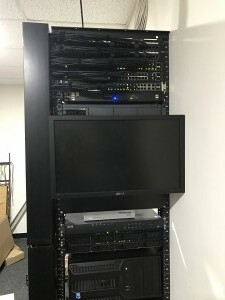 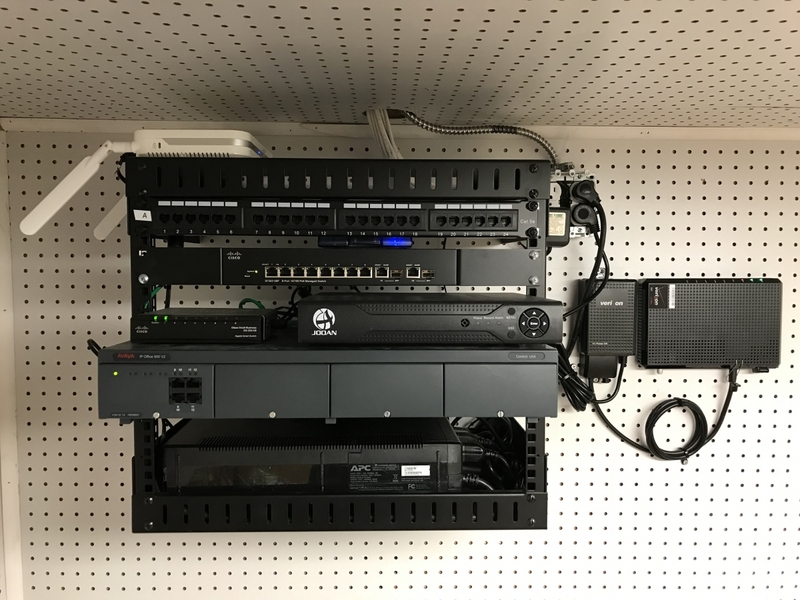 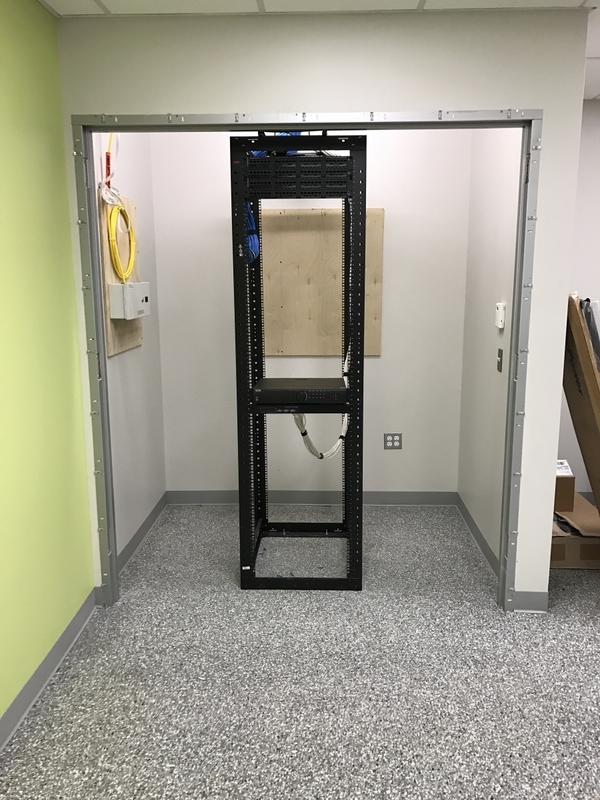 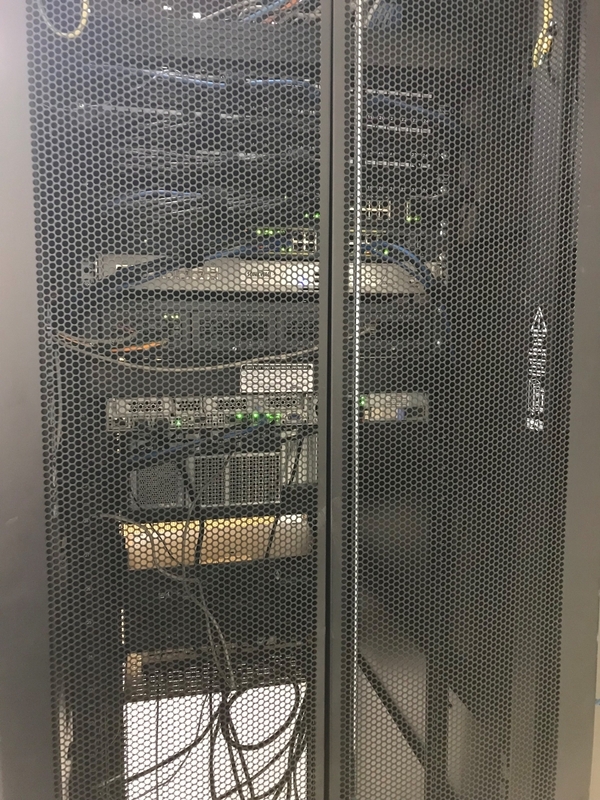 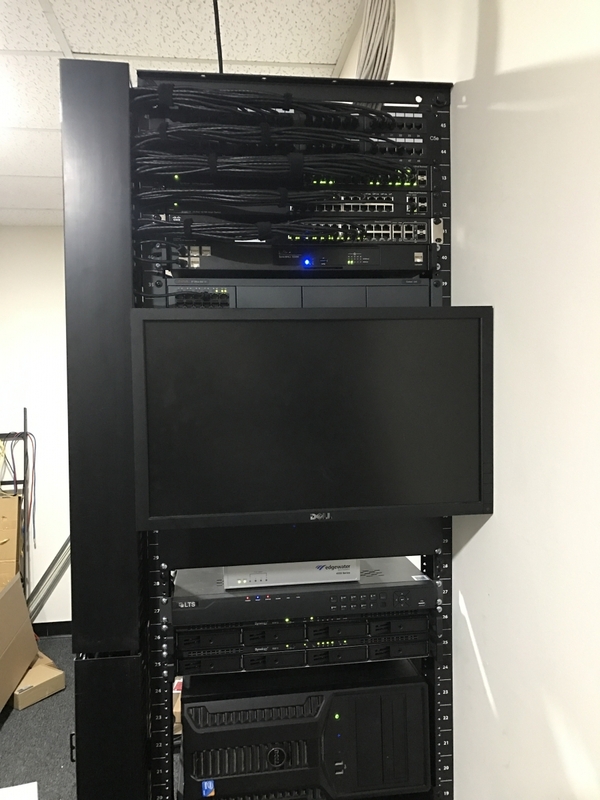 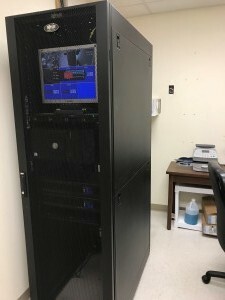 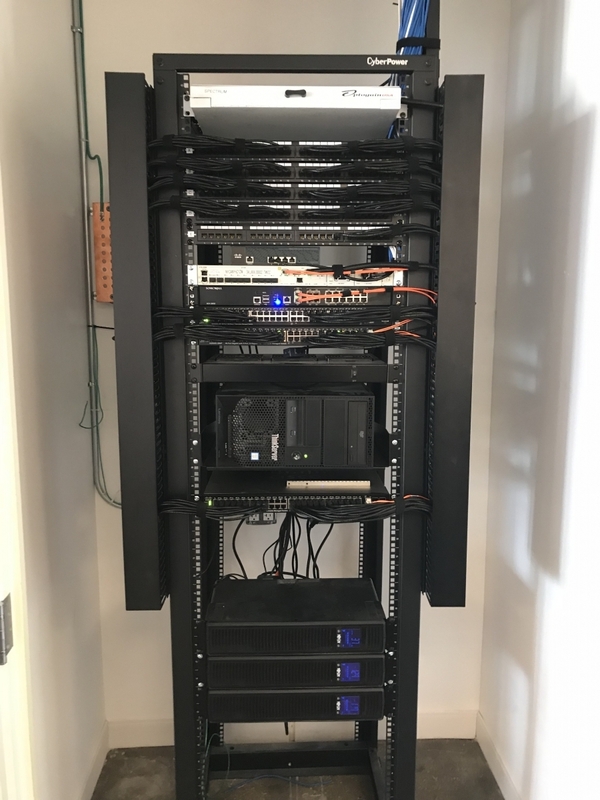 We installed a 4 post APC rack with ladder, ran 90 drops for both Voice / Data, video surveillance and an Isonas access control system. 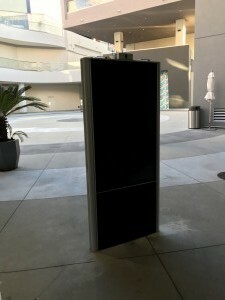 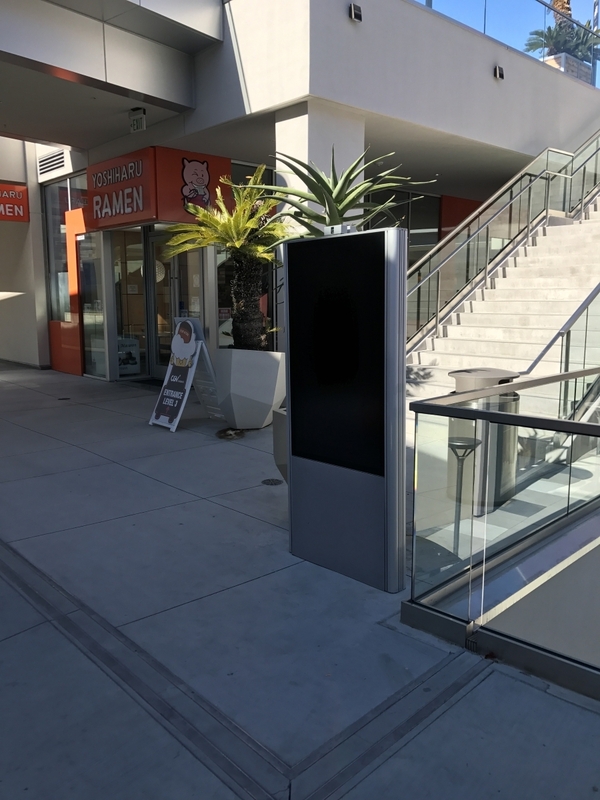 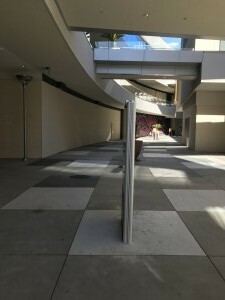 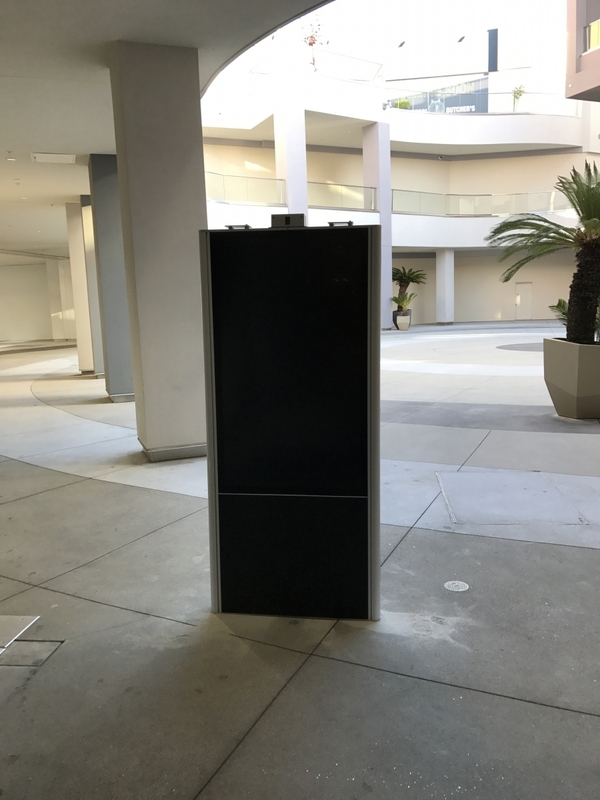 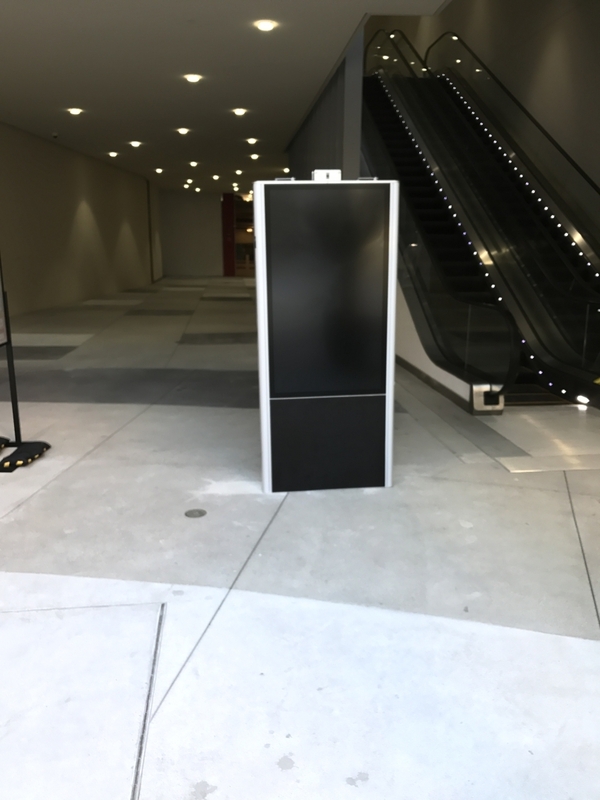 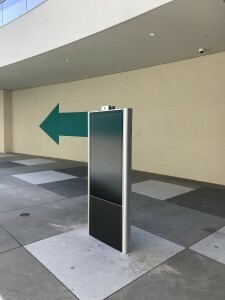 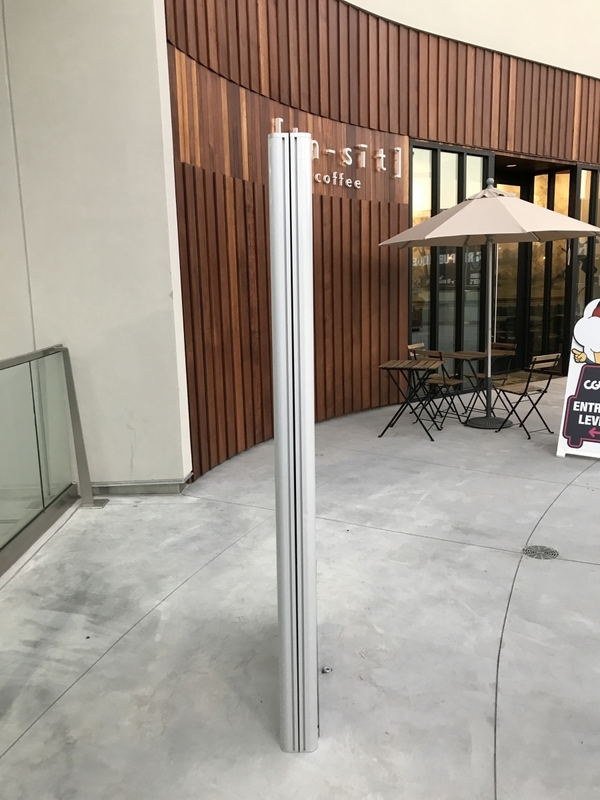 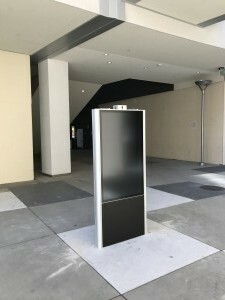 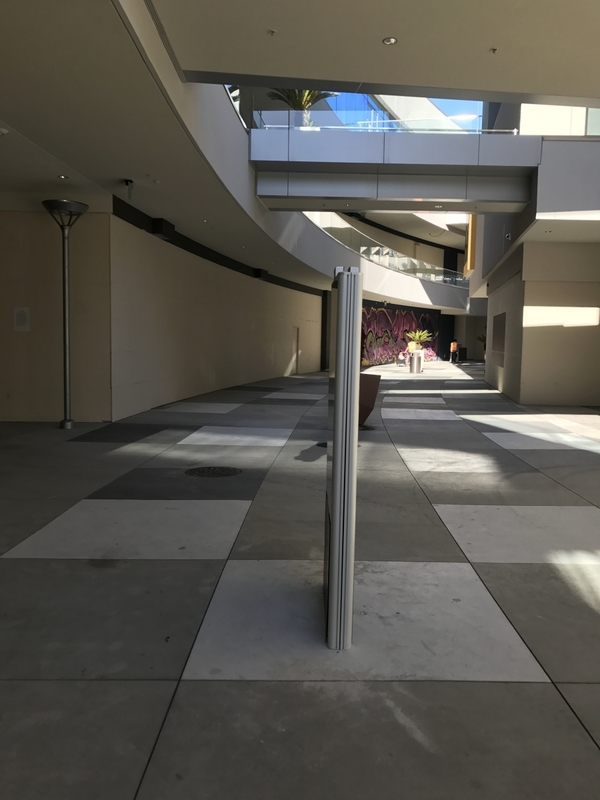 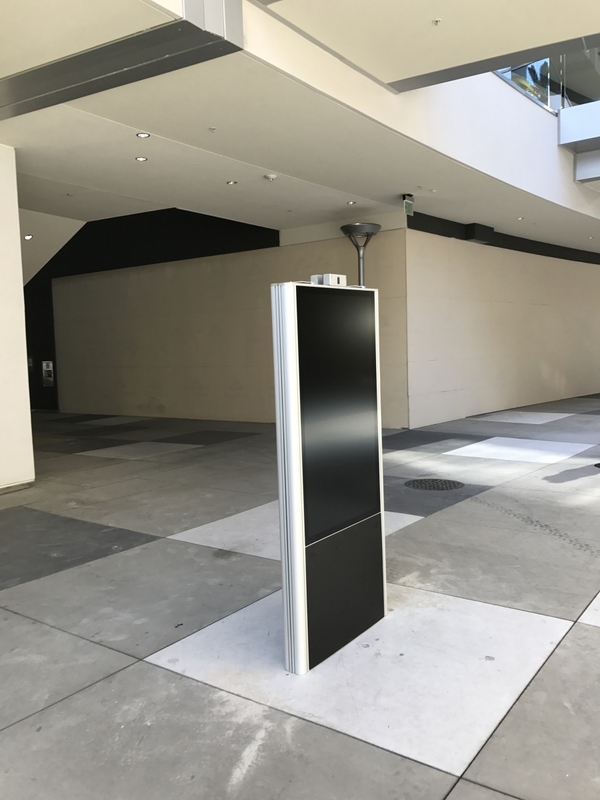 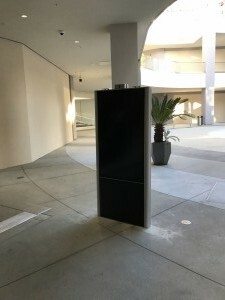 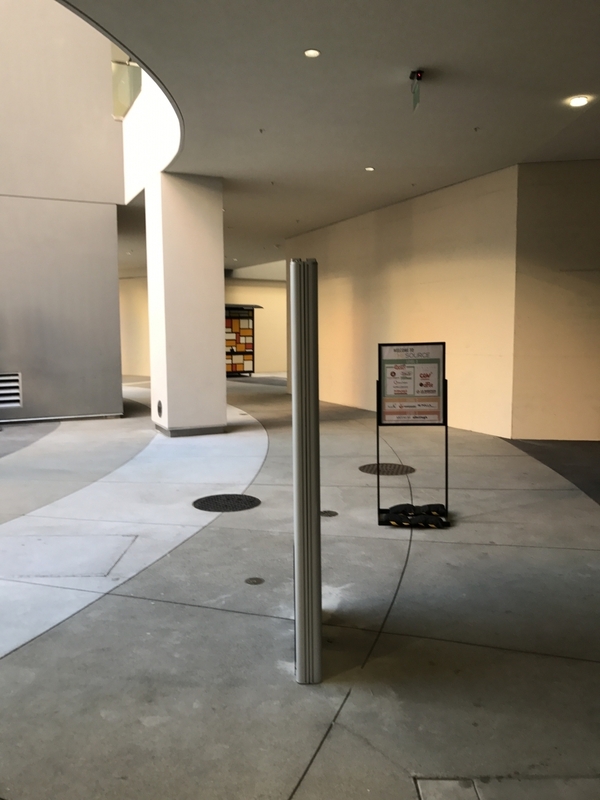 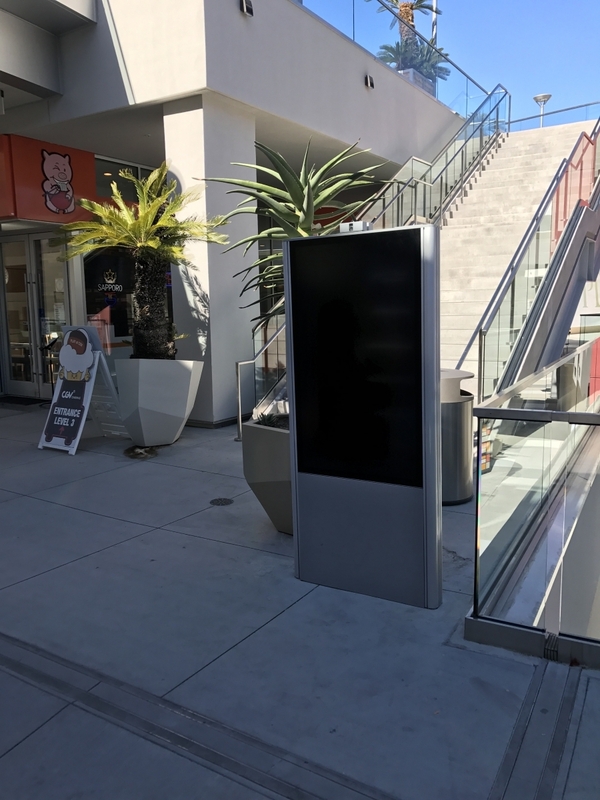 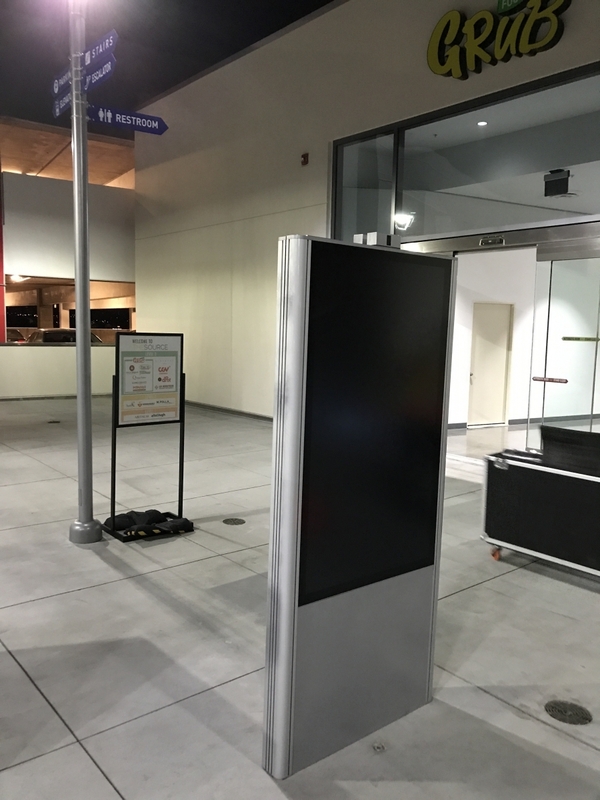 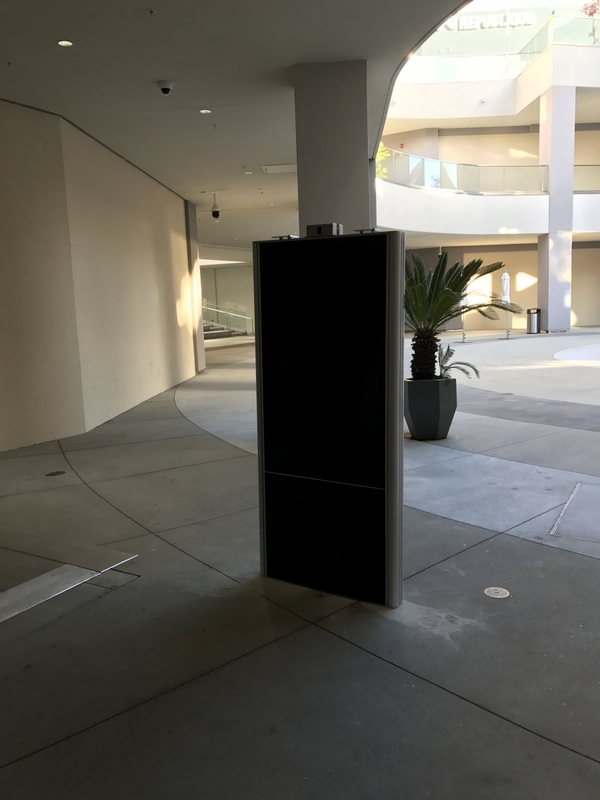 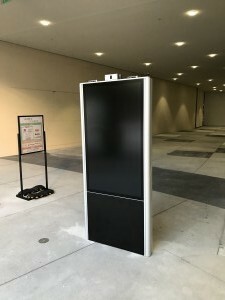 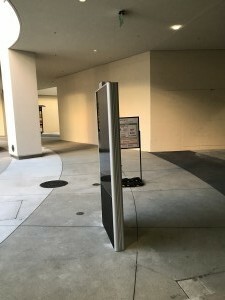 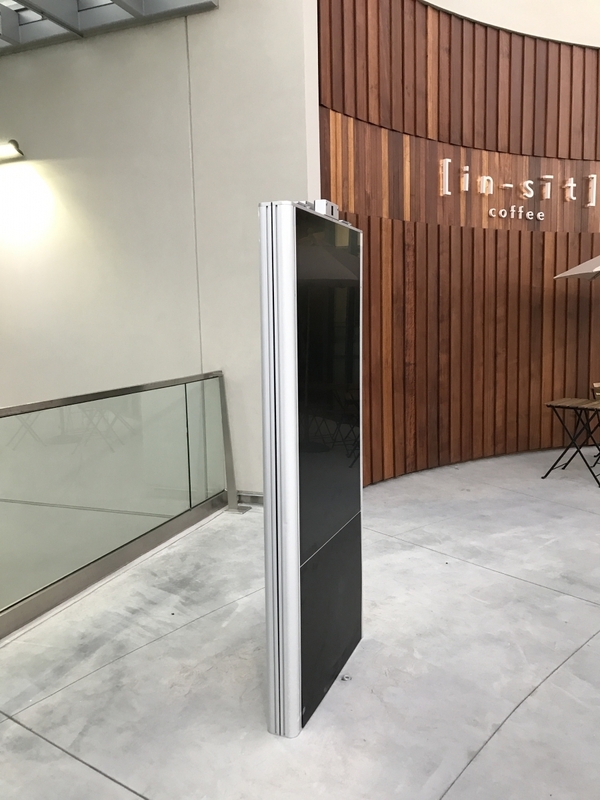 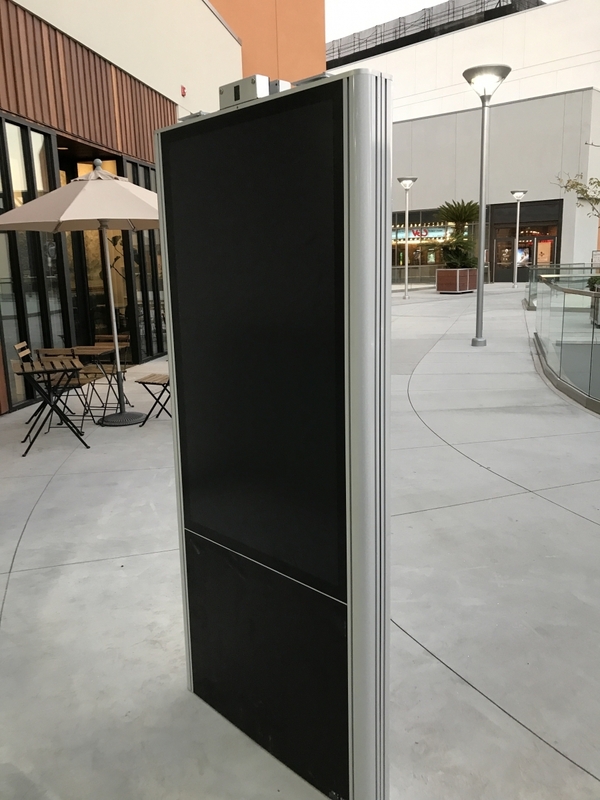 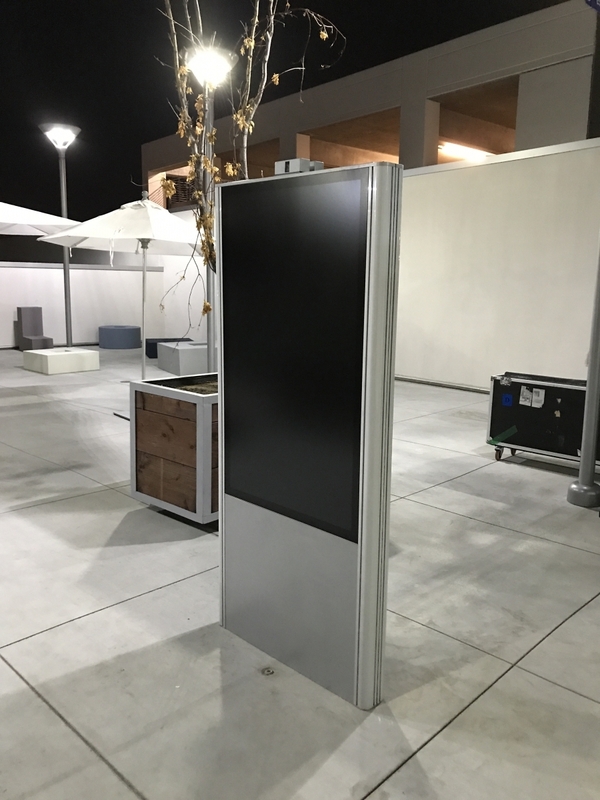 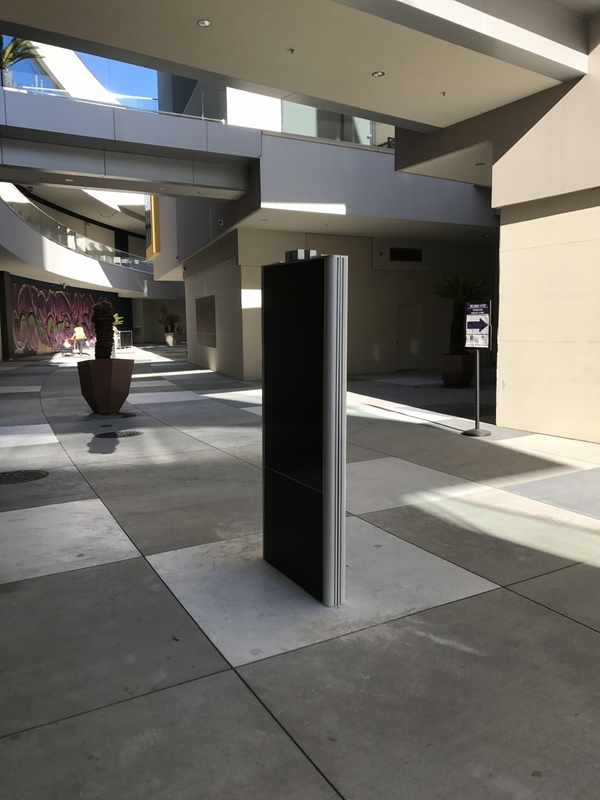 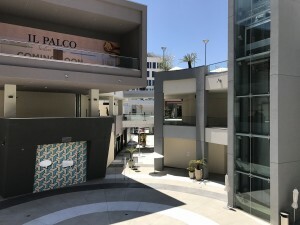 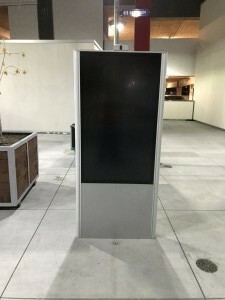 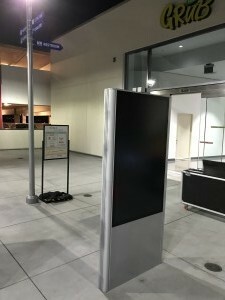 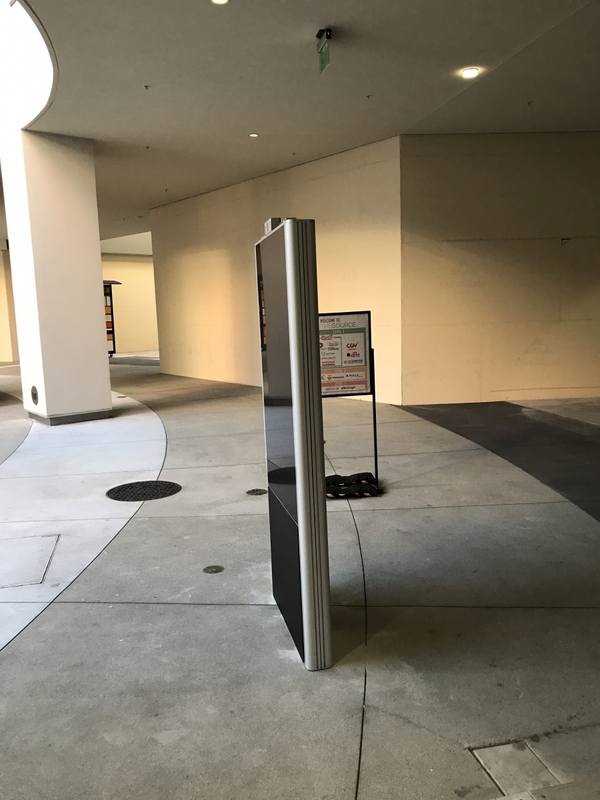 We installed several mall directory kiosks throughout the complex. 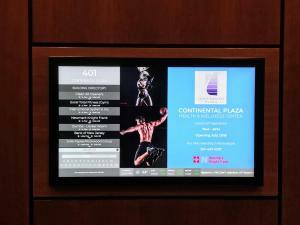 The directories are 55″ double sided touch screens that display a 3D map of the mall floor by floor. The maps have every store and when you choose the store / restaurant you get a description, menu and video of the establishment. 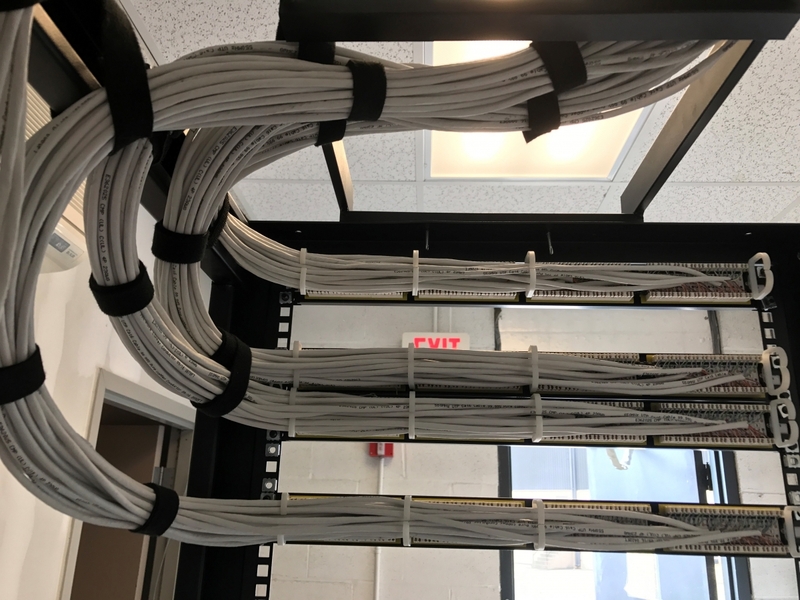 We have installed over 200 Cat6 Plenum network drops, 20 plus fiber drops, a 20 plus IP camera system and an 18 door access control system. 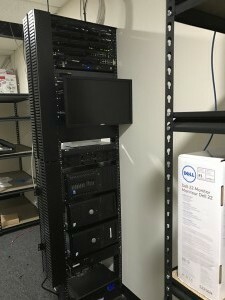 We have mounted all the Cisco network switches, Dell SonicWall routers, 18 gig NVR and servers on a StarTech 4 post rack.